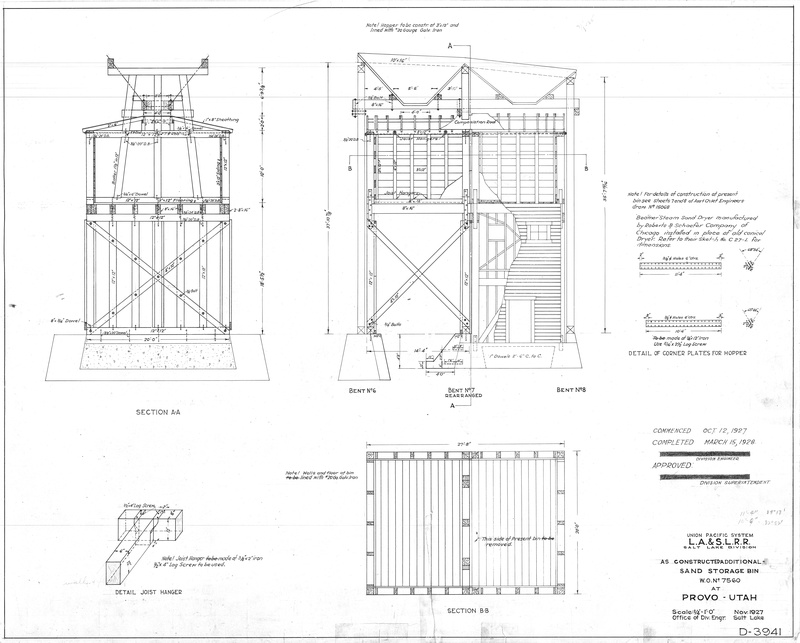 This page was last updated on December 15, 2018. 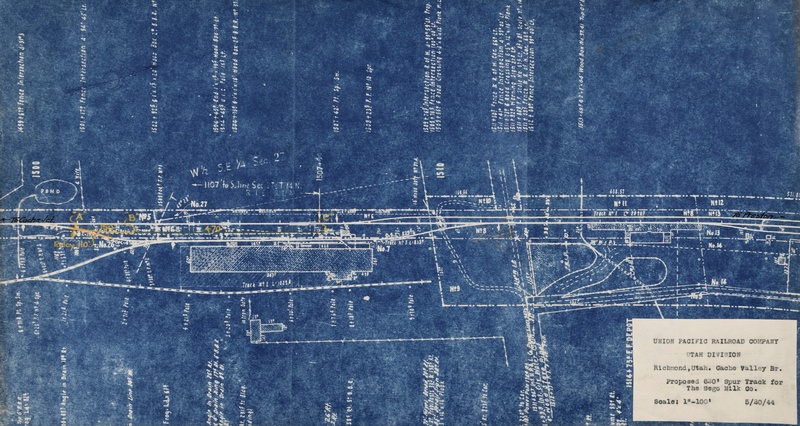 The Don Strack Railroad Map and Drawing Collection contains 277 maps and schematic drawings produced in the 1906 to 1972 time period, showing railroad trackage, facilities and structures for railroads in the State of Utah. 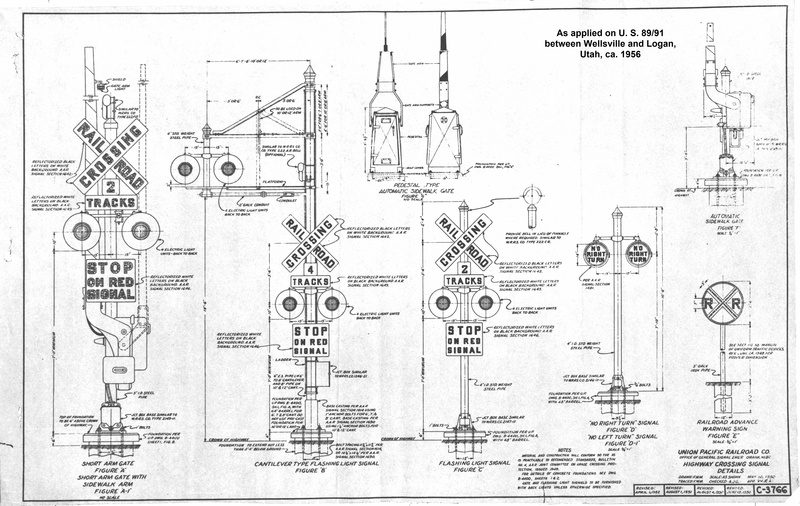 The collection concentrates on Union Pacific subjects (depots, station tracks, etc. 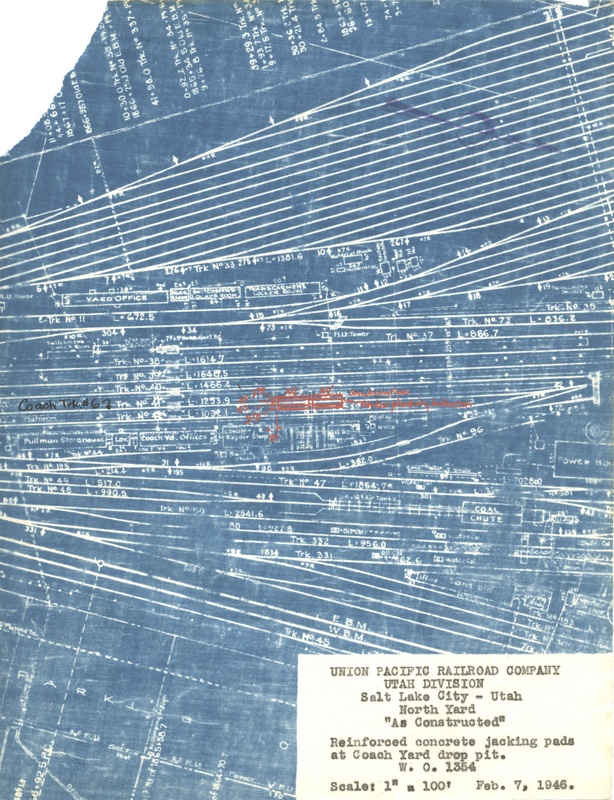 ), but includes maps from other railroads no longer in existence in Utah. 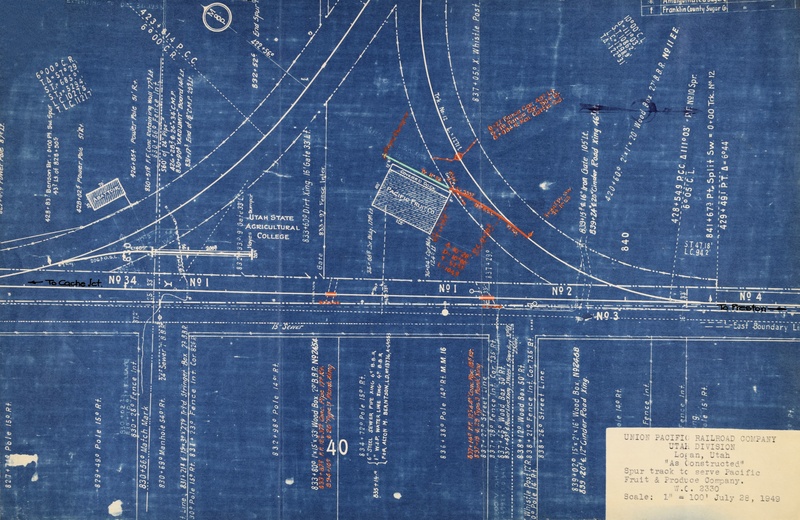 The collection includes maps and schematics of street railroads in Salt Lake City and vicinity. 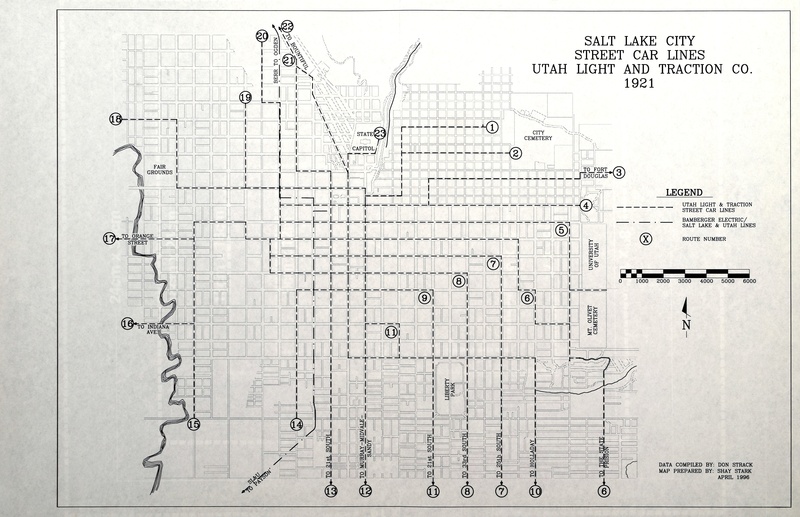 The majority of the drawings and maps were collected in the 1980-1985 time period, with a concentration of drawings obtained when Union Pacific closed its engineering office in Salt Lake City in 1983, as well as closing other offices prior to donating its Salt Lake City depot to the State of Utah in 1989. 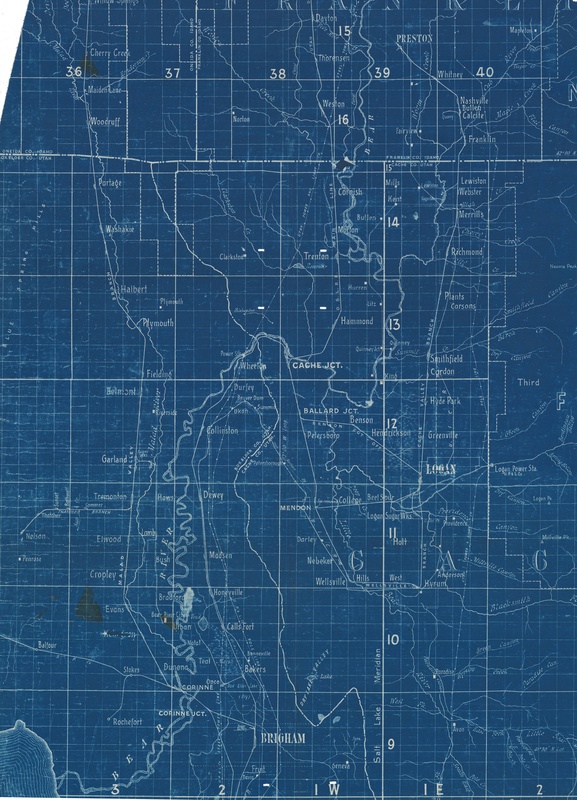 The actual physical maps have been donated to University of Utah Special Collections. 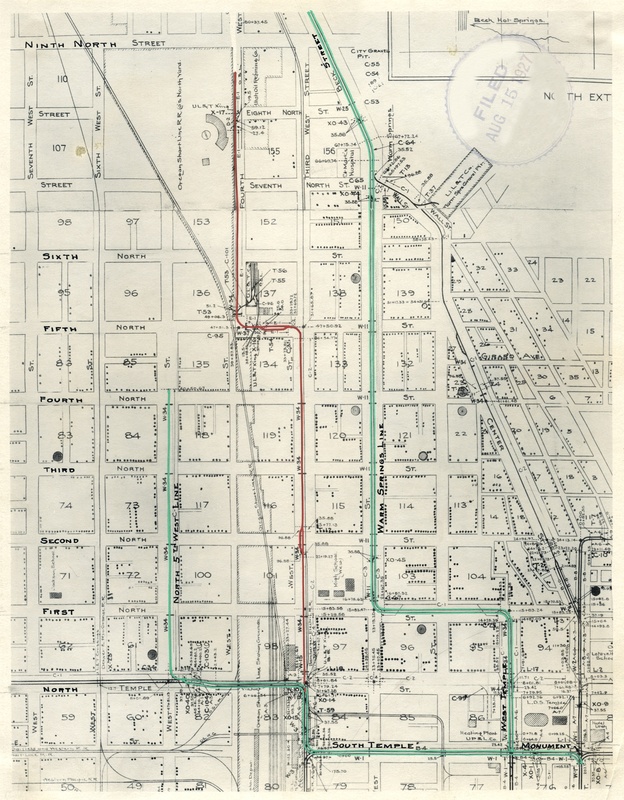 Ballard & Thompson RR -- (15.18 MB) (12.99 x 31.53) --- A map of the entire route. 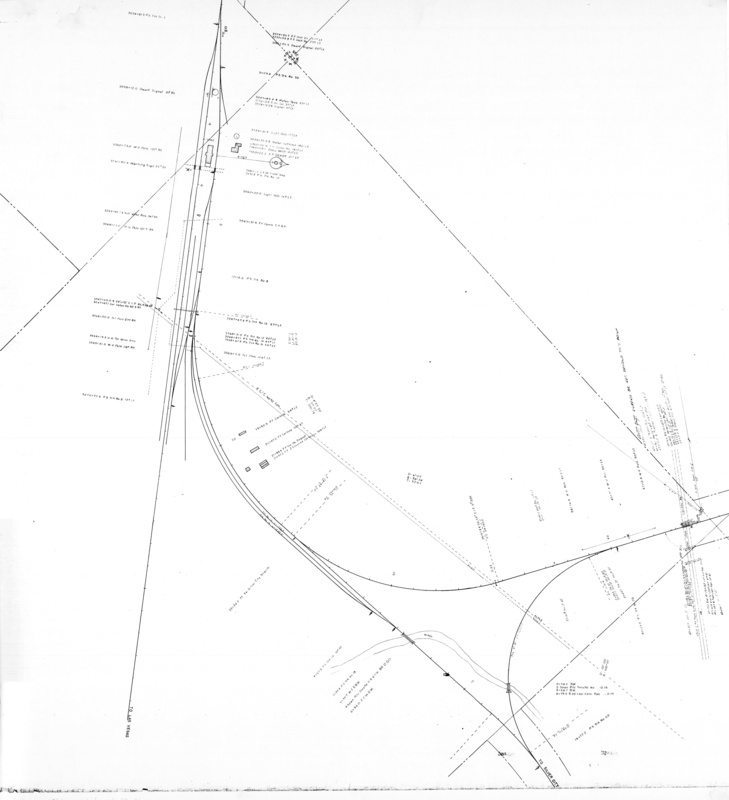 Bamberger, Cherry Hill -- (12.41 MB) (21.3 x 17.73) --- Shows the Bamberger tracks and early roads at the Cherry Hill intersection. 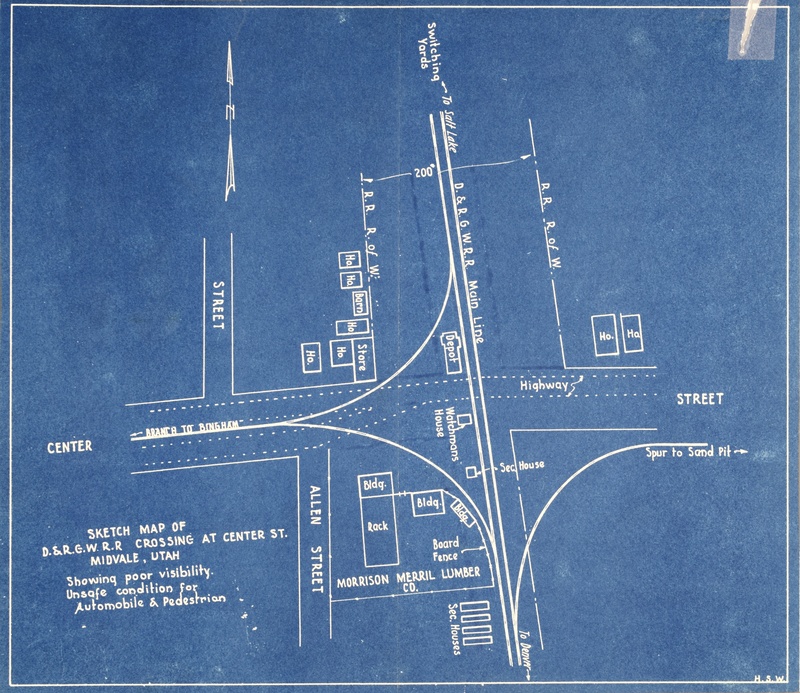 Bamberger, Cherry Hill crossing -- (27.12 MB) (21.45 x 32.31) --- Shows the Bamberger tracks and roads at the Cherry Hill intersection after U. S. 89 and 91 were built. 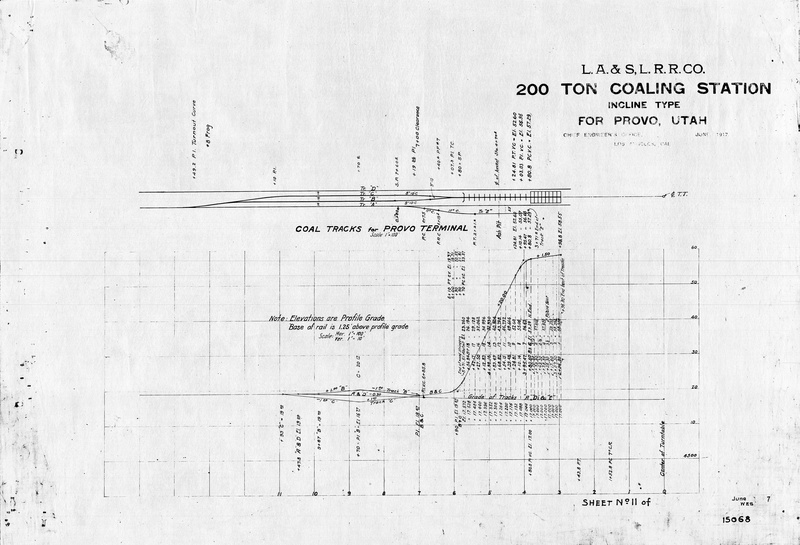 Bamberger, Farmington road change -- (14.10 MB) (27.99 x 12.34) --- Shows the balloon track for Lagoon trains. 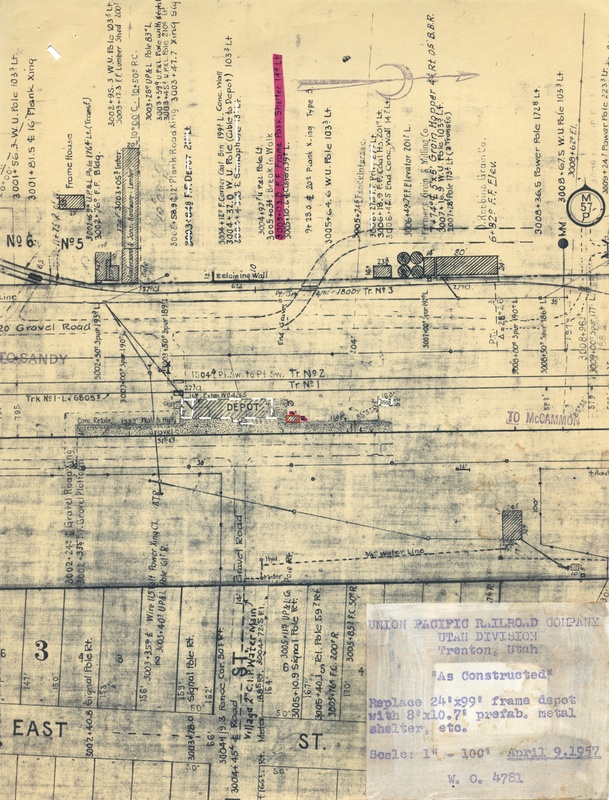 Bamberger, Kaysville, 1919 -- (11.78 MB) (23.87 x 15.87) --- Shows the Kaysville station tracks in 1919. 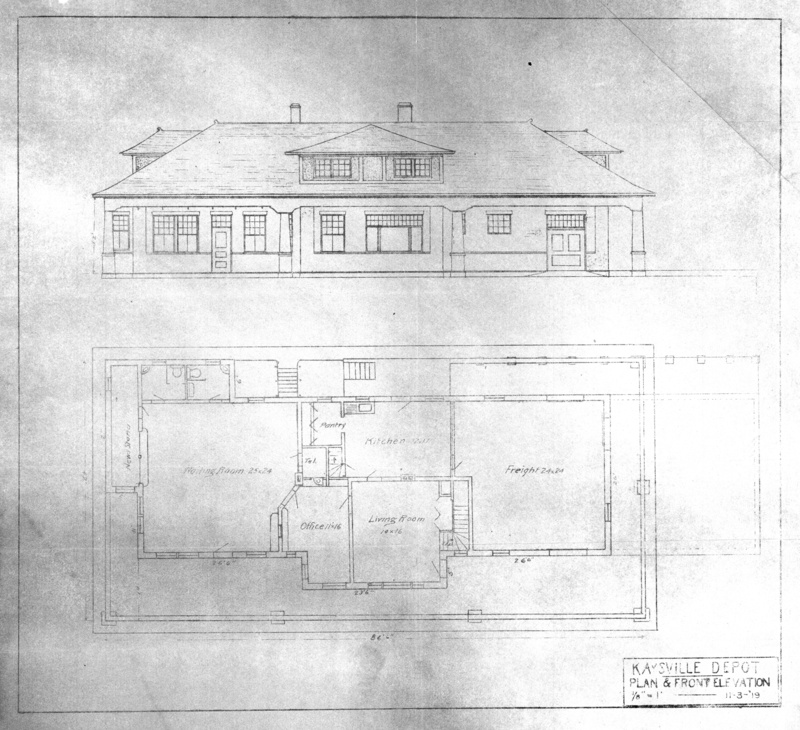 Bamberger, Kaysville depot, 1919 -- (11.32 MB) (14.6 x 16) --- Plan and elevation of the Kaysville depot building. 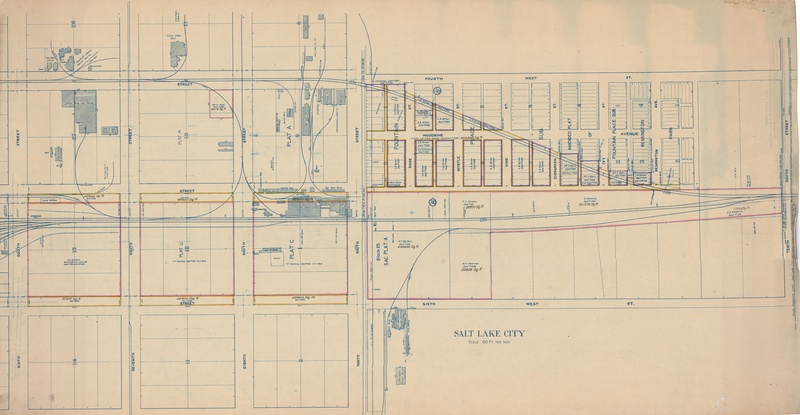 Bamberger, Salt Lake City, 1946 -- (33.52 MB) (40.87 x 18.26) --- Shows the "Central Industrial District" in Salt Lake City in 1946. 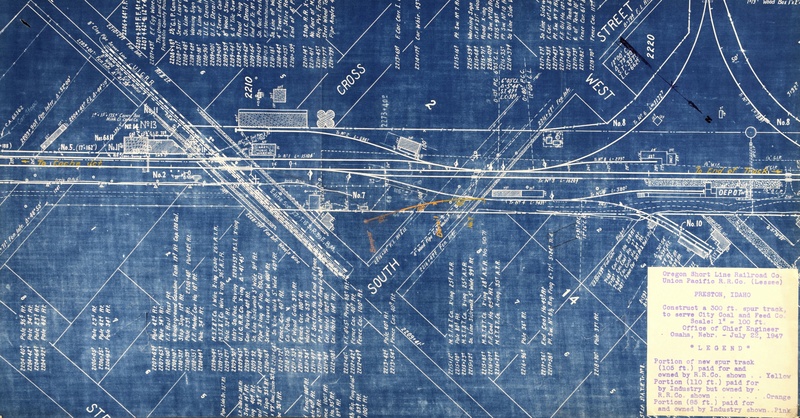 Bamberger, Salt Lake City to Davis line, 1909, sheet 1 -- (38.80 MB) (18.85 x 73.6) --- Shows all of the tracks between Fourth South and the UP roundhouse at Ninth North. 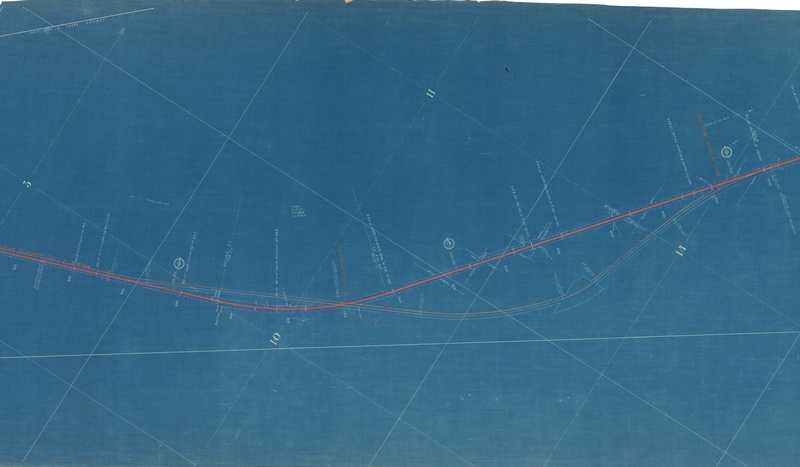 Bamberger, Salt Lake City to Davis line, 1909, sheet 2 -- (47.00 MB) (18.85 x 70.52) --- Shows all of the tracks between UP roundhouse at Ninth North and the Davis County line. 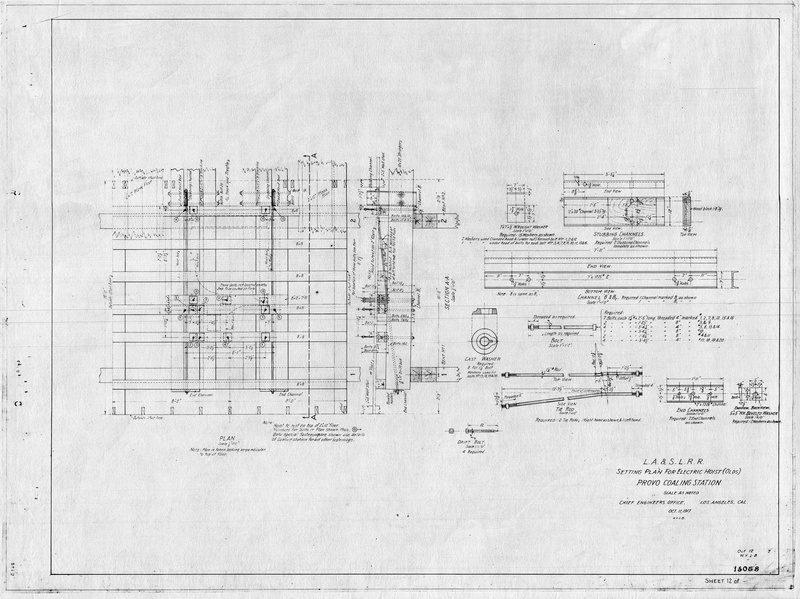 Bamberger Electric RR, System Map -- (5.60 MB) (19.18 x 10.06) --- A map of the complete Bamberger system. 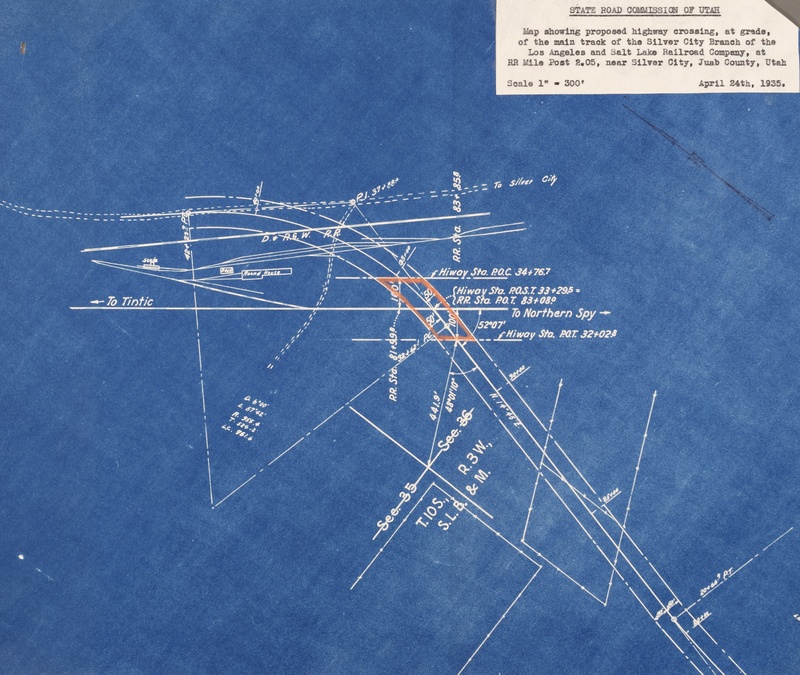 Bingham, Track Map, 1914 -- (50 MB) (58.6 x 36.00) --- Track schematic of the tracks in the Bingham Canyon open pit mine in 1914, including the Boston Consolidated ore tramway. 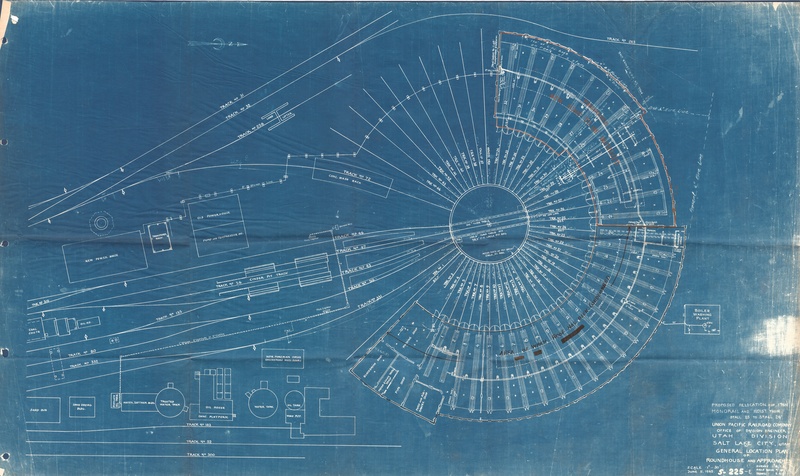 Bingham, Track Map, 1932 -- (29.9 MB) (36.00 x 55.1) --- Track schematic of the tracks in the Bingham Canyon open pit mine in 1932. 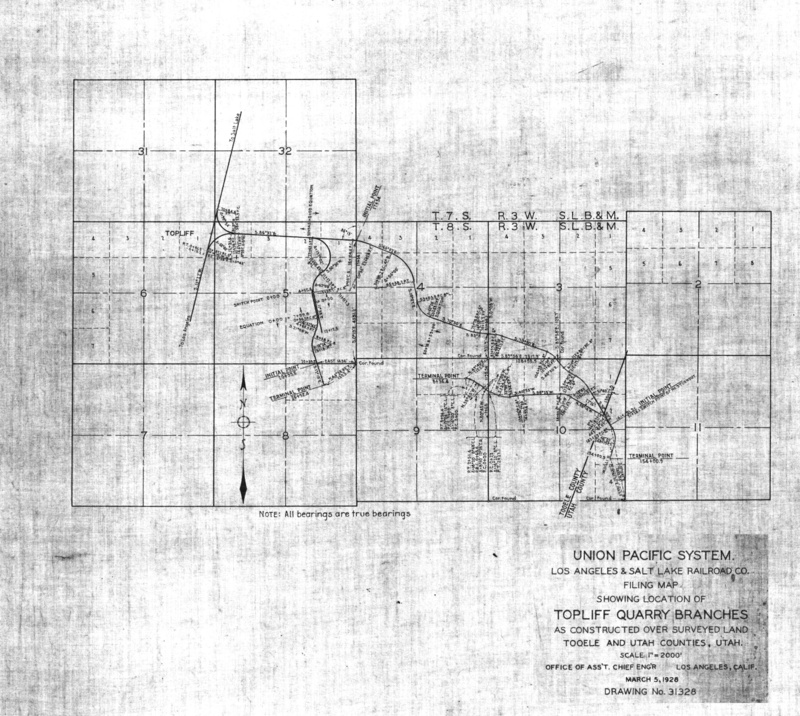 Bingham, Track Map, 1947 -- (49.9 MB) (36.00 x 80.8) --- Track schematic of the tracks in the Bingham Canyon open pit mine in 1947; shows 6040 tunnel and D&RGW depot. 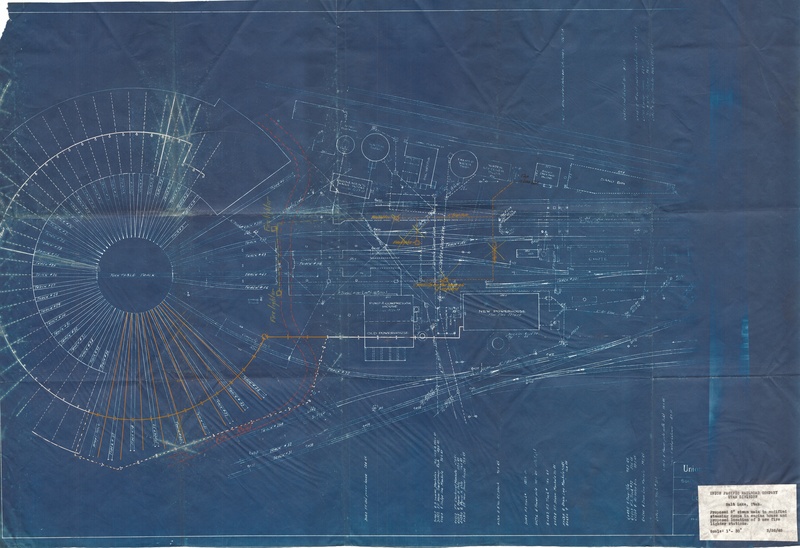 Bingham, Track Map, 1954 -- (15.9 MB) (36.00 x 68.2) --- Track schematic of the tracks in the Bingham Canyon open pit mine in 1954; shows 6040 and 5840 tunnels, C-C Line and Dry Fork shops. 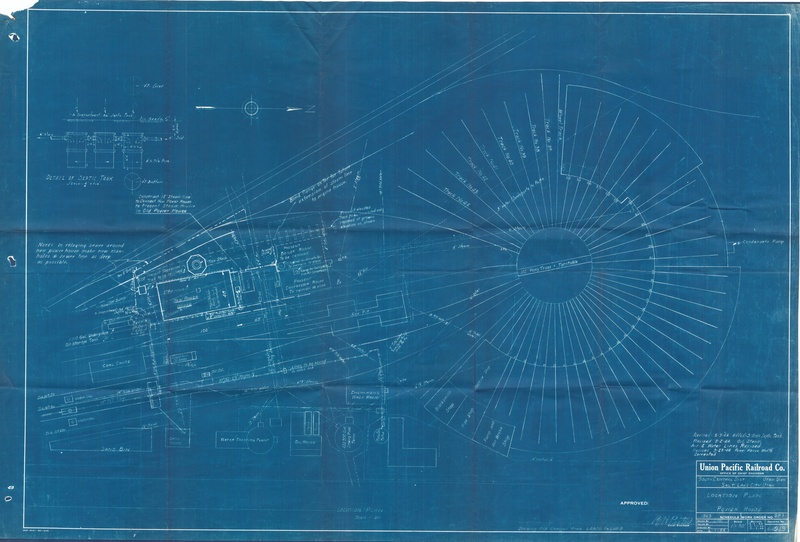 Bingham, Track Map, 1962 -- (36.9 MB) (36.00 x 78.5) --- Track schematic of the tracks in the Bingham Canyon open pit mine in 1962; shows 6040, 5840, and 5490 tunnels. 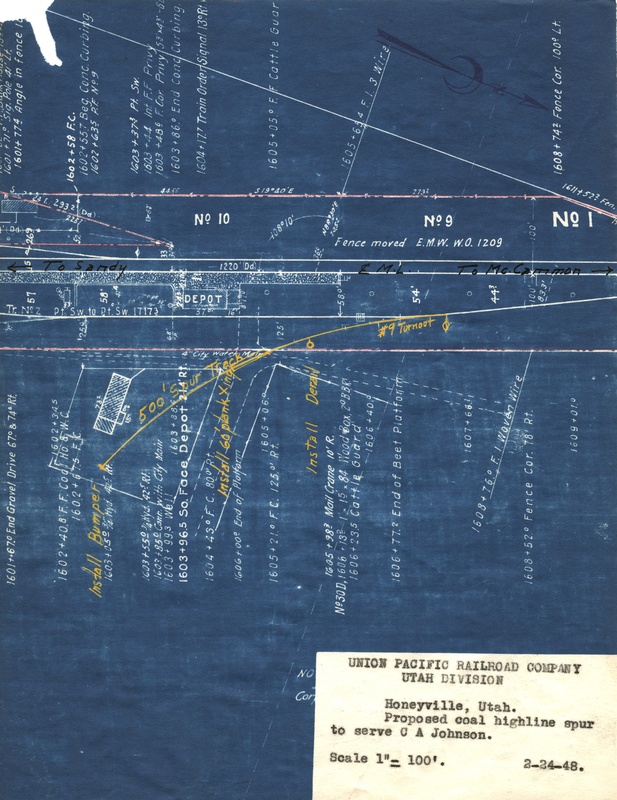 Bingham, Copperton Line -- (20.39 MB) (36.00 x 49.8) --- Shows track route between Bingahm and Magna, including retired Bingham & Garfield line, and the new Copperton Low Line. 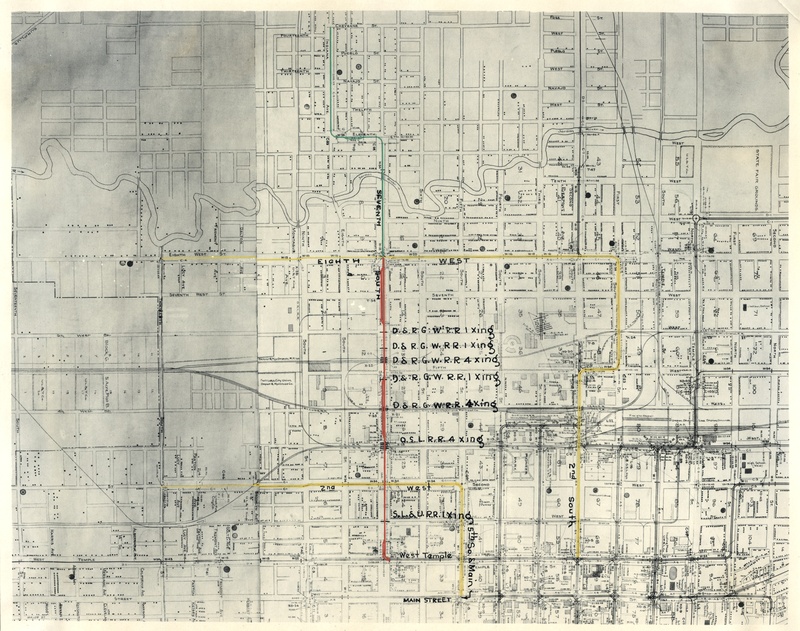 Bountiful, streetcar bus lines, 1928 November -- (4.36 MB) (18.39 x 8.45) --- Shows the bus routes and street car route in Davis County. 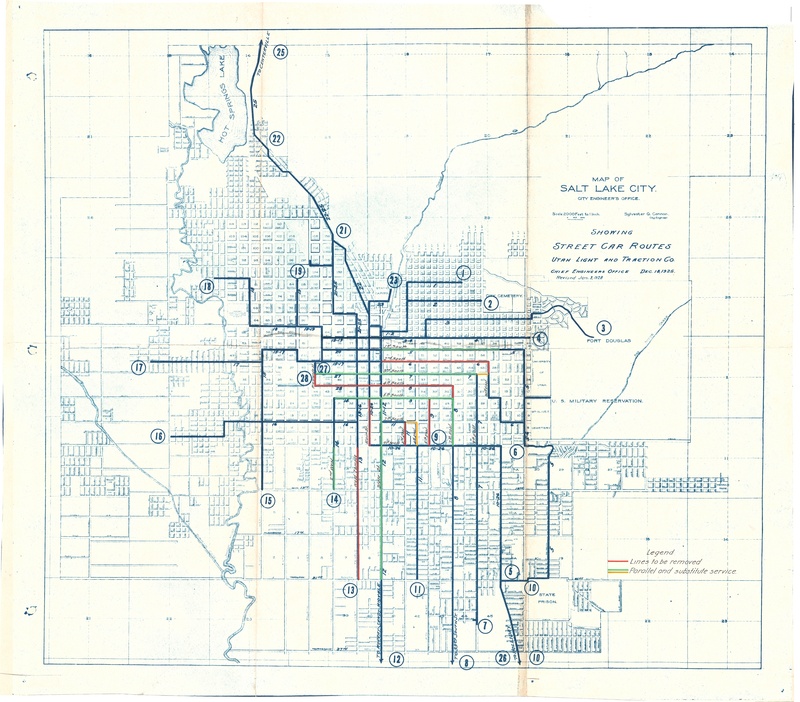 Bountiful, streetcar bus lines, 1932 February -- (3.72 MB) (18.57 x 8.24) --- Shows the bus routes and street car route in Davis County. 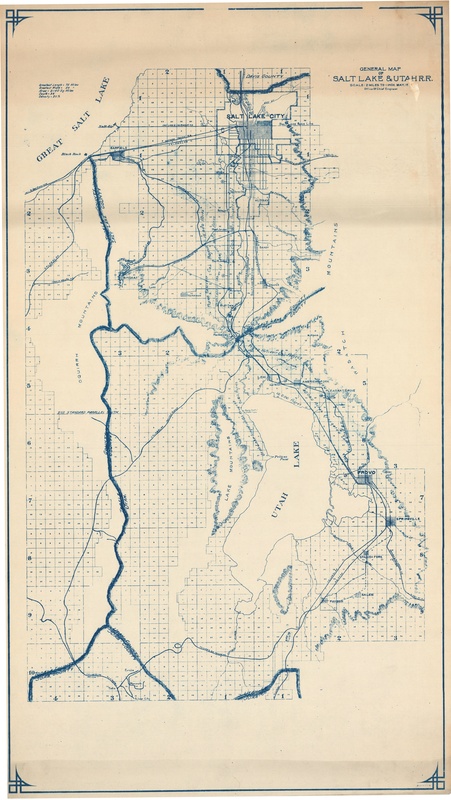 Cache Valley railroads -- (15.72 MB) (23.25 x 16.76) --- Shows all of the rail lines in Cache Valley. 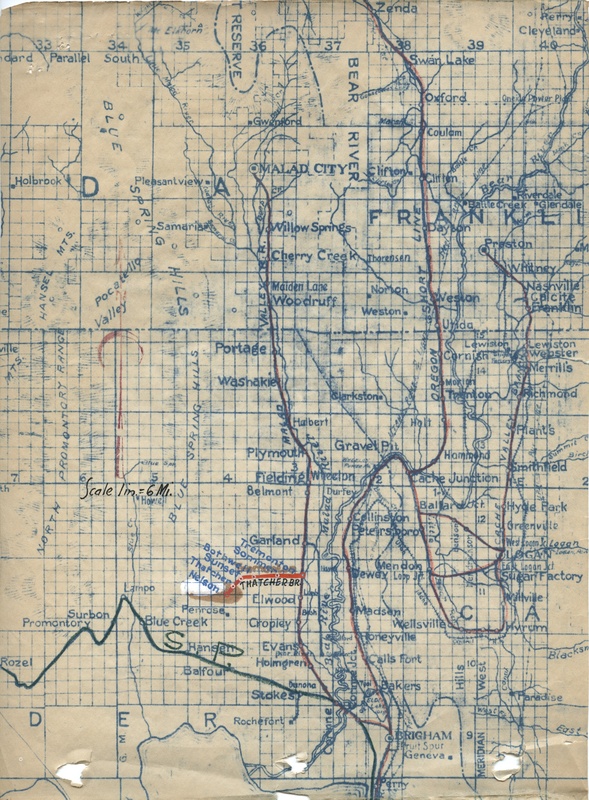 D&RG, Salt Lake City, 1917, sheet 1 -- (19.97 MB) (19.69 x 41.69) --- Shows all of the tracks between the Davis County line, south to North Temple street. 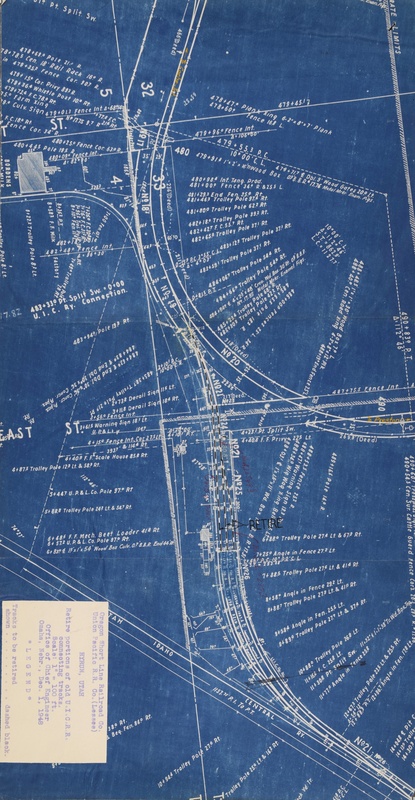 D&RG, Salt Lake City, 1917, sheet 2 -- (21.46 MB) (19.93 x 39.15) --- Shows all of the rail lines between North Temple street and Sixth South street, including the D&RGW roundhouse and depot; all before Grant Tower. 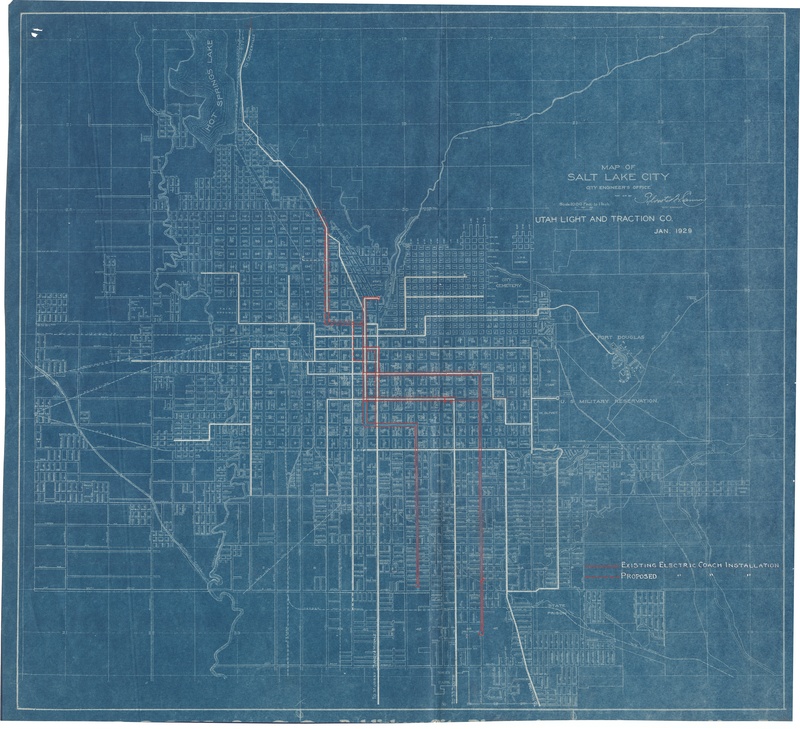 D&RG, Salt Lake City, 1917, sheet 3 -- (15.50 MB) (19.29 x 37.2) --- Shows all the rail lines between Sixth South and "Tenth" (13th) South. 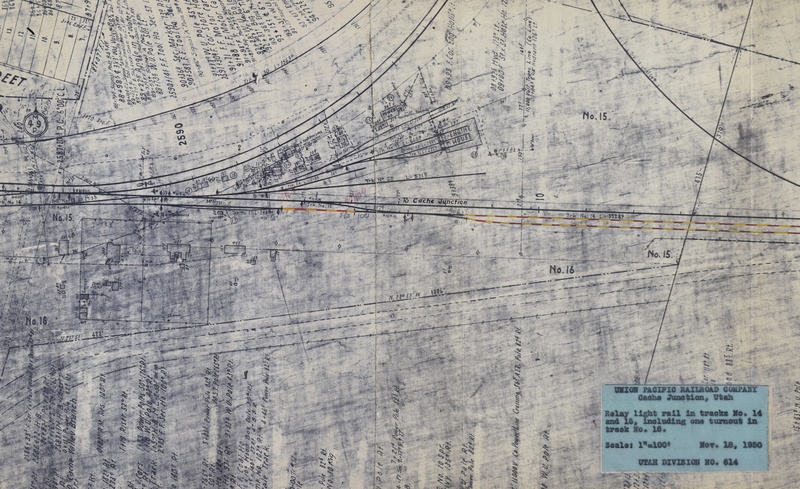 D&RG, Salt Lake City, 1917, sheet 4 -- (8.34 MB) (14.43 x 28.42) --- Shows the D&RGW lines in the vicinity of 21st South, including the original siding at Roper, before Roper yard was completed. 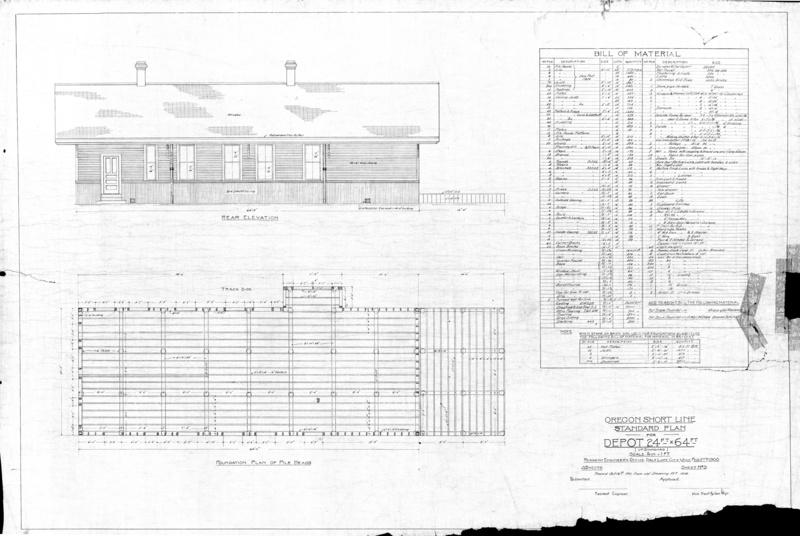 D&RGW, Goshen Valley RR, map1 -- (5.18 MB) (11.1 x 18.47) --- Shows the Goshen Valley Railroad. 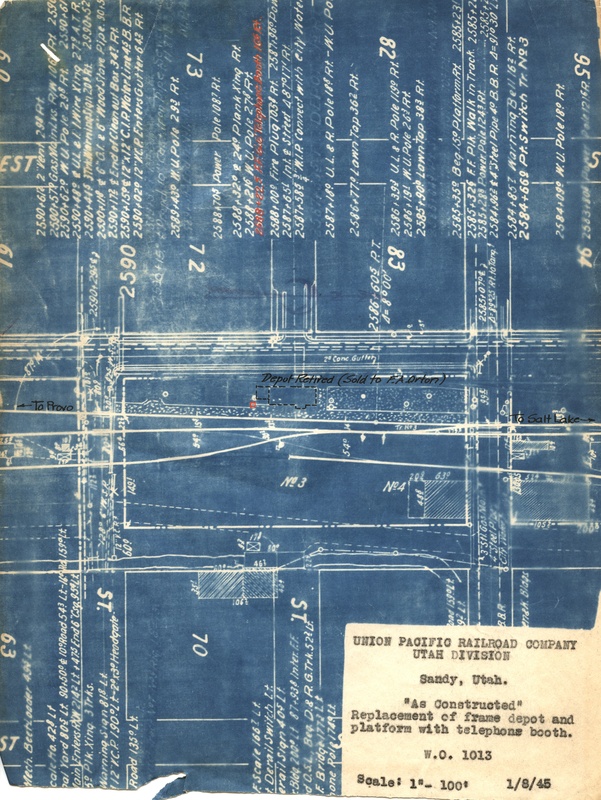 D&RGW, Goshen Valley RR, map2 -- (4.69 MB) (10.9 x 18.69) --- Shows the Goshen Valley Railroad, as part of the Tintic Branch. 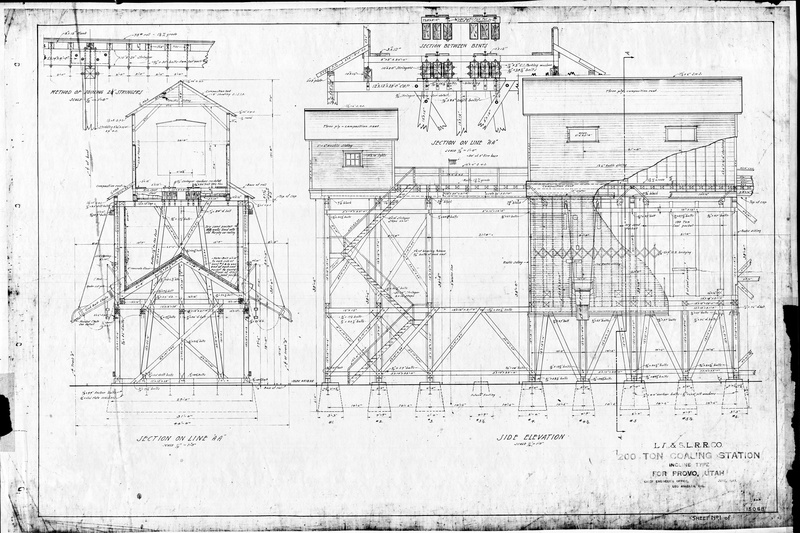 D&RGW, Grant Tower Retirements, 1949 -- (33.66 MB) (13.36 x 72.63) --- Shows the changes needed to build the Grant Tower Interlocking. 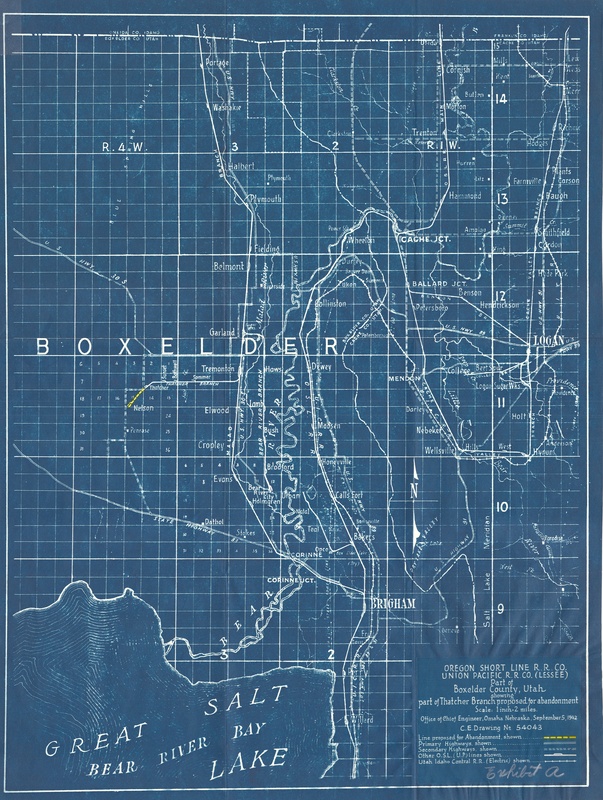 D&RGW, Hooper branches -- (5.71 MB) (9.65 x 16.81) --- Shows the branches servibf Hooper in south Weber County. 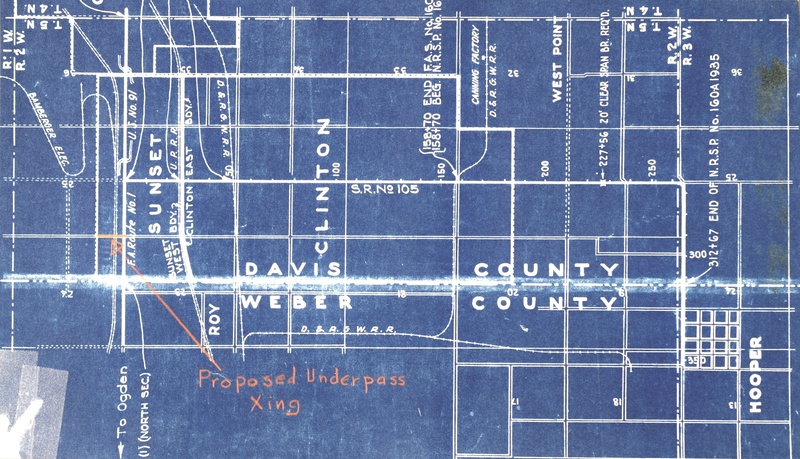 D&RGW, Midvale Center Street Crossing -- (5.44 MB) (12.28 x 14.17) --- Shows the D&RGW crossing of Center Street in Midvale. 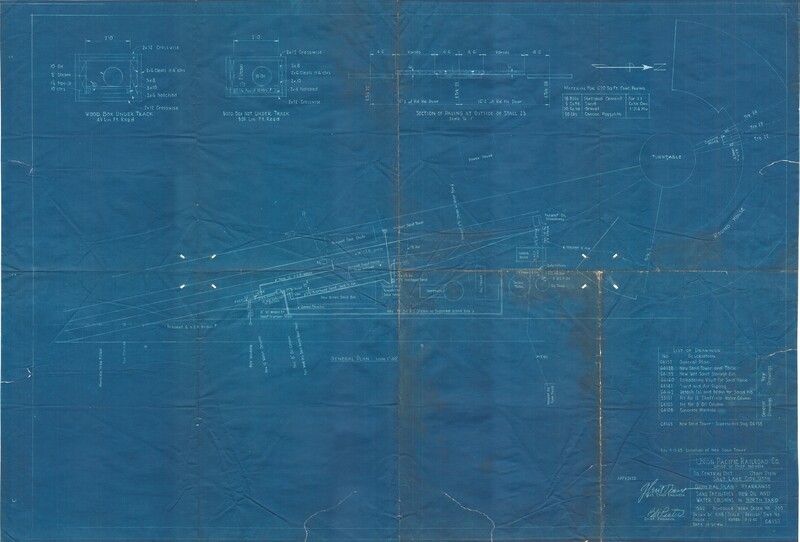 D&RGW, Silver City Branch abandoned, 1943 -- (4.72 MB) (10.14 x 17.84) --- Shows the tracks to be abandoned south of Eureka. 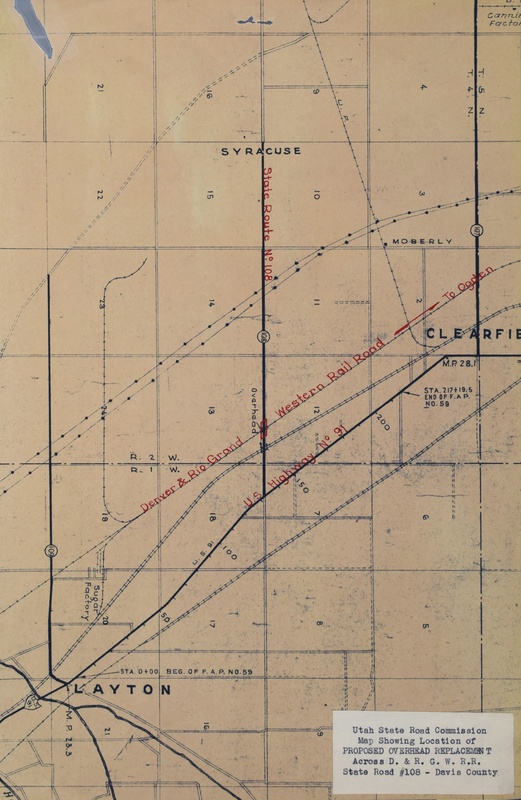 D&RGW, South Syracuse Branch -- (4.59 MB) (17.06 x 11.11) --- Shows the tracks in north davis County, including the South Syracuse Spur. 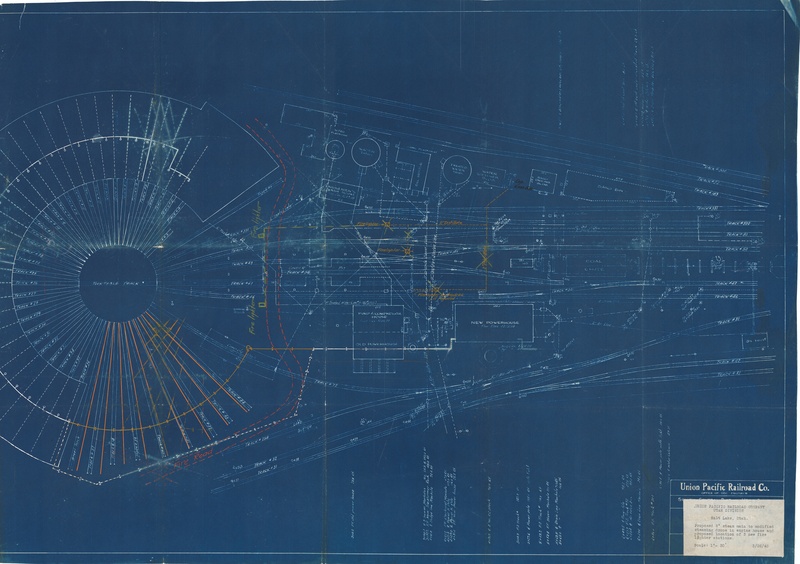 D&RGW, Thistle, 1959 -- (8.69 MB) (13.97 x 15.24) --- Shows the enginehouse and yard at Thistle. 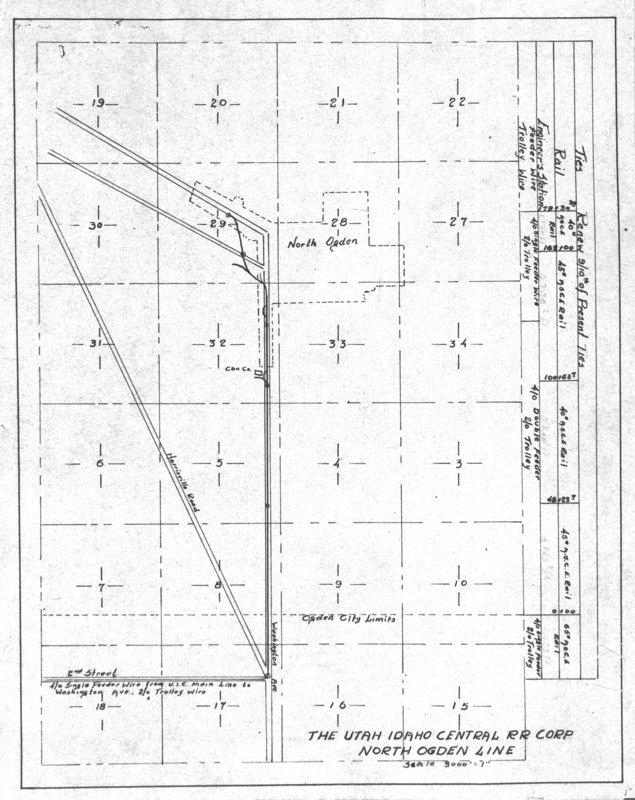 D&RGW, Vernal Branch, 1925 -- (29.25 MB) (21.79 x 37.39) --- Shows the route of the prtoposed Vernal Branch. 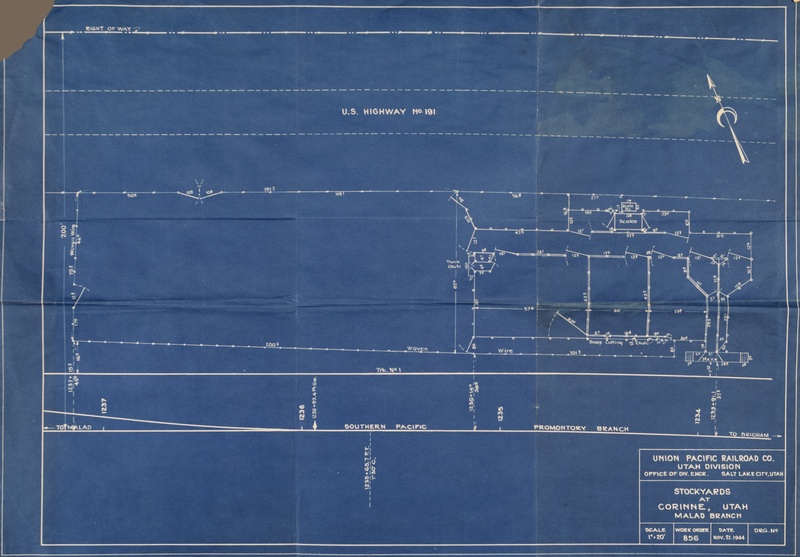 D&RGW, Vernal Branch condensed profile -- (9.46 MB) (9.45 x 24.45) --- Shows the profile of the proposed Vernal Branch. 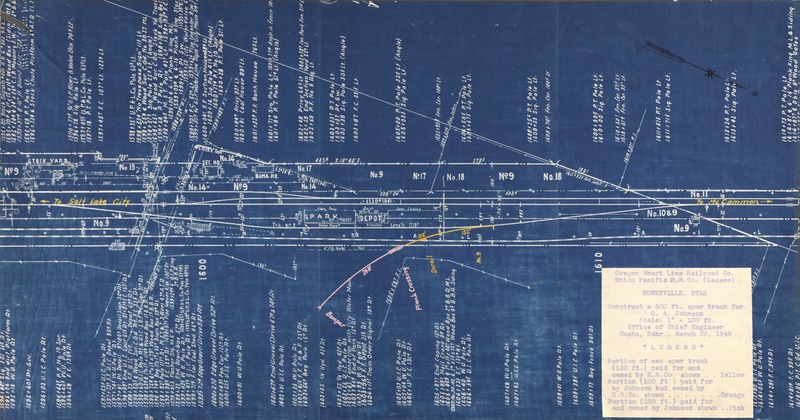 D&RGW-WP, Joint Tracks, 1930 -- (12.19 MB) (10.23 x 38.81) --- Shows the joint-owned tracks of D&RGW and WP in Salt Lake City. 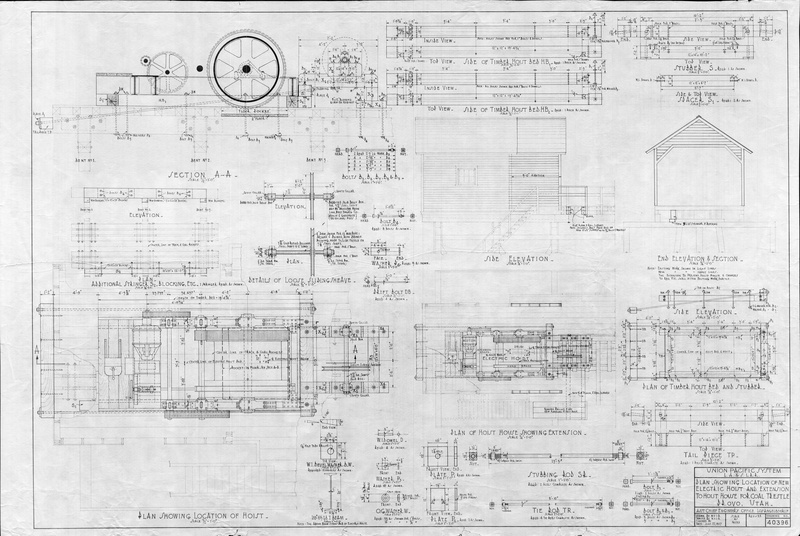 Eureka Hill RR, Silver City engine house, 1935 -- (4.55 MB) (11.25 x 13.33) --- Shows a portion of the tracks in Silver City, including the EHRR enginehouse. 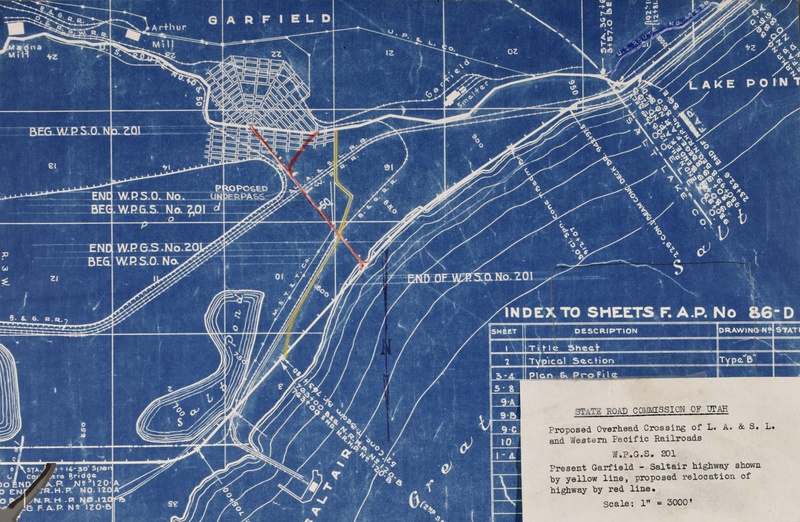 Garfield Railroads, 1934 -- (25.07 MB) (13.18 x 41.41) --- Shows the railroads in the vicinity between Salt Lake City and Garfield. 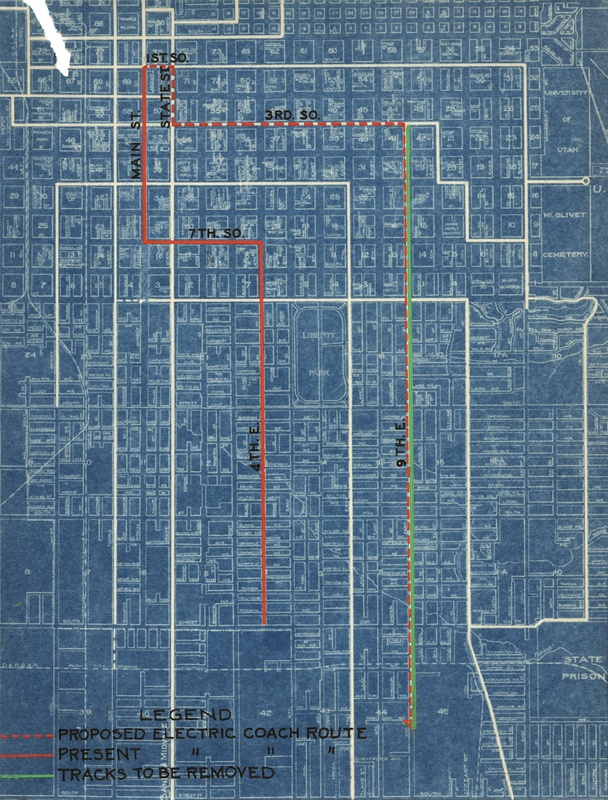 Garfield Railroads, 1936 -- (6.38 MB) (11.65 x 17.87) --- Shows the railroads in the vicinity of Garfield. 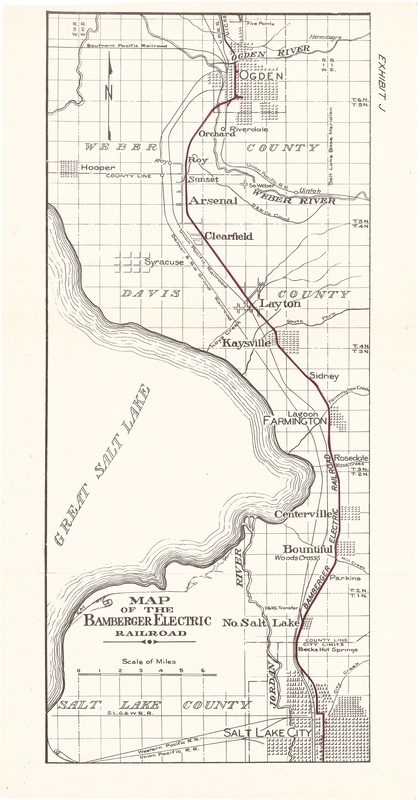 Kenilworth and Helper Railroad -- (3.1MB) (10.375 x 15.75) -- A map from 1925, showing the Kenilworth and Helper Railroad to be abandoned, and the D&RGW Kenilworth Branch that replaced it. 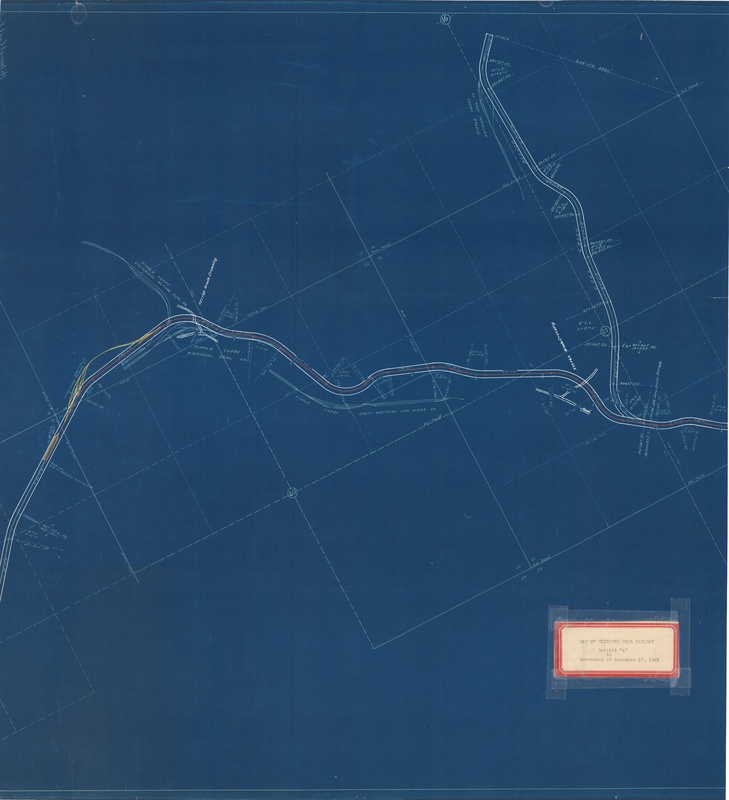 National Coal Railway, 1925 -- (6.35 MB) (20.15 x 18.37) --- Shows the entire route of National Coal Railway in Gordon Creek canyon. 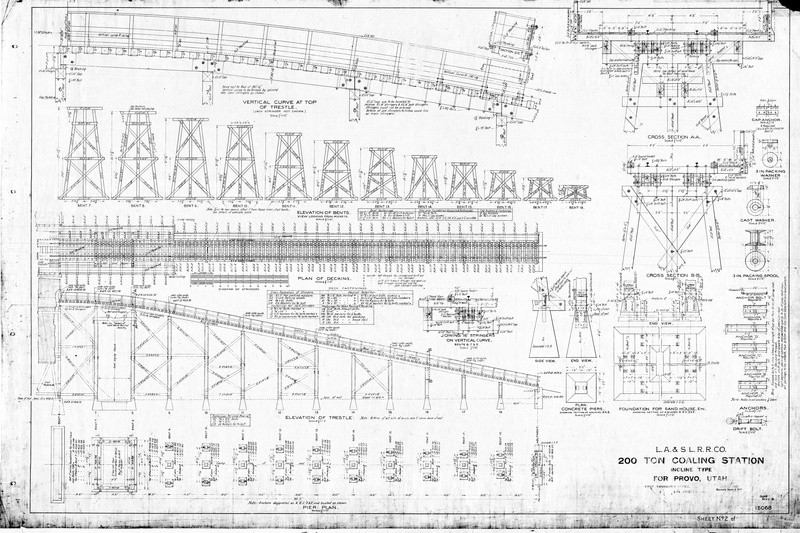 National Coal Railway, 1927, National Union Sweet -- (55.53 MB) (24.21 x 56.63) --- Shows detail of the yard tracks at National, Sweet and Union, at the west end of National Coal Railway. 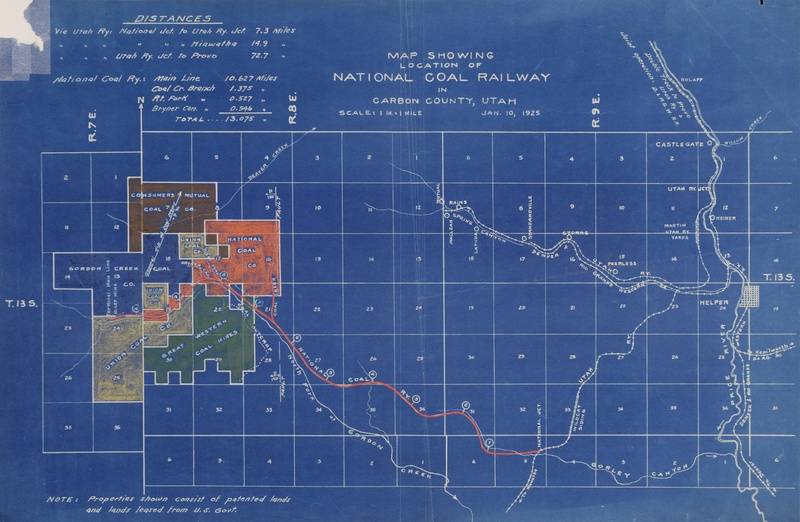 National Coal Railway, Coal Lands, 1925 -- (5.68 MB) (12.21 x 18.72) --- Shows the coal lands served by National Coal Railway. 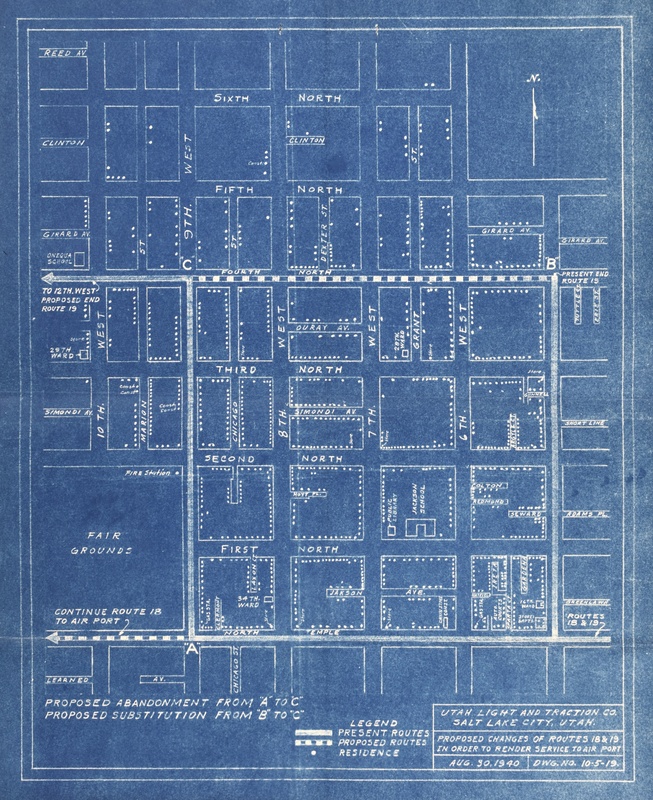 Ogden Union Stockyards -- (101.39 MB) (34.9 x 67.38) --- Shows the layout of the tracks that served the Ogden Union Stockyards. 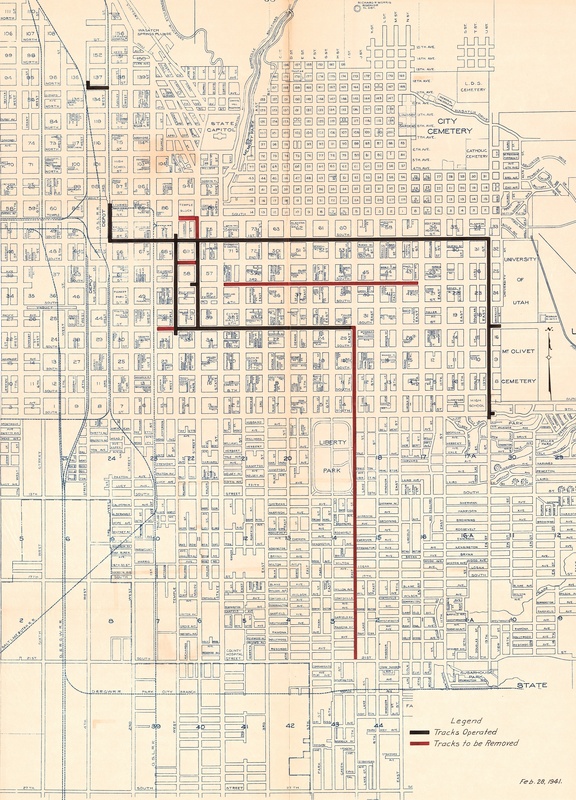 OSL, Salt Lake City, 1913, sheet 1 -- (61.08 MB) (22.98 x 86.62) --- Shows the tracks between Ninth South and "Eleventh" (17th) South. 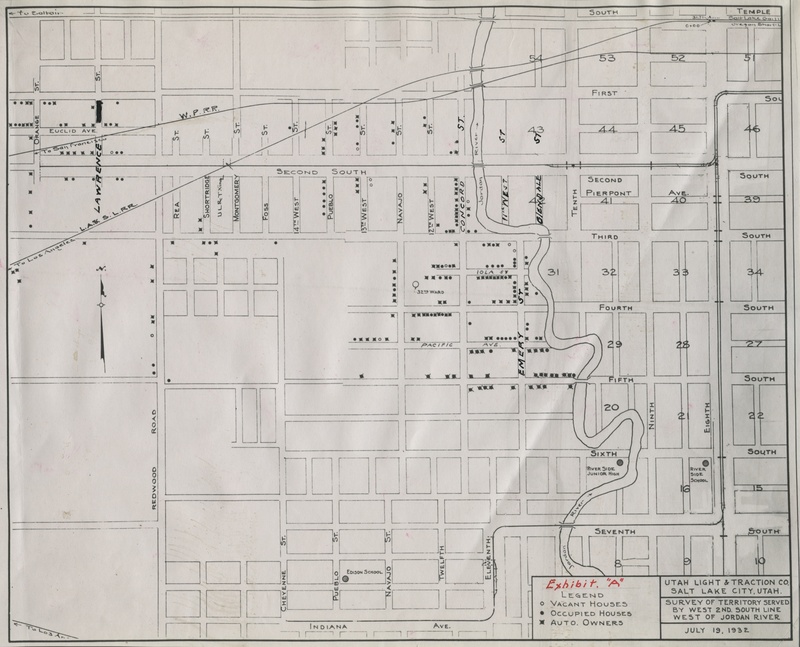 OSL, Salt Lake City, 1913, sheet 2 -- (35.57 MB) (21.46 x 56.61) --- Shows the tracks in the vicinity of "12th" (21st) South. 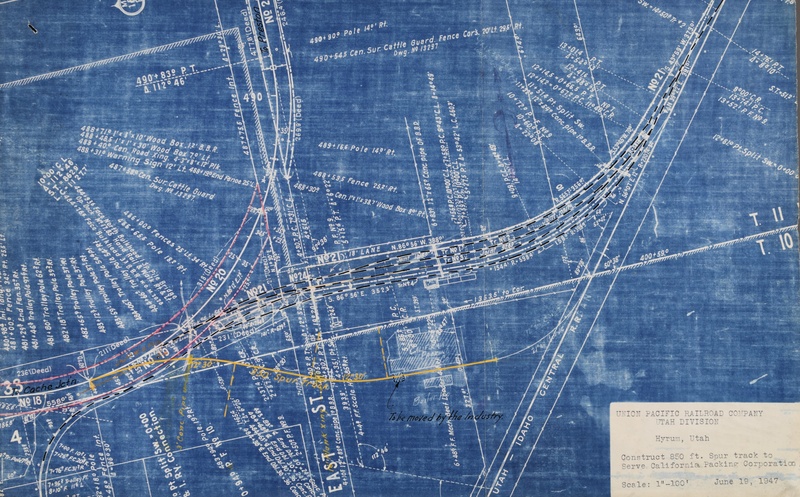 OSL, Salt Lake City, 1913, sheet 3 -- (51.47 MB) (21.92 x 83.8) --- Shows the tracks in the vicinity of "13th" (27th) South and "14th" (33rd) South, including the spur to Hustlers Mill. 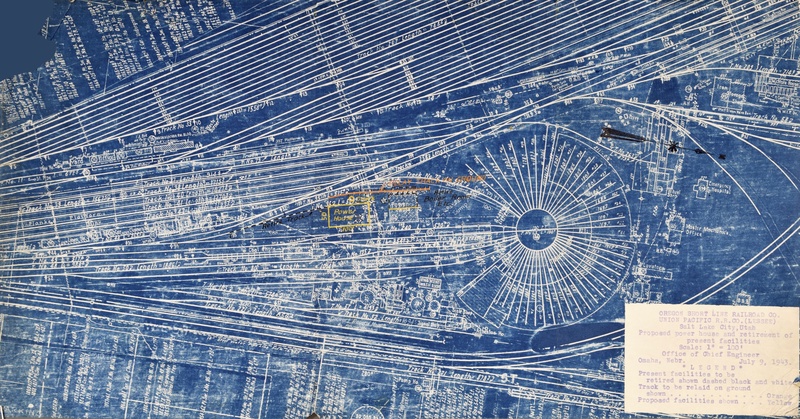 OSL, Salt Lake City, 1913, sheet 4 -- (59.42 MB) (21.63 x 93.95) --- Shows the tracks in the vicinity of "17th" (4800) South, including Fireclay (portion showing Murray depot damaged). 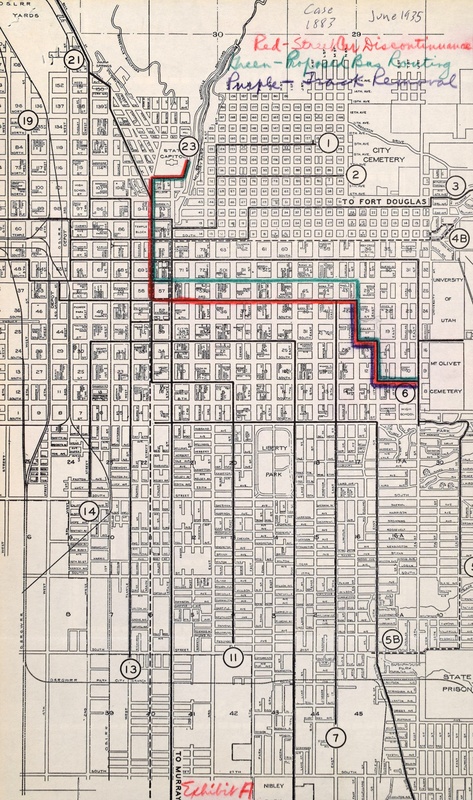 OSL Farmington line change, 1913 -- (4.73 MB) (14.1 x 24.17) --- Shows the route of the line change at Farmington, including the exact site of Haight's Grove, where trains stopped for John W. Young's Lake Side resort. 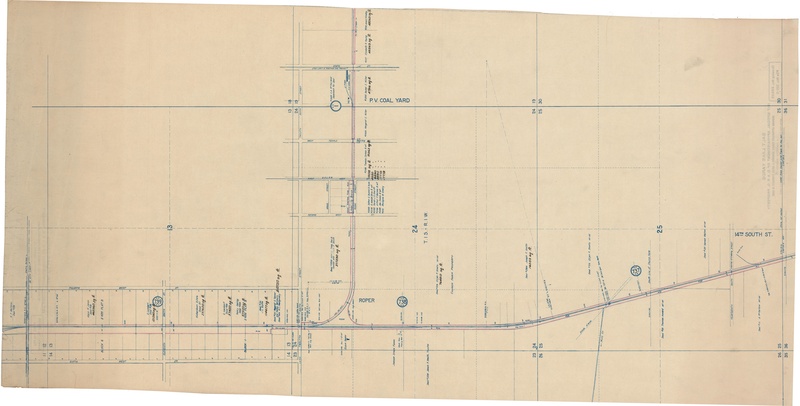 OSL-UP, Preston Idaho, 1947 -- (6.67 MB) (9.96 x 19.08) --- Shows the station tracks at Preston, Idaho. 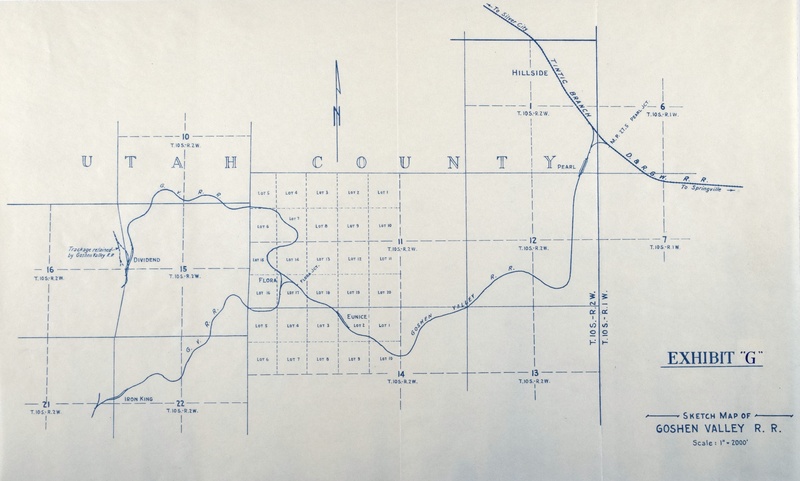 OSL UP, Thatcher Branch, 1942 -- (19.72 MB) (23.89 x 18) --- Shows the portion of the Thatcher Branch, near Tremonton, to be abandoned in 1942. 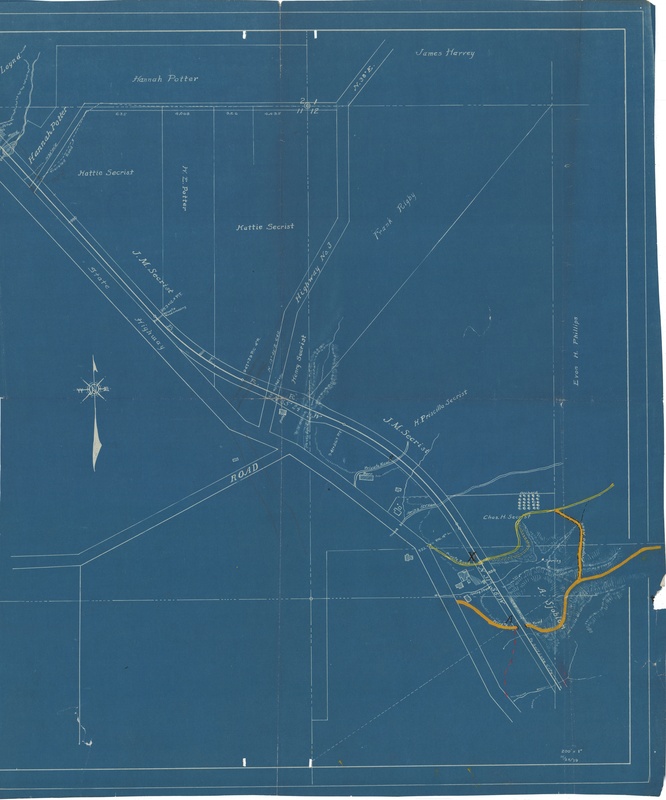 OSL-UP, Urban Branch retirement, 1947 -- (2.88 MB) (10.38 x 7.84) --- Shows the portion of the Urban Branch, near Brigham City, to be abandoned in 1947. 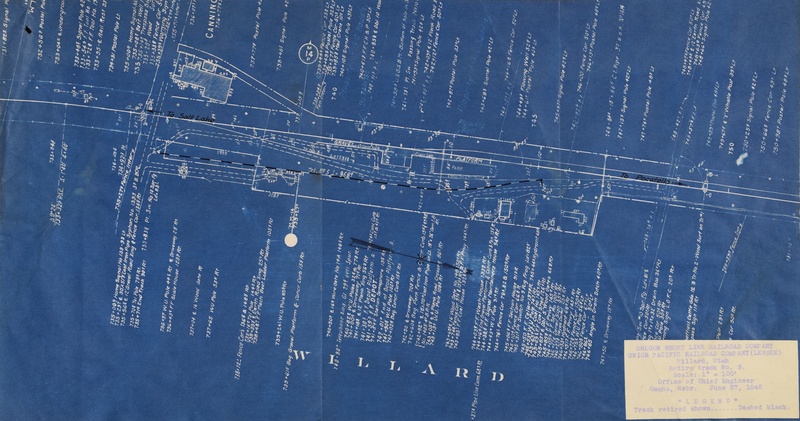 OSL-UP, Willard, 1942 -- (5.23 MB) (10 x 19.01) --- Shows the station tracks at Willard. 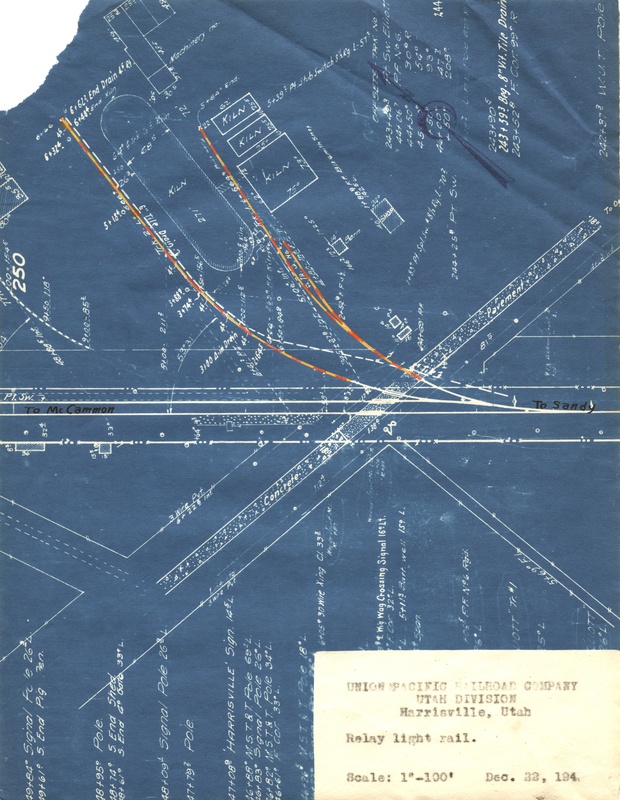 OSL-UP UIC, Hyrum interchange, 1947 -- (6.83 MB) (11.55 x 18.58) --- Shows the interchange tracks at Hyrum at UIC abandonment; UP retained its half of the interchange for beet loading. 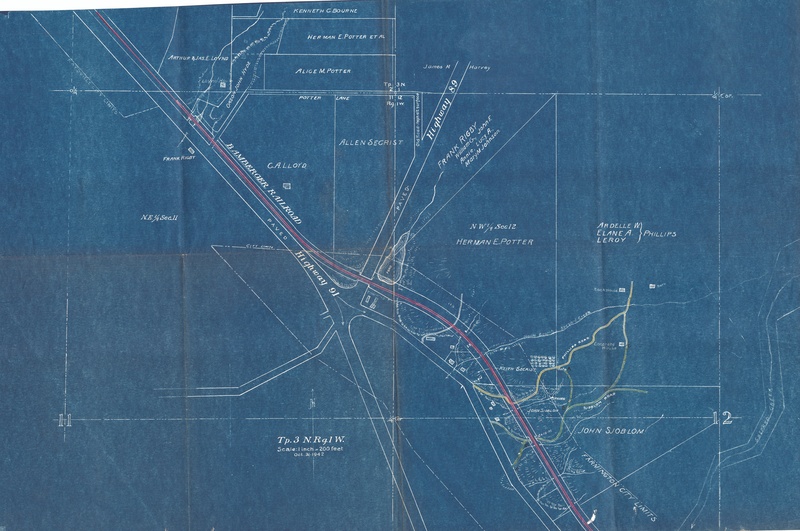 OSL-UP-UIC, Hyrum interchange, 1948 -- (5.16 MB) (9.86 x 19.01) --- Shows the interchange tracks at Hyrum; UP abandoned its remaining half of the interchange. 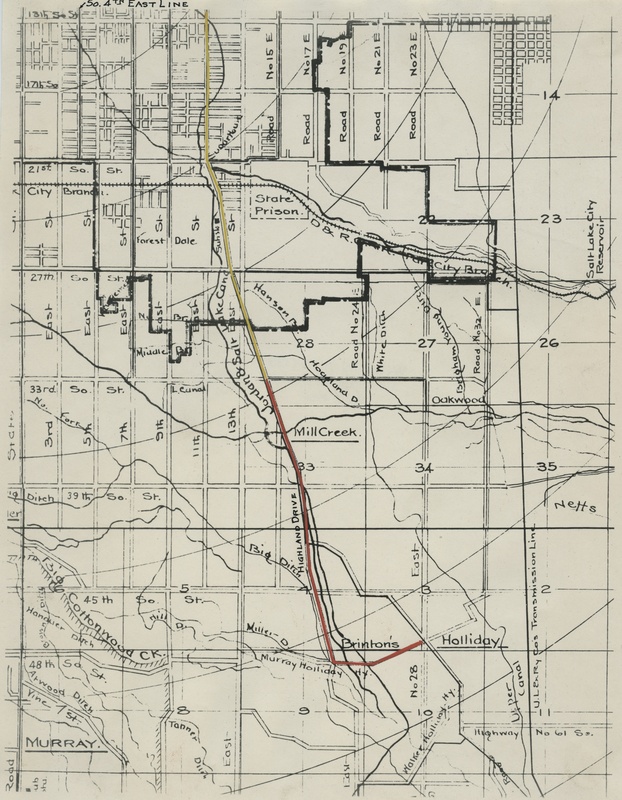 Salt Lake & Denver -- (12.16 MB) (15.35 x 35.89) --- Shows the route of the proposed Salt Lake & Denver Railroad. 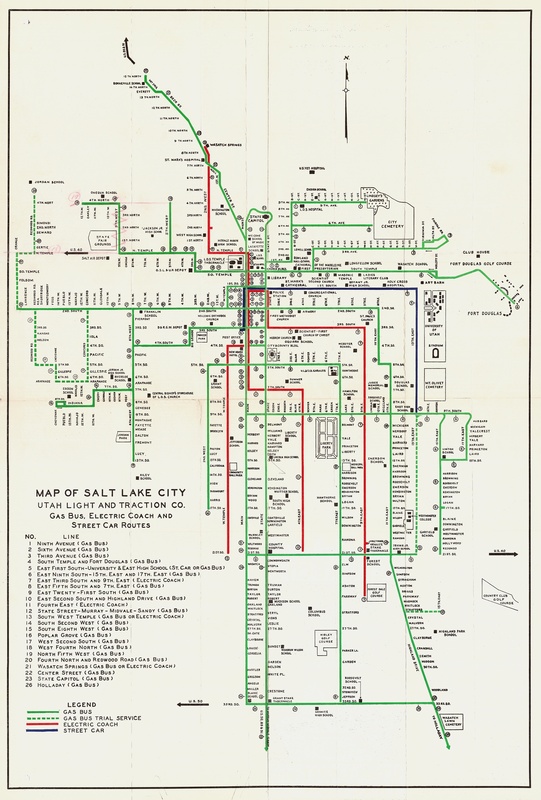 Salt Lake & Utah system -- (10.62 MB) (27.44 x 15.45) --- A map of the complete Salt Lake & Utah electric interurban system. 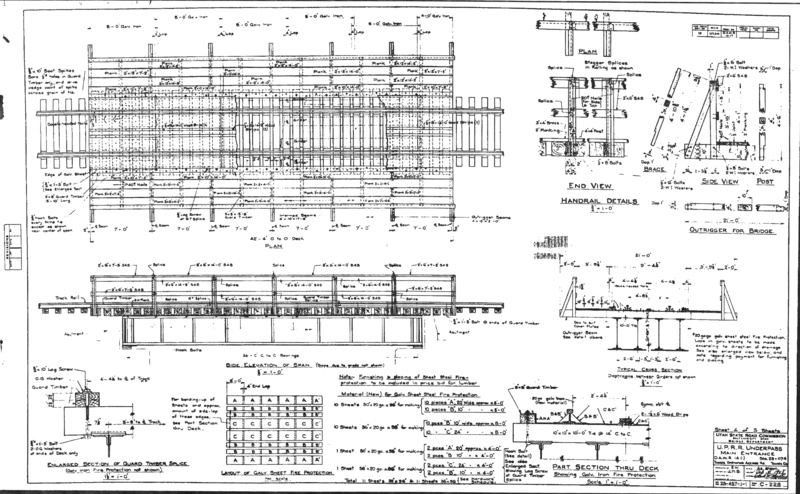 Salt Lake & Utah, Condensed Profile, 1915 -- (15.28 MB) (11.06 x 52.2) --- Profile of the Salt Lake & Utah. 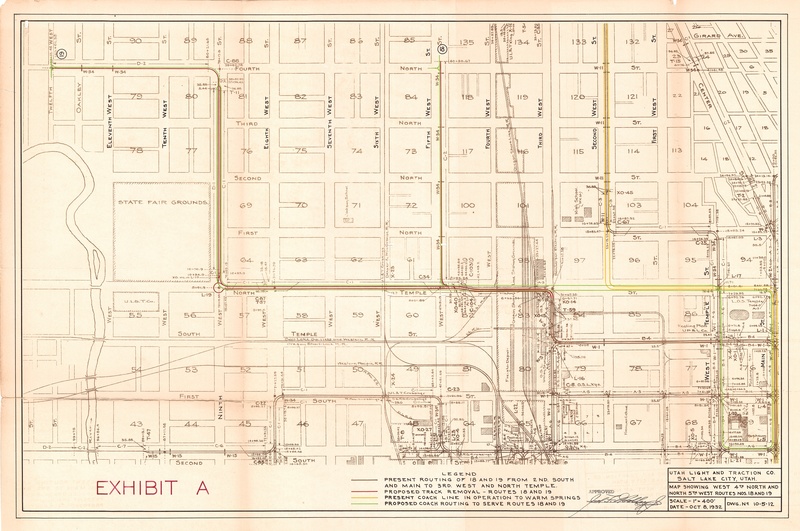 Salt Lake City streetcar routes, 1940 -- (12.03 MB) (27.92 x 18.89) --- Side one of fold-out map of Salt Lake City street cars and bus routes. 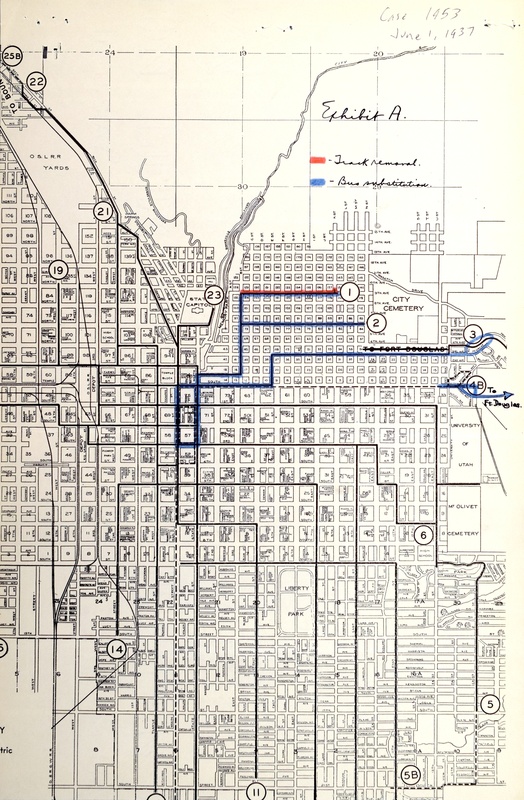 Salt Lake City streetcar routes, 1940, page 1, 2, 3 -- (6.46 MB) (9.34 x 18.89) --- Three pages of side two of fold-out map of Salt Lake City street cars and bus routes. 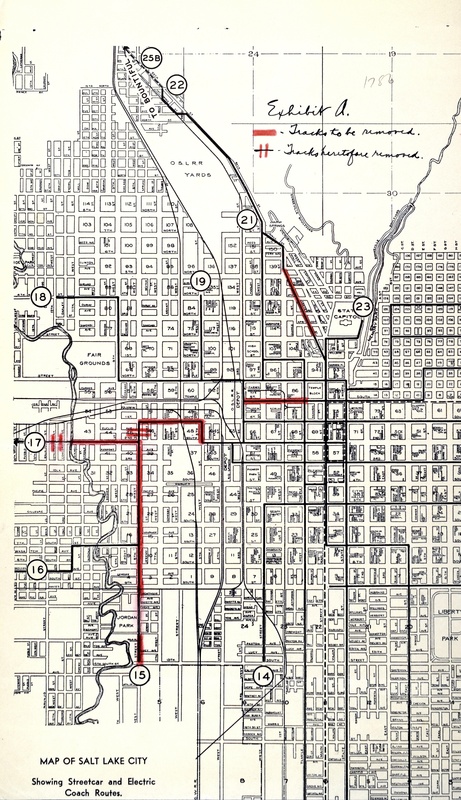 Salt Lake City streetcar routes, 1940, page 4, 5, 6, 7 -- (5.48 MB) (9.43 x 18.89) --- Four pages of side two of fold-out map of Salt Lake City street cars and bus routes. 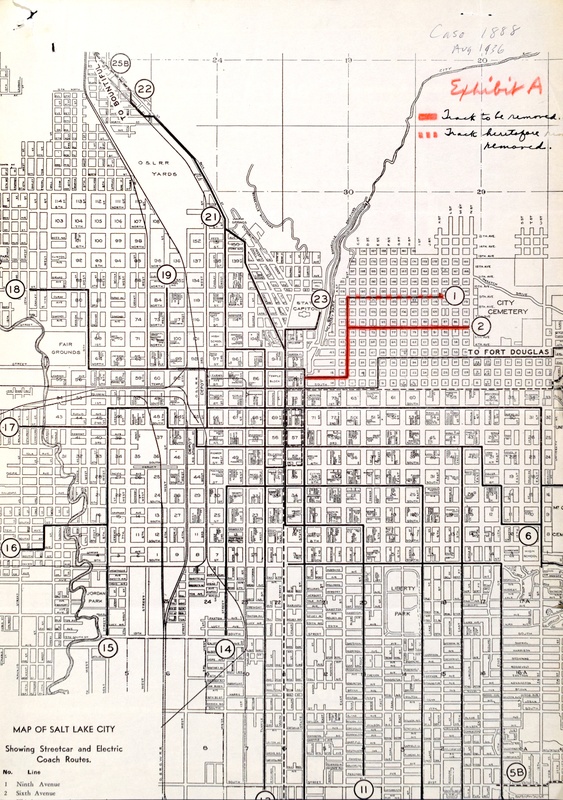 Salt Lake City streetcar routes, 1940, page 8, 9, 10, 11 -- (4.90 MB) (9.14 x 18.89) --- Four pages of side two of fold-out map of Salt Lake City street cars and bus routes. 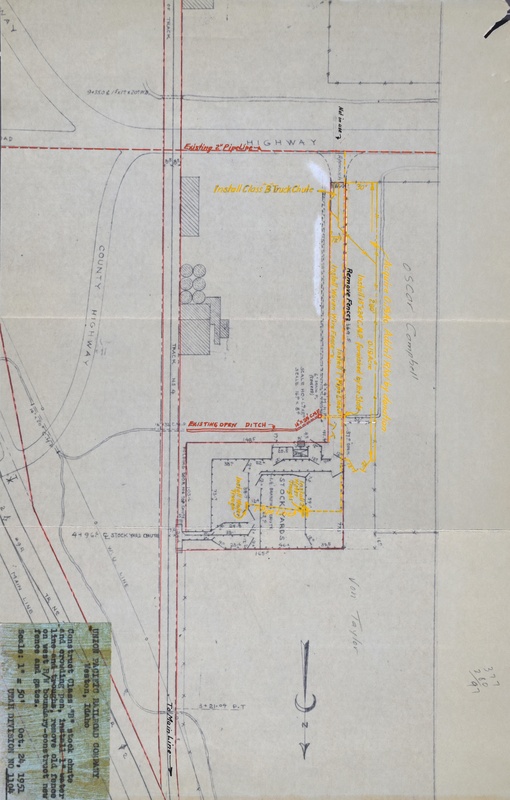 Salt Lake Union Depot & Railroad Co, no date -- (8.04 MB) (10.96 x 29.94) --- Shows tracks owned by the depot company, a joint-company owned by D&RGW and WP. 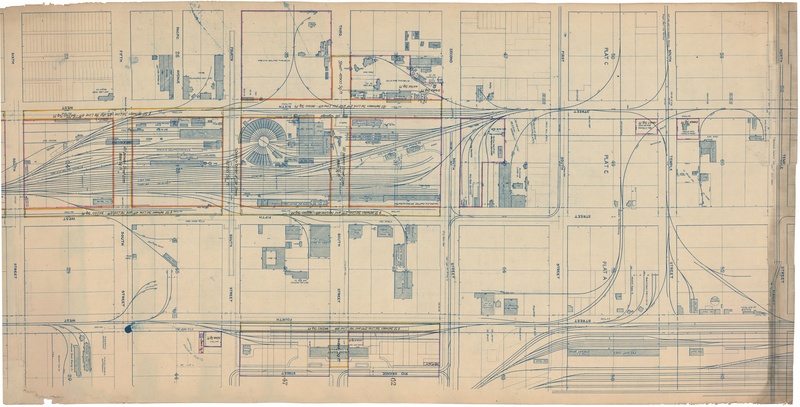 Salt Lake Union Stockyards, 1947 -- (33.26 MB) (18.37 x 33.73) --- Shows layout of stockyards and tracks in North Salt Lake. 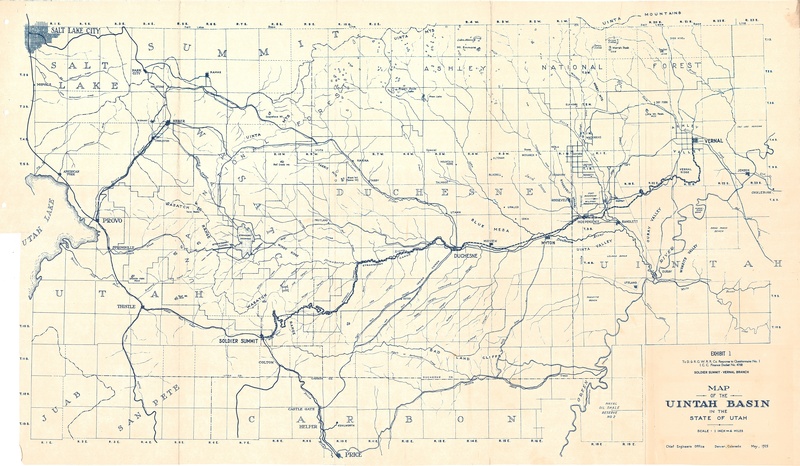 UP, 9th South Passenger Line, 1945 -- (29.18 MB) (10.89 x 58.68) --- Shows tracks from Thrid West, west to the Jordan River. 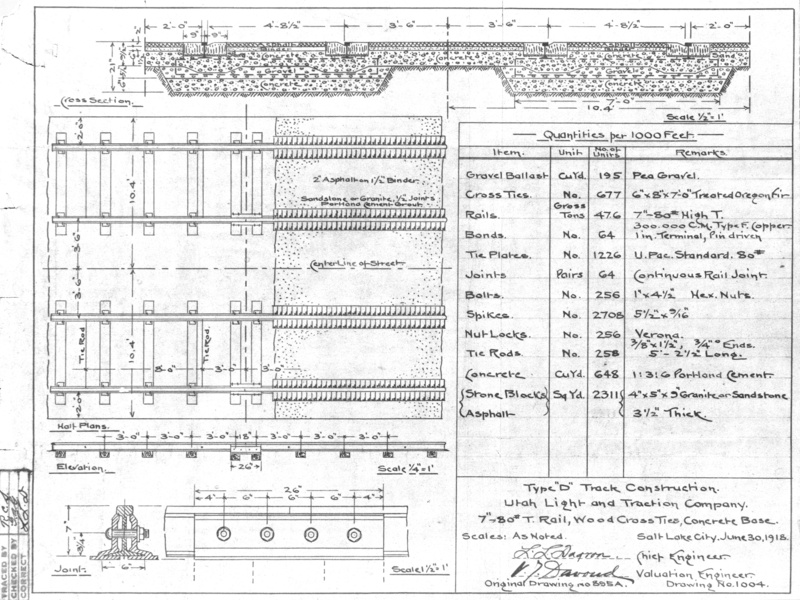 UP, Baker Cement Spur, 1942 -- (15.80 MB) (10.77 x 32.11) --- Shows the portion of the spur to be retired. 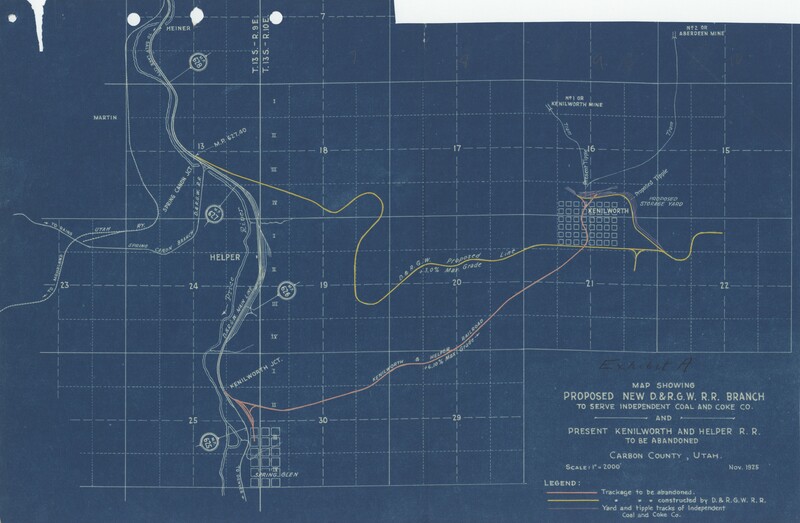 UP, Becks Utah, 1948 -- (22.57 MB) (10.64 x 51.24) --- Shows the original Becks Hot Springs resort, and tracks to the proposed Standard Oil of California refinery. 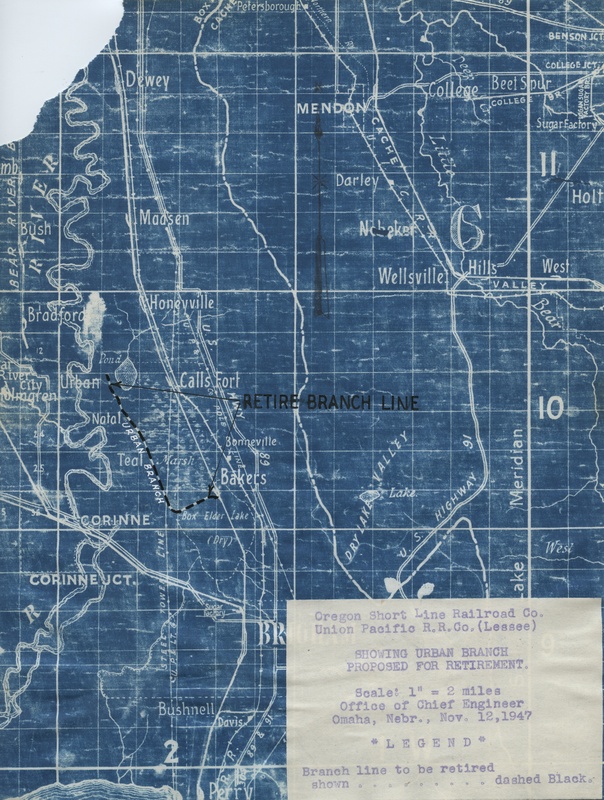 UP, Black Rock Utah, 1945 -- (15.87 MB) (10.61 x 32.03) --- Shows station tracks at Black Rock, south of Delta. 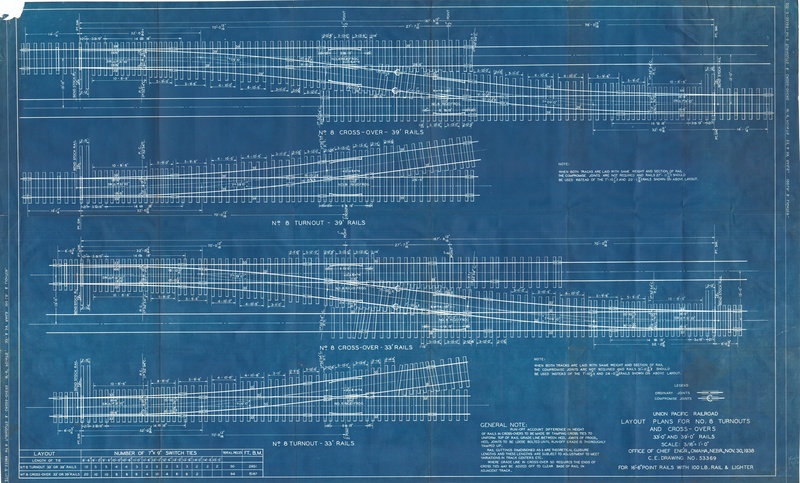 UP, Brigham City, 1958 -- (3.33 MB) (10.53 x 8.07) --- Shows portion of the station tracks and depot at Brigham City. 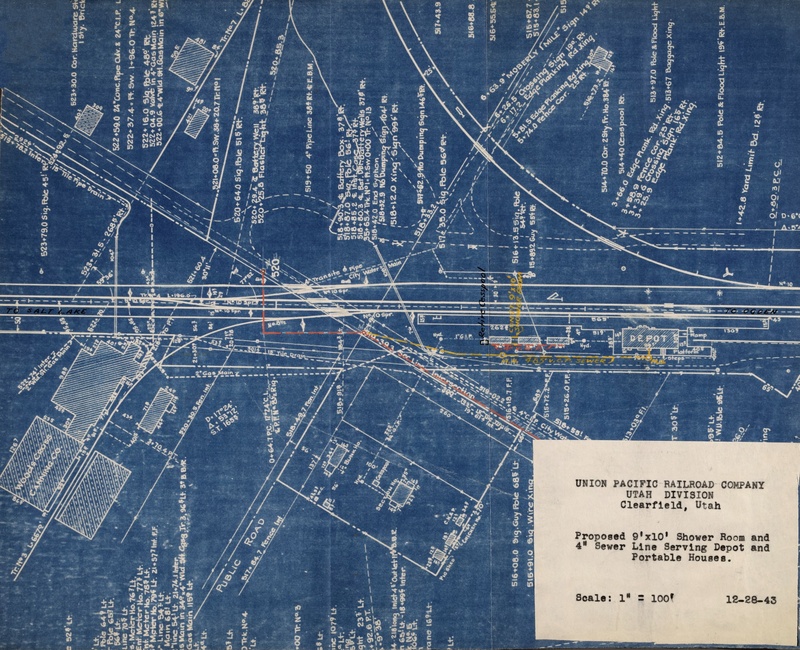 UP, Cache Junction, 1943 -- (19.83 MB) (9.63 x 40.46) --- Shows the station tracks and buildings, including the enginehouse. 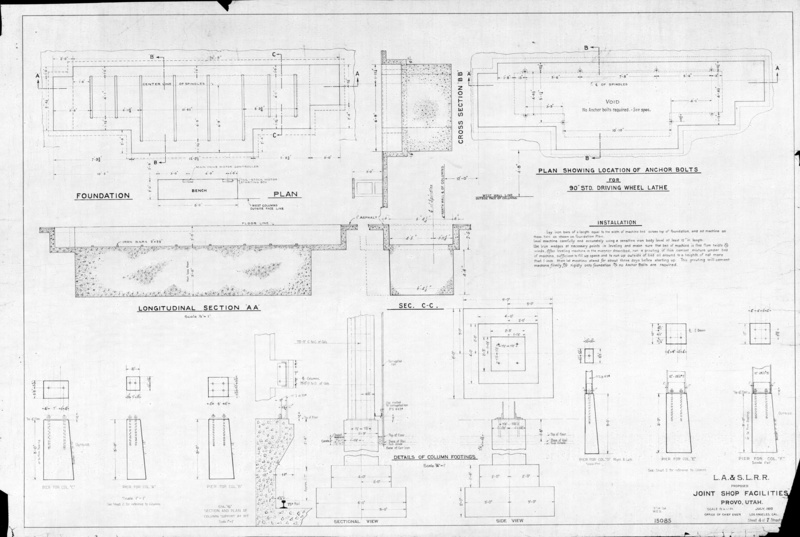 UP, Cache Junction, Coaling Station, 1945 -- (30.85 MB) (20.85 x 35.13) --- Shows details of the existing coaling station at Cache Junction, as part of a proposed sanding facility. 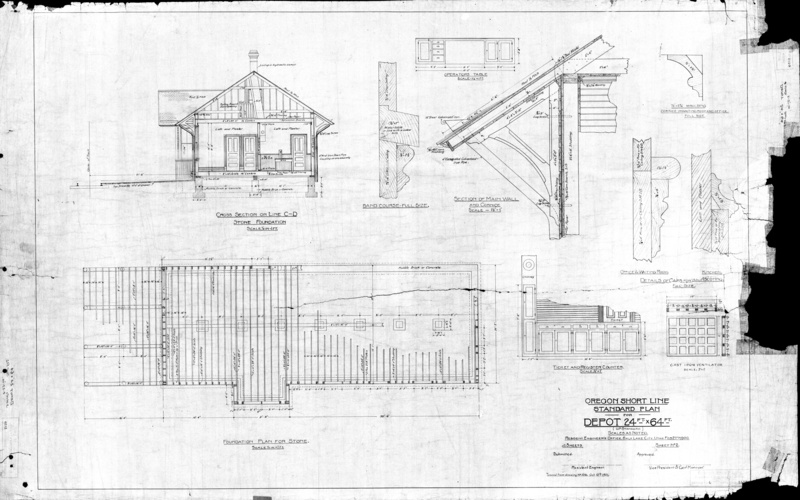 UP, Cache Junction enginehouse, 1950 -- (6.64 MB) (11.36 x 18.6) --- Shows details of the enginehouse. 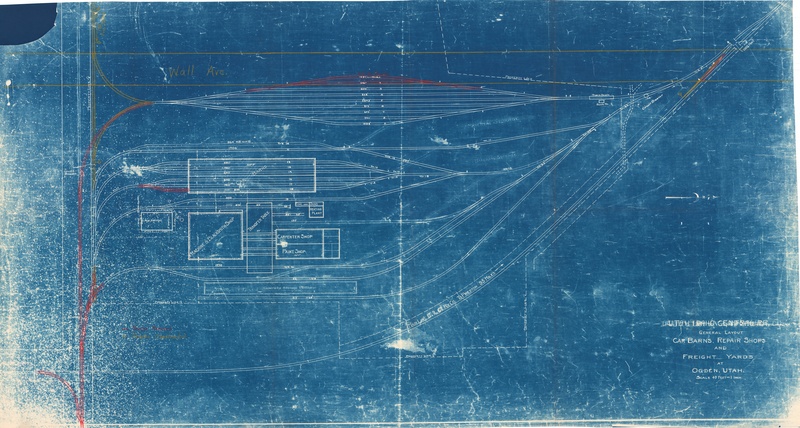 UP, Caliente Nevada -- (39.47 MB) (25.79 x 34.67) --- Shows the station tracks and buildings, including the depot and roundhouse. 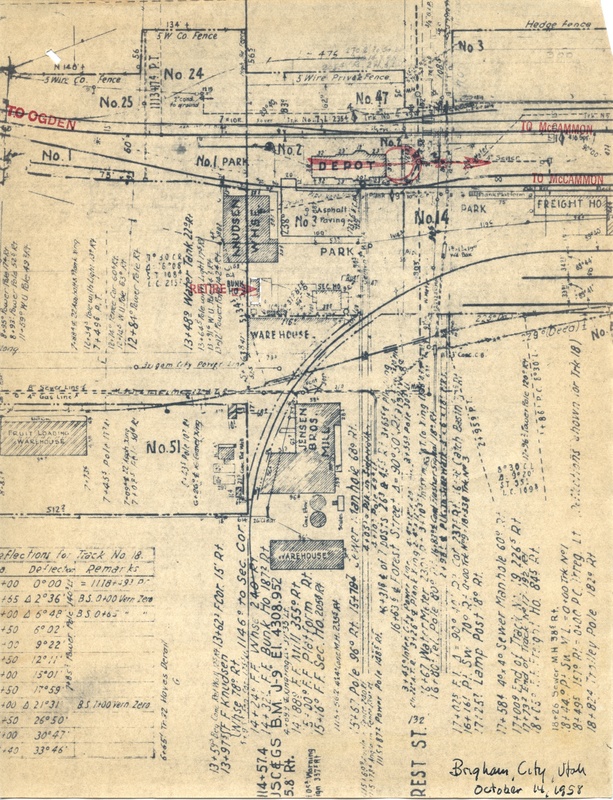 UP, Caliente Nevada, no date -- (42.59 MB) (21.99 x 43.32) --- Shows the station tracks and buildings, including the depot and roundhouse. 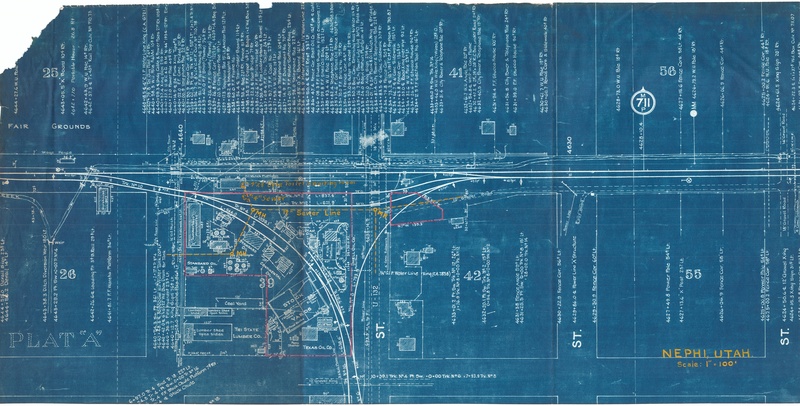 UP, Clearfield, 1943 -- (5.95 MB) (12.33 x 15.18) --- Shows the station tracks and buildings, including the depot. 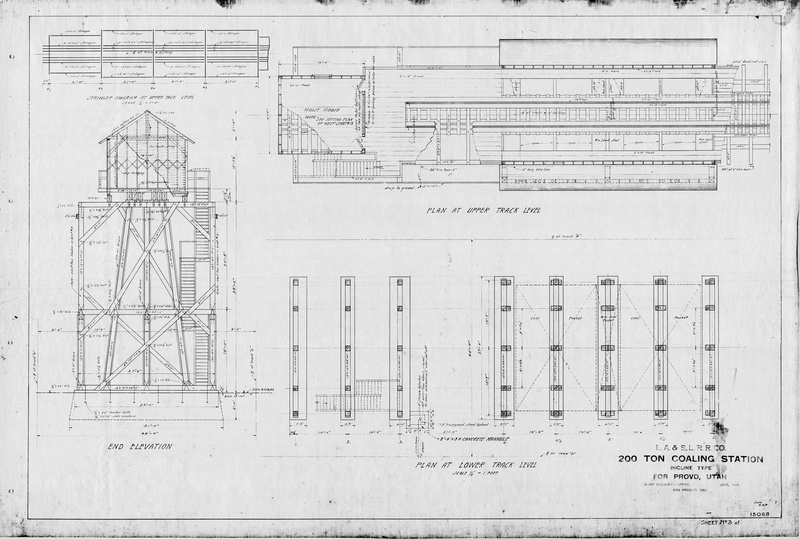 UP, Clearfield Freeport, 1972 -- (7.08 MB) (11.96 x 18.34) --- Shows the original enginehouse at the north end. 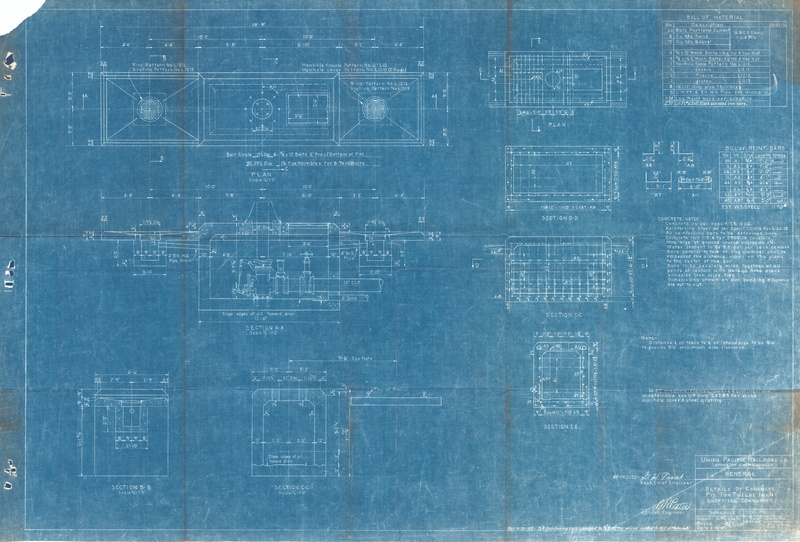 UP, Clearfield Utah, 1947 -- (15.24 MB) (10.61 x 31.85) --- Shows the station tracks and buildings, including the depot. 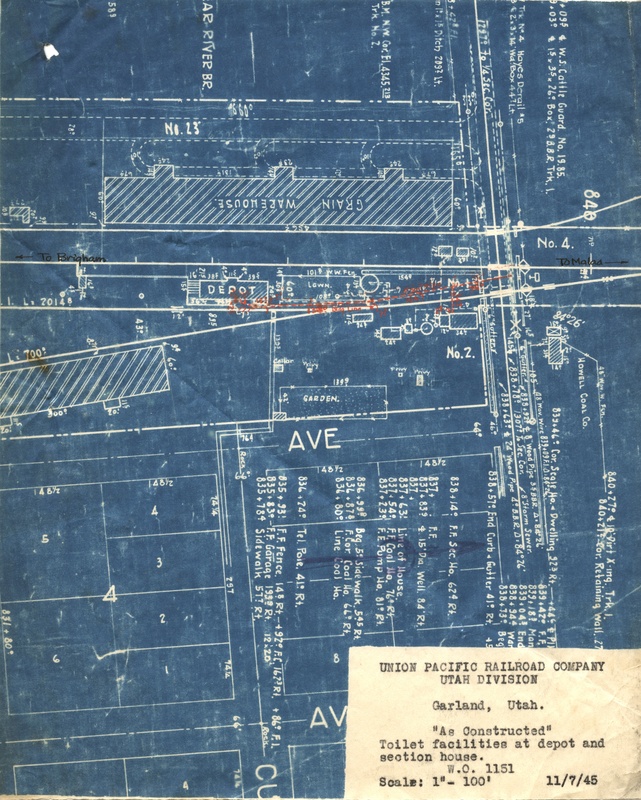 UP, Clearfield Utah, no date -- (20.71 MB) (15.94 x 29.28) --- Shows the station tracks and buildings, including the depot. 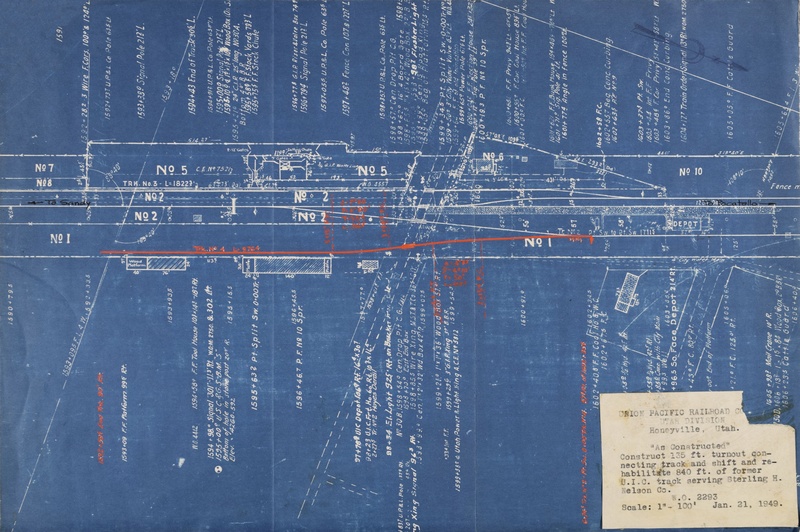 UP, Columbia Steel, 1923 -- (23.19 MB) (14.21 x 69.91) --- Shows all the joint trackage between Provo yard and Ironton. 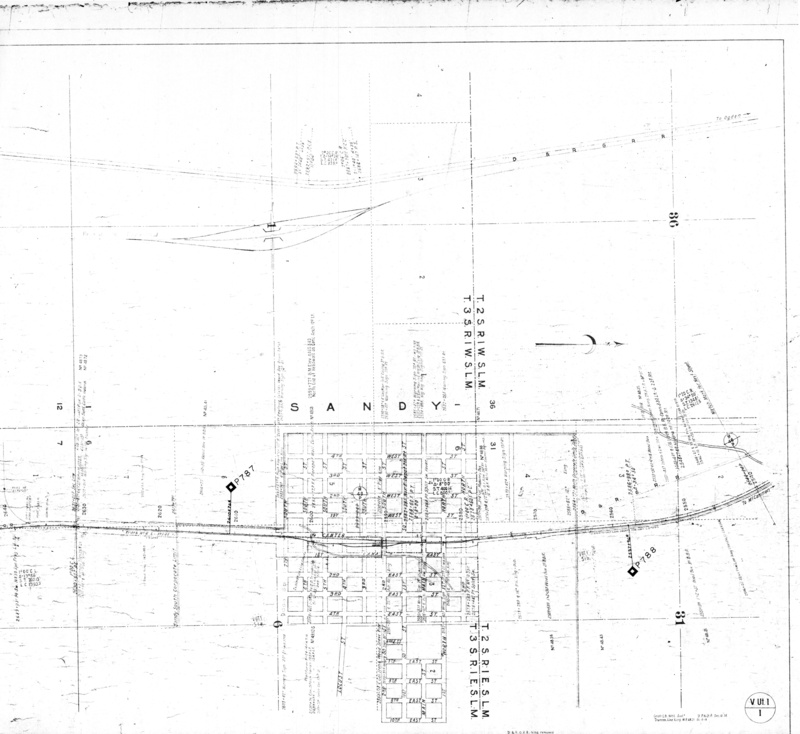 UP, Downey Idaho, 1959 -- (2.68 MB) (10.43 x 7.92) --- Shows the station tracks and buildings, including the depot. 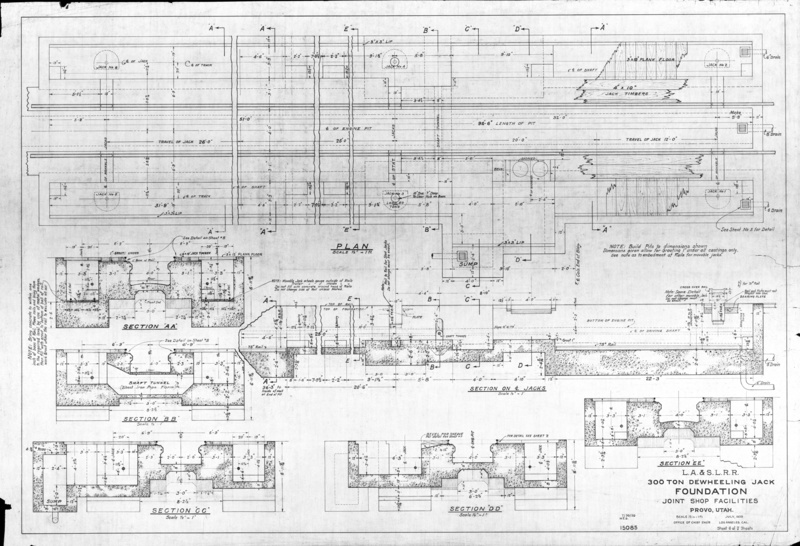 UP, Echo 1940s -- (13.28 MB) (10.74 x 39.37) --- Shows the station tracks and buildings, including the depot. 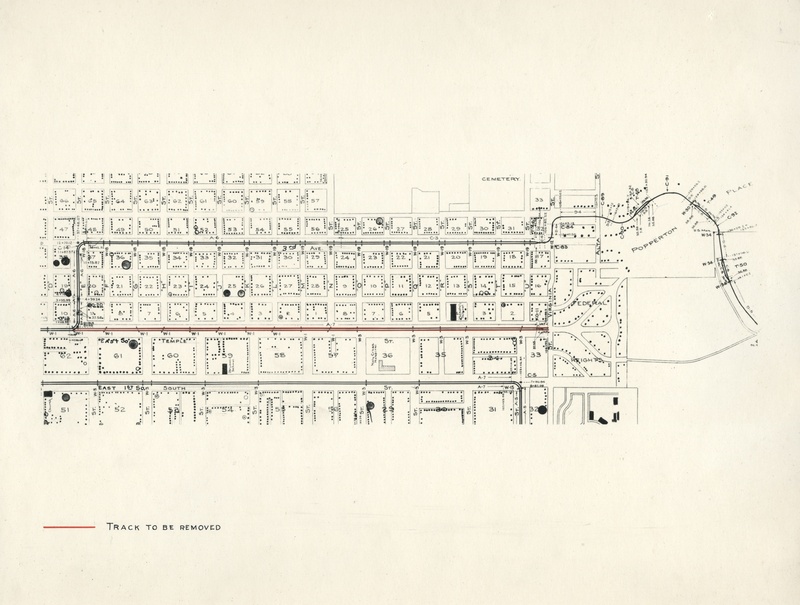 UP, Erda, 1946 -- (7.04 MB) (10.64 x 18.66) --- Shows the station tracks and buildings, including the depot. 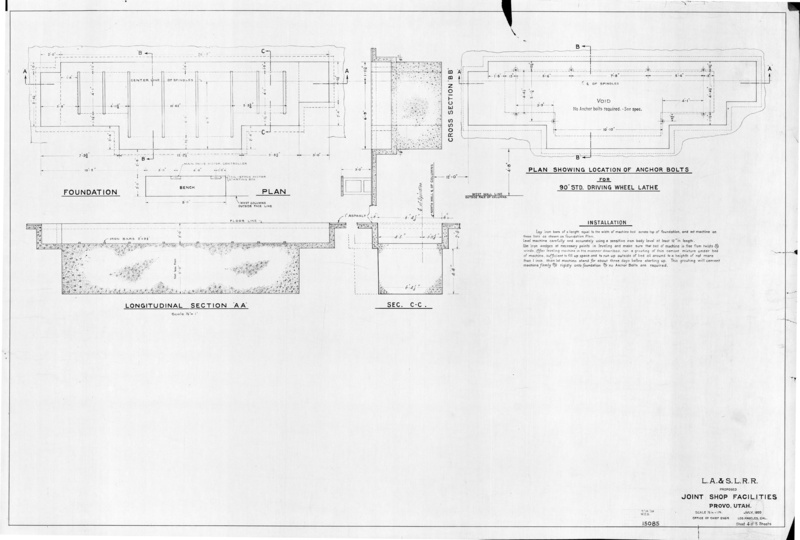 UP, Eureka Branch, sheet 1 -- (19.26 MB) (14.89 x 34.54) --- Shows Tintic Junction and Mammoth Junction. 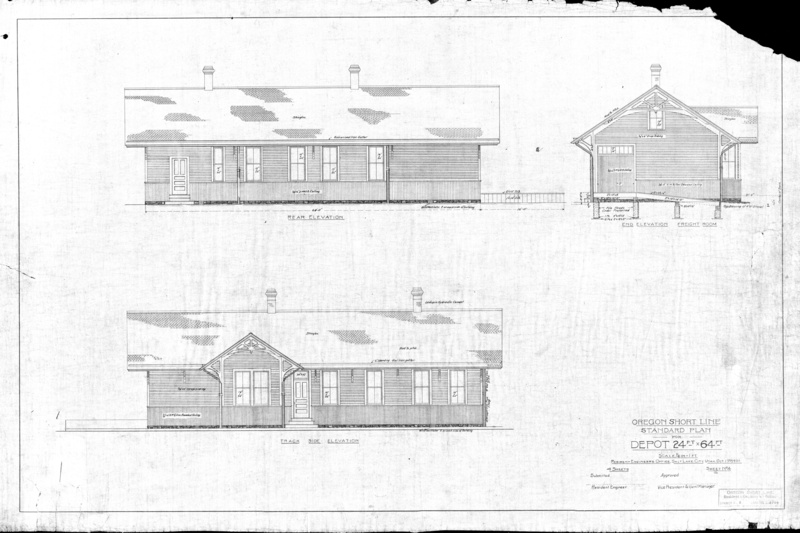 UP, Eureka Utah, 1951 -- (4.07 MB) (13 x 29.24) --- Shows the station tracks and buildings, including the depot. 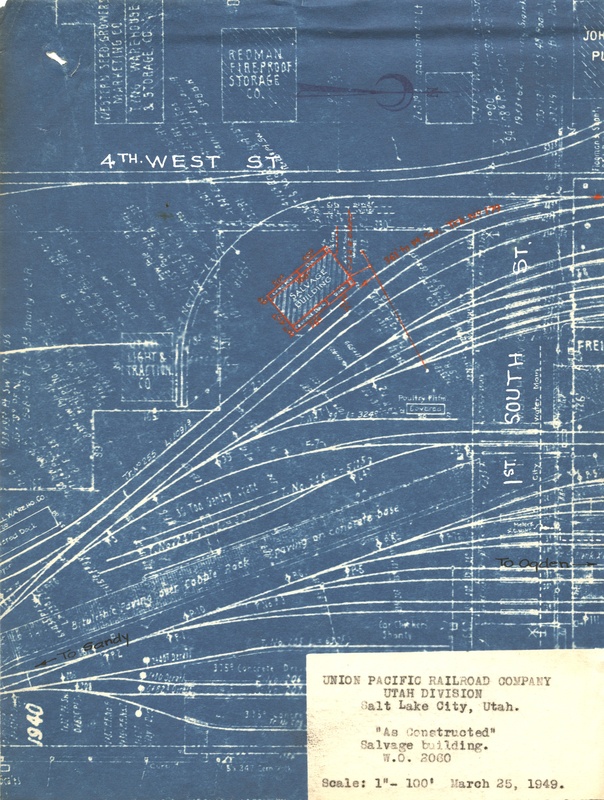 UP, Fillmore, 1949 -- (3.33 MB) (10.41 x 7.86) --- Shows the station tracks and buildings, including the depot. 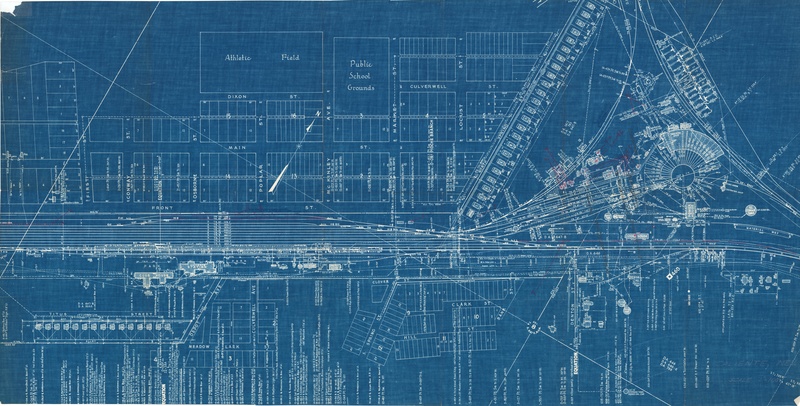 UP, Garfield, 1940 -- (2.48 MB) (10.51 x 7.83) --- Shows the station tracks and buildings, including the depot. 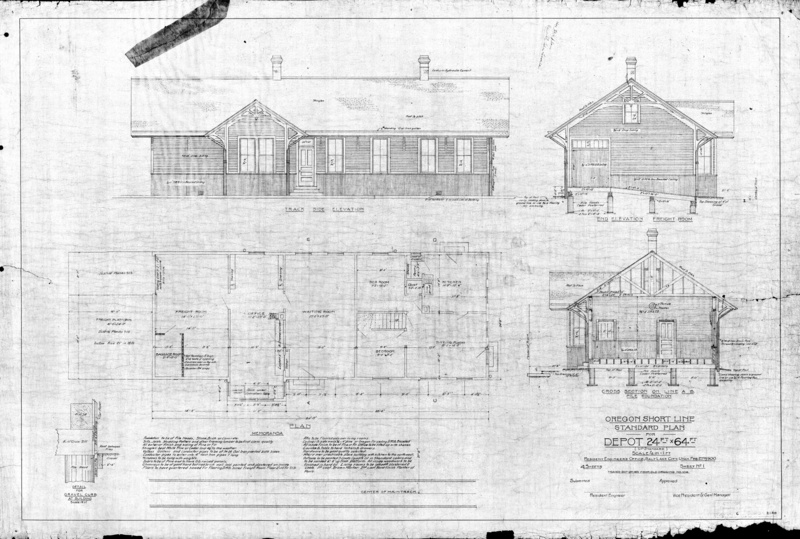 UP, Garfield Utah, no date -- (14.60 MB) (10.47 x 31.87) --- Shows the station tracks and buildings, including the depot. 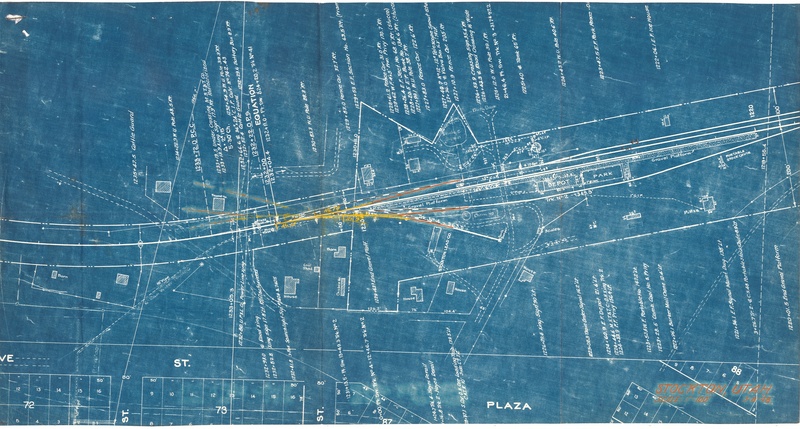 UP, Garland, 1945 -- (3.33 MB) (10.53 x 8.44) --- Shows the station tracks and buildings, including the depot. 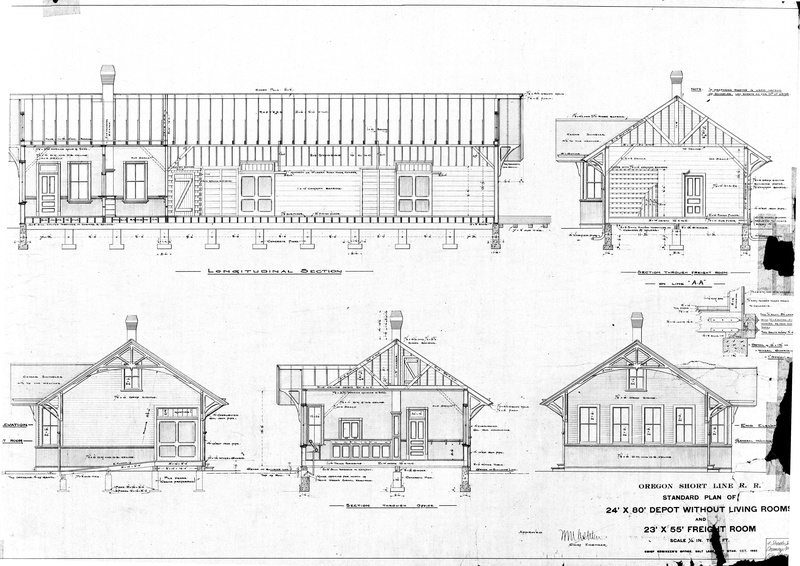 UP, Harrisville, 1949 -- (2.74 MB) (10.32 x 8) --- Shows the station tracks and buildings, including the depot. UP, Honeyville, 1948 February -- (2.71 MB) (10.26 x 7.91) --- Shows the station tracks and buildings, including the depot. UP, Honeyville, 1948 March -- (4.85 MB) (9.85 x 18.78) --- Shows the station tracks and buildings, including the depot. 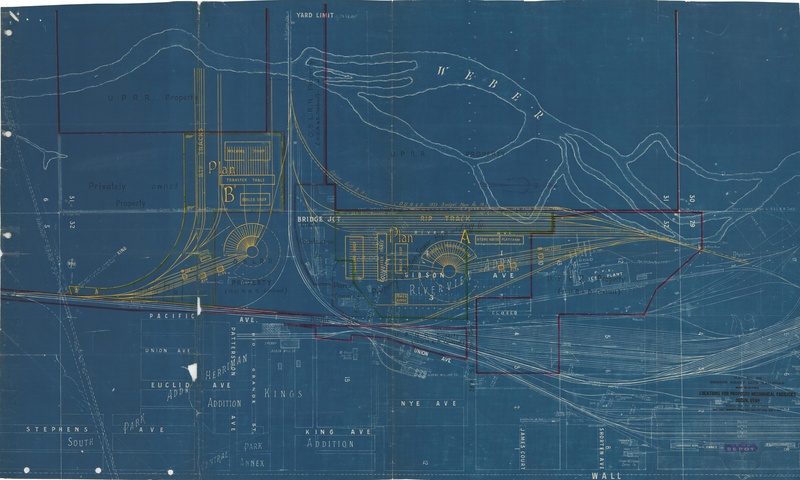 UP, Honeyville, 1949 -- (5.81 MB) (11.98 x 18.03) --- Shows the station tracks and buildings, including the depot. UP, Layton, Utah, 1959 -- (2.28 MB) (10.42 x 7.92) --- Shows the station tracks and buildings, including the depot. 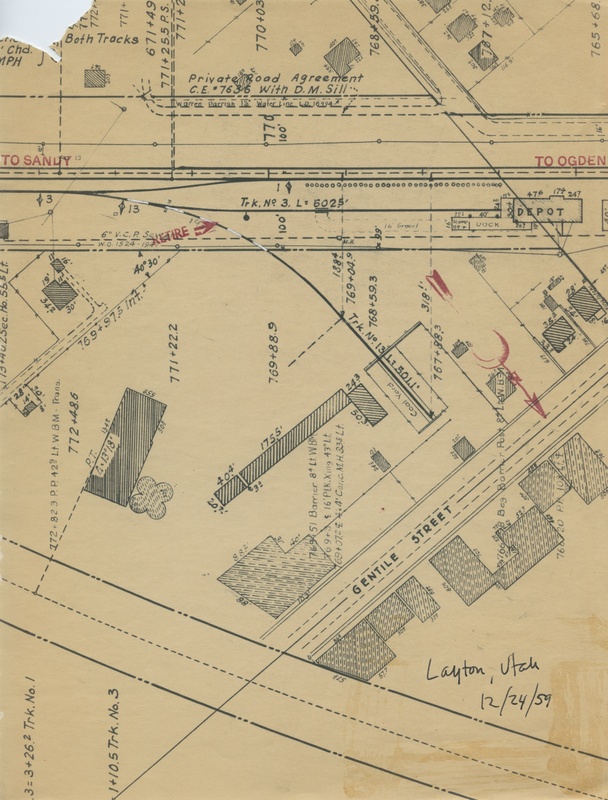 UP, Layton Utah -- (16.32 MB) (10.67 x 31.83) --- Shows the station tracks and buildings, including the depot. 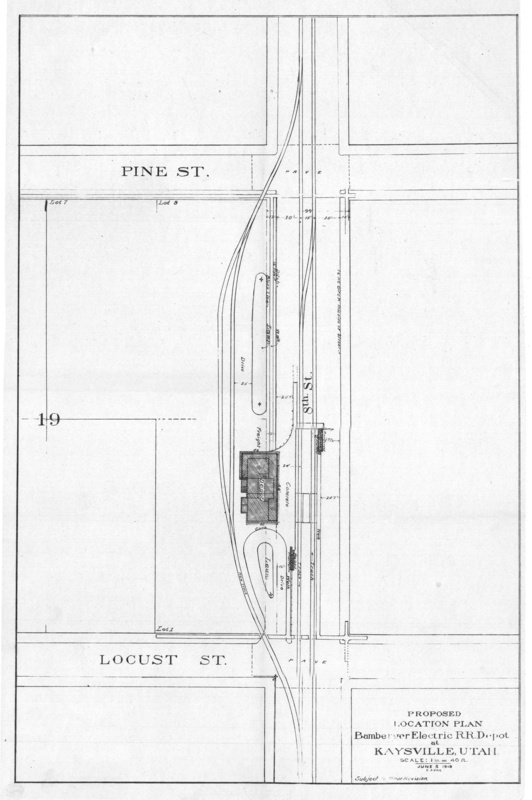 UP, Logan, 1949 -- (6.44 MB) (11.74 x 18.06) --- Shows the station tracks and buildings, including the depot. 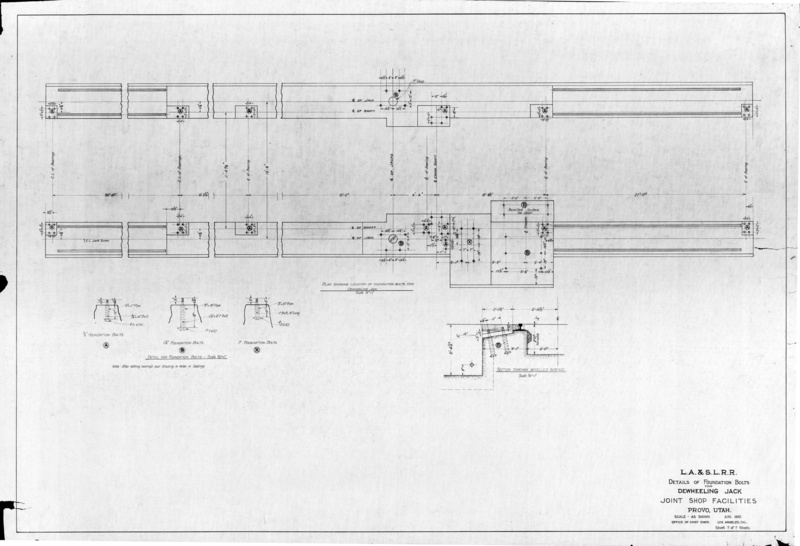 UP, Logan Sugar Spur, 1952 -- (3.45 MB) (10.3 x 7.92) --- Detail view of a small portion of the spur. 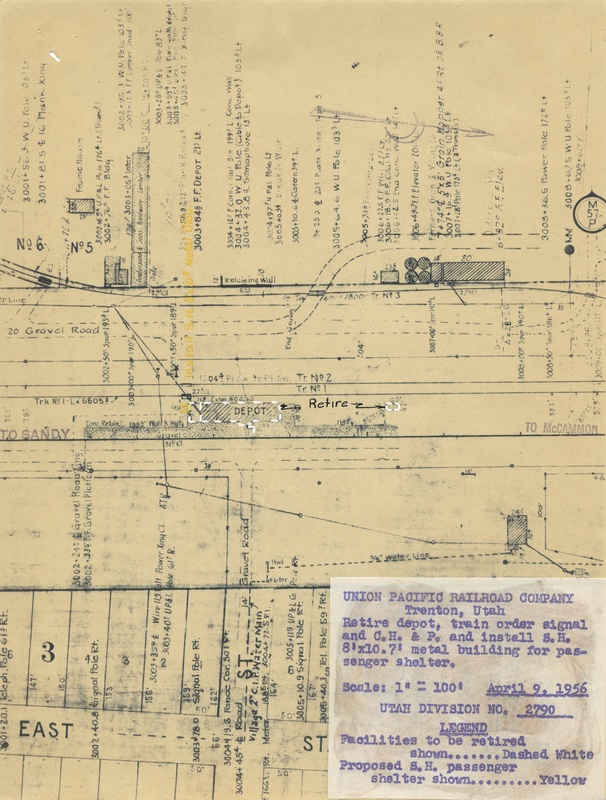 UP, Logan Utah, 1944 -- (17.08 MB) (10.62 x 32.21) --- Shows the station tracks and buildings, including the depot. 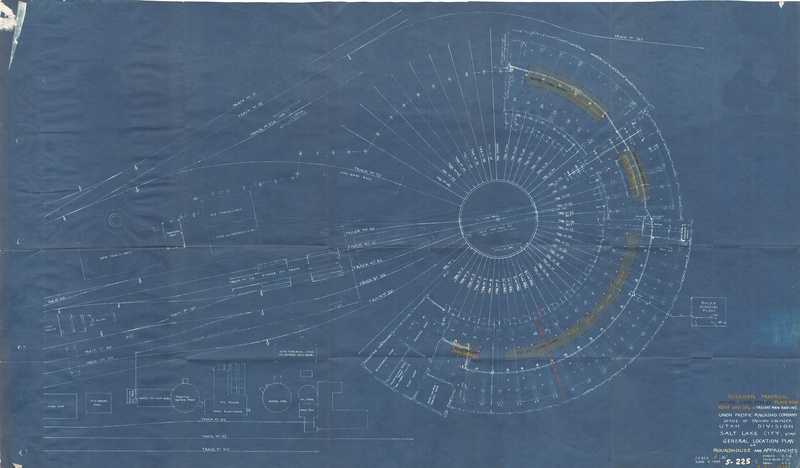 UP, Logan Utah, 1945 -- (16.71 MB) (10.74 x 33.51) --- Shows the station tracks and buildings, including the depot. 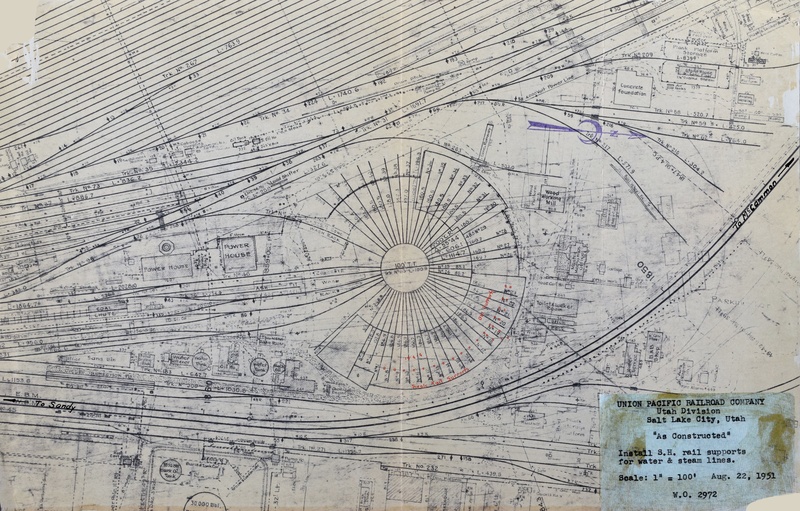 UP, Lynndyl, 1948 -- (51.08 MB) (11.03 x 95.46) --- Shows the station tracks and buildings, including the depot and the roundhouse. 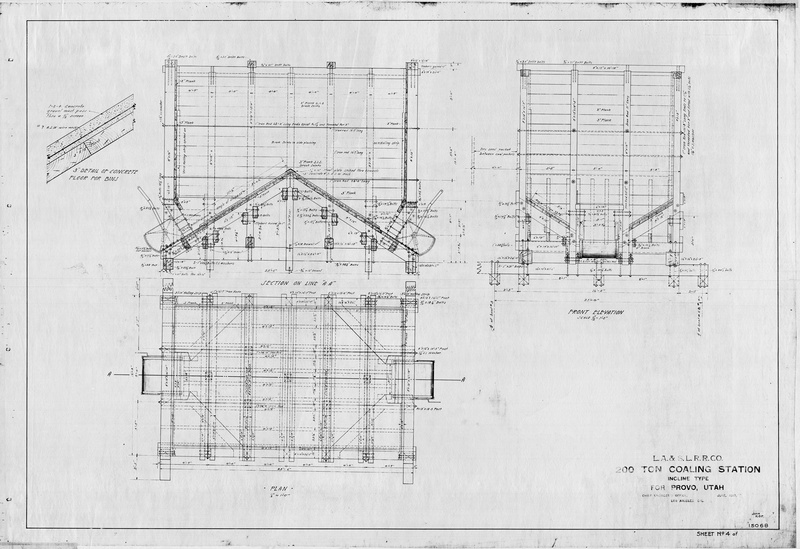 UP, Lynndyl roundhouse, 1951 -- (2.39 MB) (10.38 x 7.83) --- Shows the remaining portion of the roundhouse. 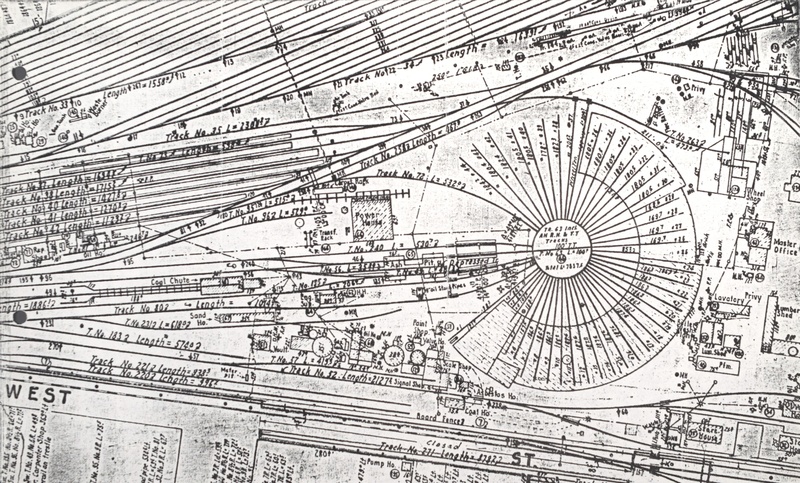 UP, Mammoth, 1909 -- (23.09 MB) (14.6 x 34.96) --- Shows the station tracks and buildings, including the depot. 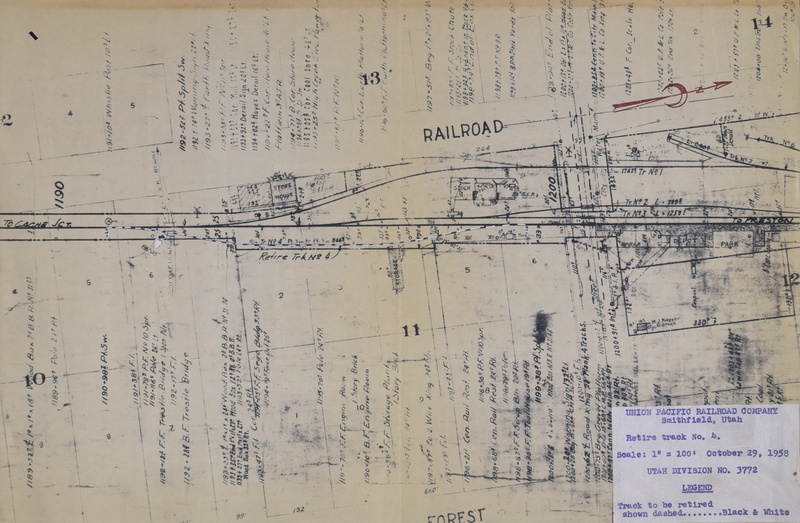 UP, Milford -- (19.05 MB) (10.68 x 34.18) --- Shows the station tracks and buildings, including the depot. 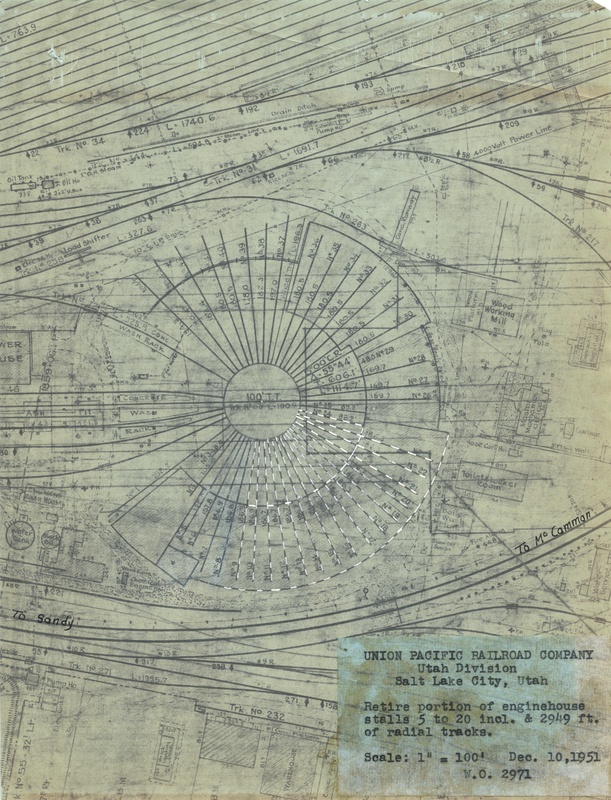 UP, Milford, 1943 -- (15.42 MB) (10.63 x 30.67) --- Shows the station tracks and buildings, including the roundhouse. 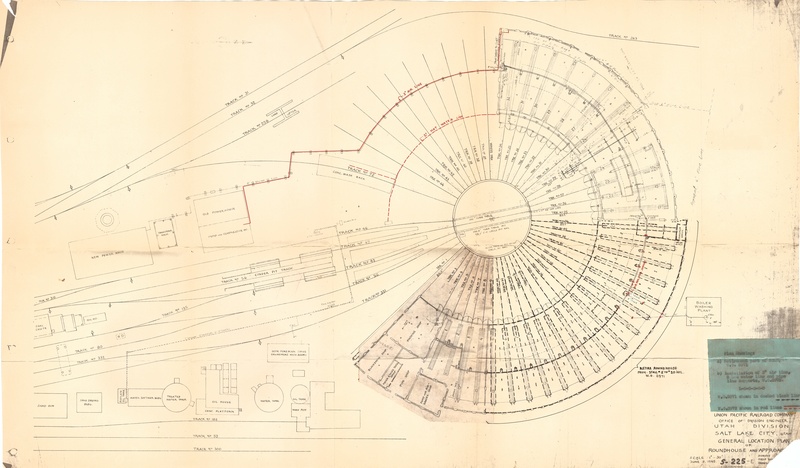 UP, Milford, shows roundhouse -- (16.46 MB) (14.61 x 38.2) --- Shows the station tracks and buildings, including the depot and the roundhouse. 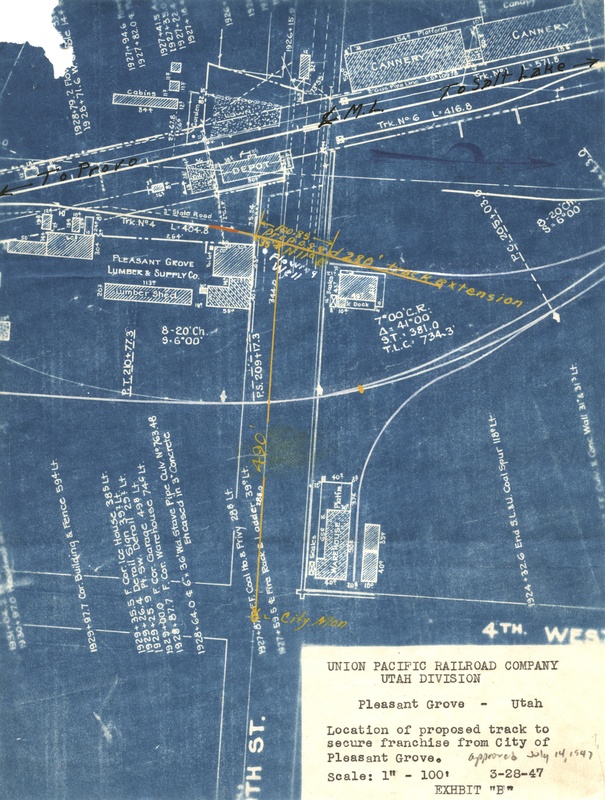 UP, Milford depot, 1948 -- (10.59 MB) (10.58 x 20.95) --- Shows the station tracks and buildings, including the depot. 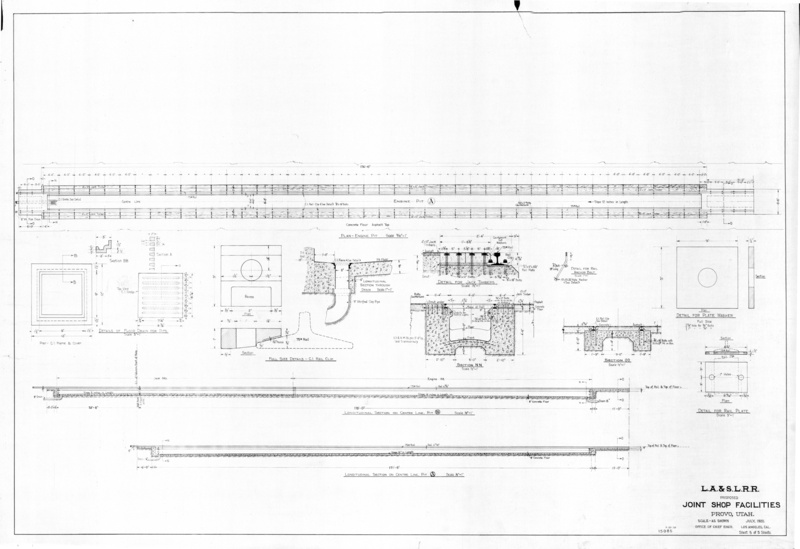 UP, Nephi, no date -- (10.39 MB) (10.56 x 20.81) --- Shows the station tracks and buildings, including the depot. 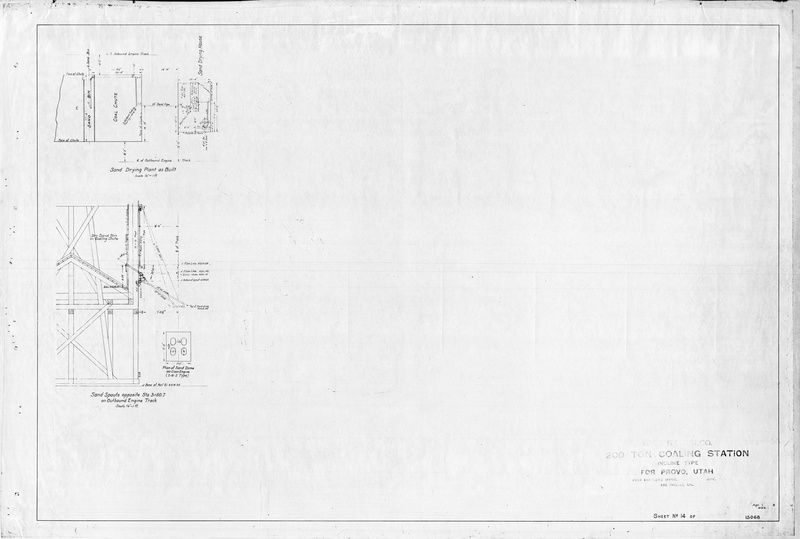 UP, Nephi Spur, 1948 -- (21.74 MB) (10.65 x 43.75) --- Shows the entire spur, as purchased from D&RGW. 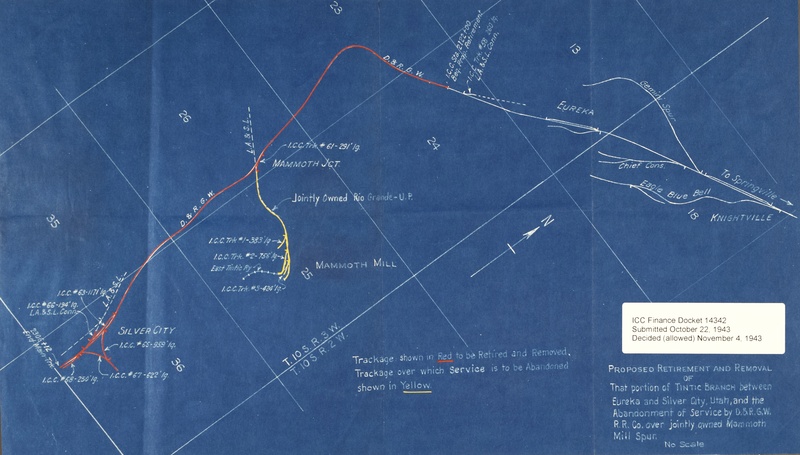 UP, New East Tintic Ry, 1913 -- (32.85 MB) (15.06 x 66.71) --- Shows the entire route, from Mammoth to the Mammoth mine. 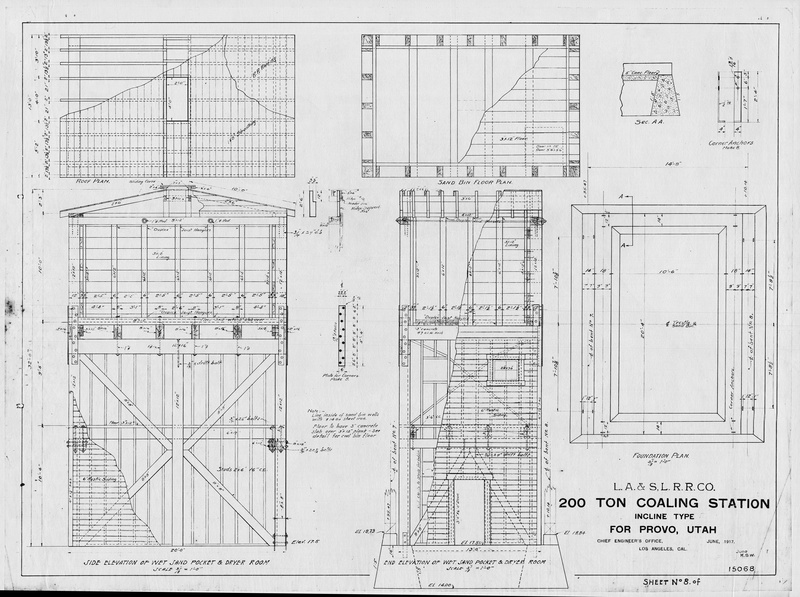 UP, North Salt Lake stock yards, 1947 -- (6.46 MB) (11.46 x 18.29) --- Shows a portion of the stockyards. 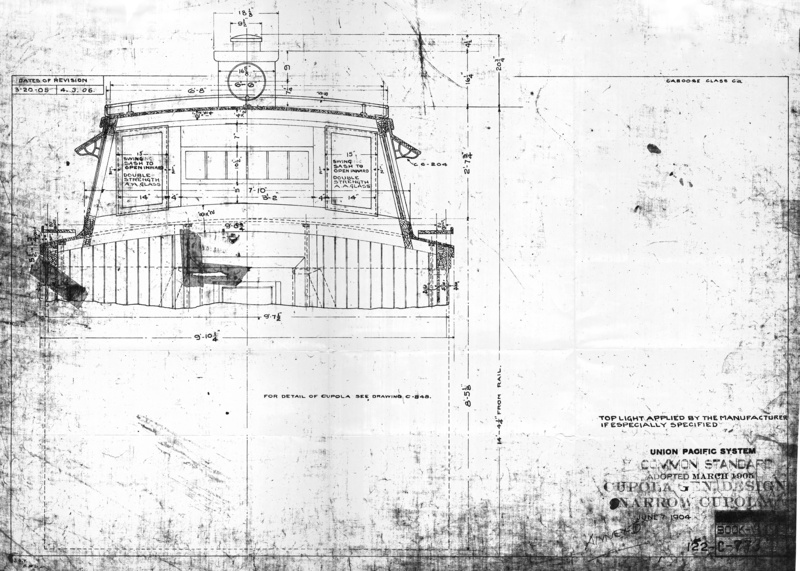 UP, Ogden, 1923, proposed roundhouse, 1 -- (148.70 MB) (35.55 x 86.78) --- Shows one of the early proposed locations for the Ogden roundhouse. 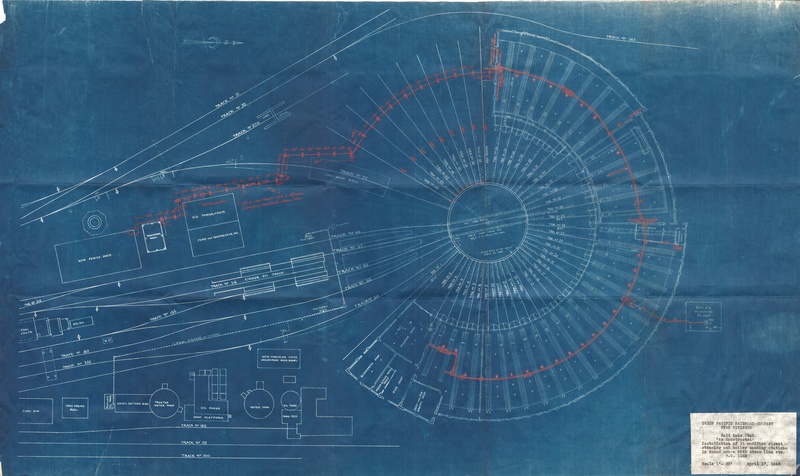 UP, Ogden, 1923, proposed roundhouse, 2 -- (4.97 MB) (13.44 x 22.39) --- Shows one of the early proposed locations for the Ogden roundhouse. 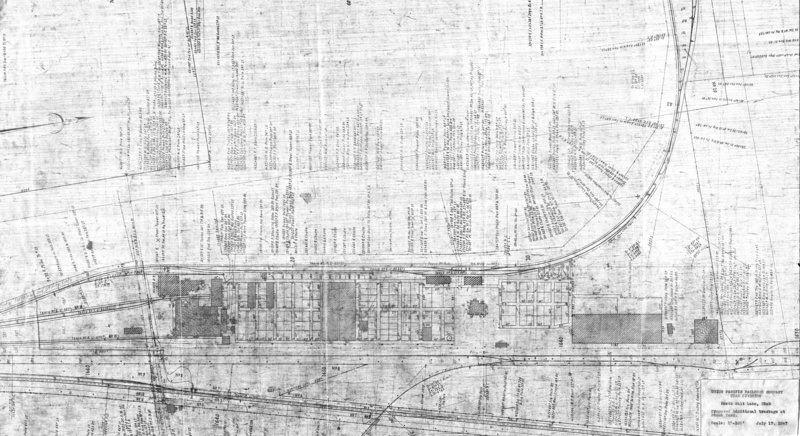 UP, Ogden, 1942 before Riverdale -- (66.99 MB) (26.1 x 86.37) --- Shows the entire Ogden yard, before "East Yard" (Riverdale) was built. 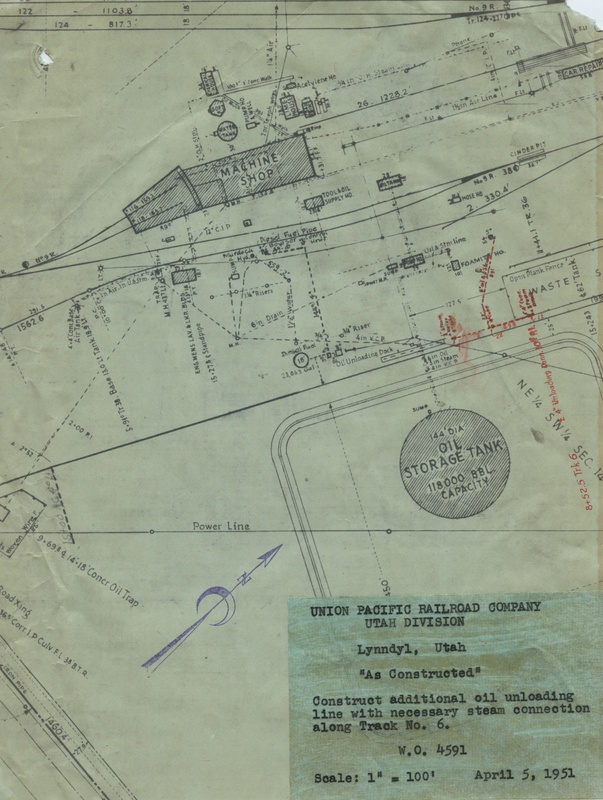 UP, Payson, 1941 -- (4.94 MB) (9.69 x 16.42) --- Shows the station tracks and buildings, including the depot. 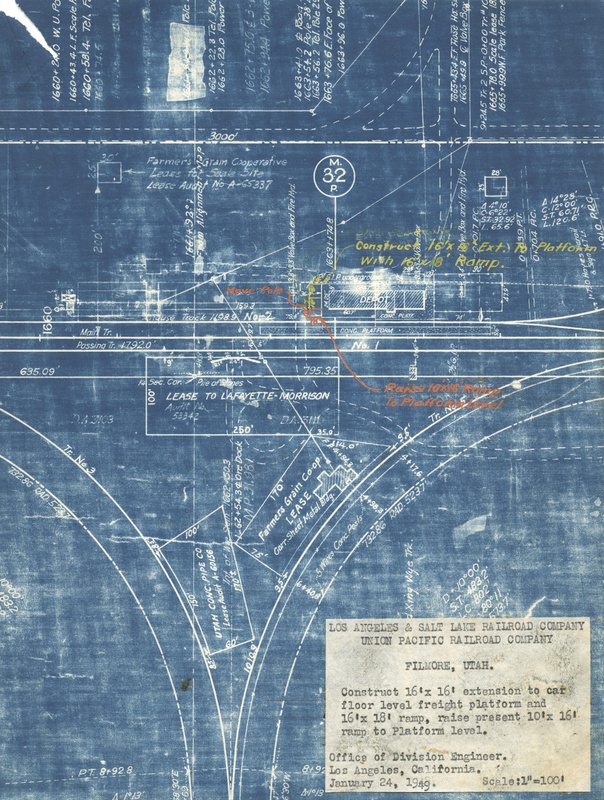 UP, Pleasant Grove, 1947 -- (3.16 MB) (10.39 x 7.86) --- Shows the station tracks and buildings, including the depot. 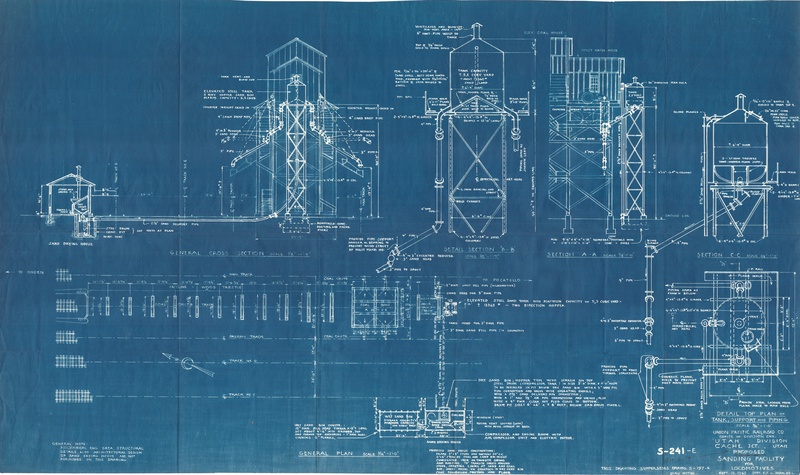 UP, Provo, Sanding Facilities, 1950 -- (19.52 MB) (18.82 x 29.63) --- Shows details of the sanding tower built at Provo. 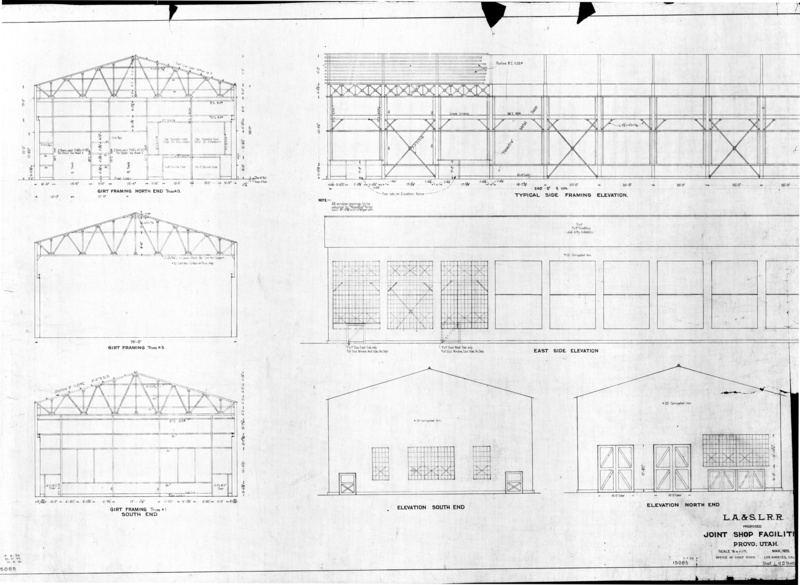 UP, Provo Joint Shop, Omaha Steel Works -- (11.13 MB) (16.08 x 24.11) --- Shows details of the steel components of the Provo Joint shop. 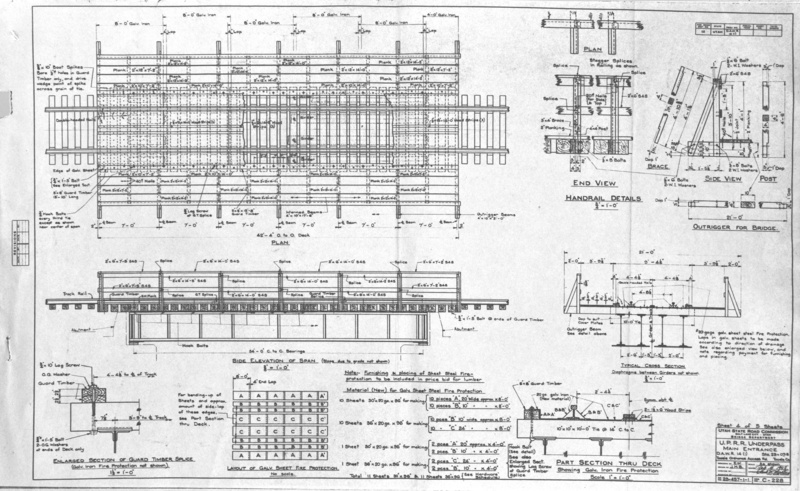 UP, Richmond, 1944 -- (5.96 MB) (10.03 x 18.84) --- Shows the station tracks and buildings, including the depot. 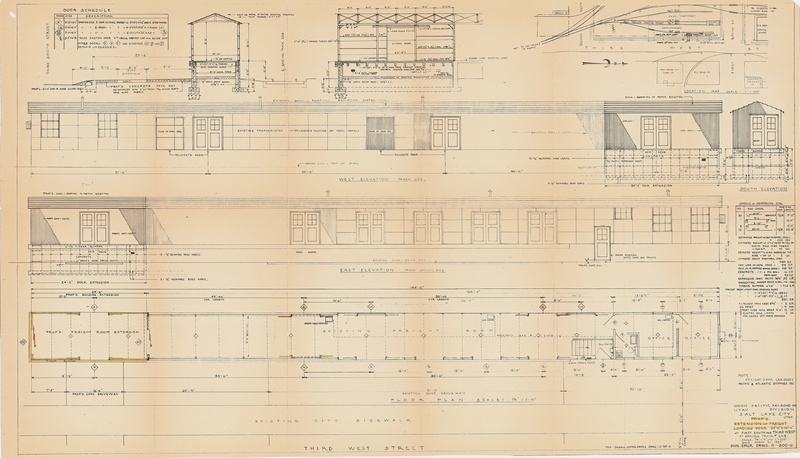 UP, Richmond, depot remodel, 1953 -- (4.84 MB) (9.55 x 19.31) --- Shows the station tracks and buildings, including details of the depot remodel. 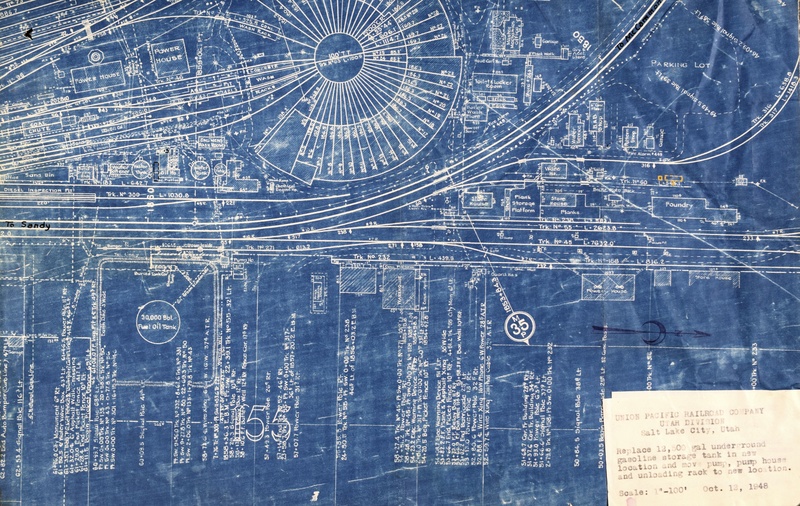 UP, Salt Lake City, Coach Yard, 1946 -- (3.08 MB) (10.46 x 8.03) --- Shows the track layout of the Salt Lake City coach yard. 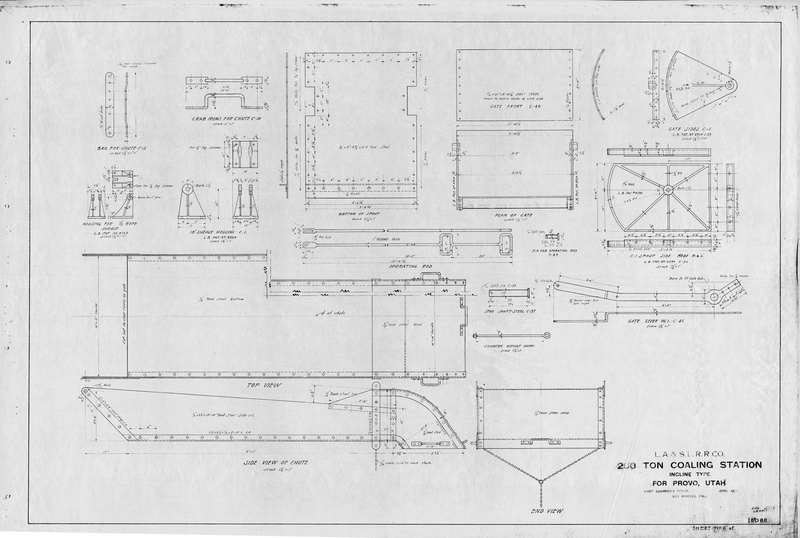 UP, Salt Lake City, coach yard and RIP track, no date -- (16.78 MB) (10.7 x 33.79) --- Shows the track layout of the Salt Lake City coach yard, and the RIP (Repair-In-Place) tracks. 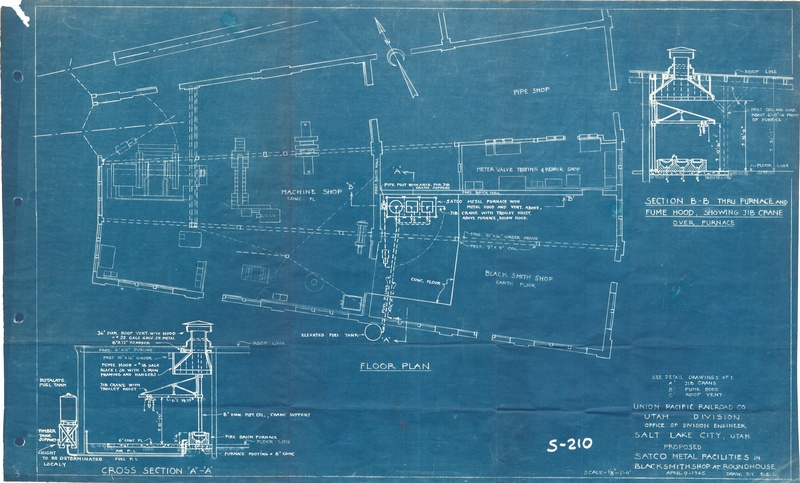 UP, Salt Lake City, Foundry, 1948 -- (8.97 MB) (12.03 x 19.01) --- Track and building layout of the original foundary building, located northeast of the roundhouse. 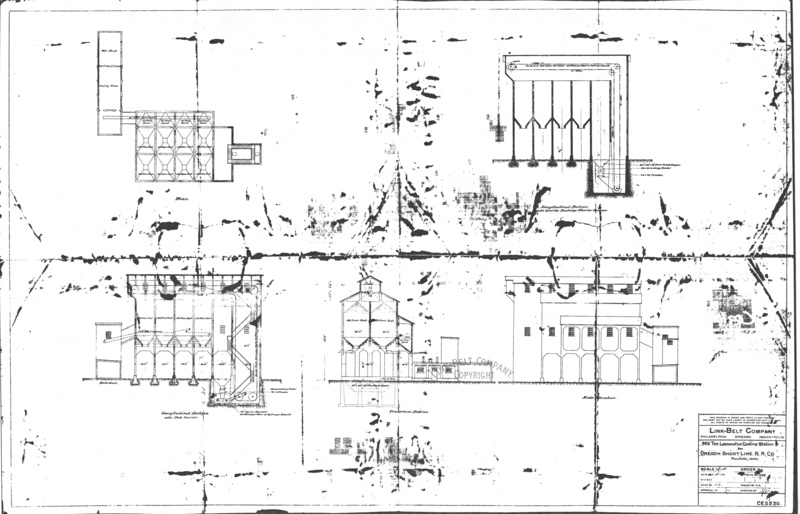 UP, Salt Lake City, Foundry Building 1945 -- (45.63 MB) (23.84 x 34.85) --- Plan and elevation of the original foundary building, located northeast of the roundhouse. 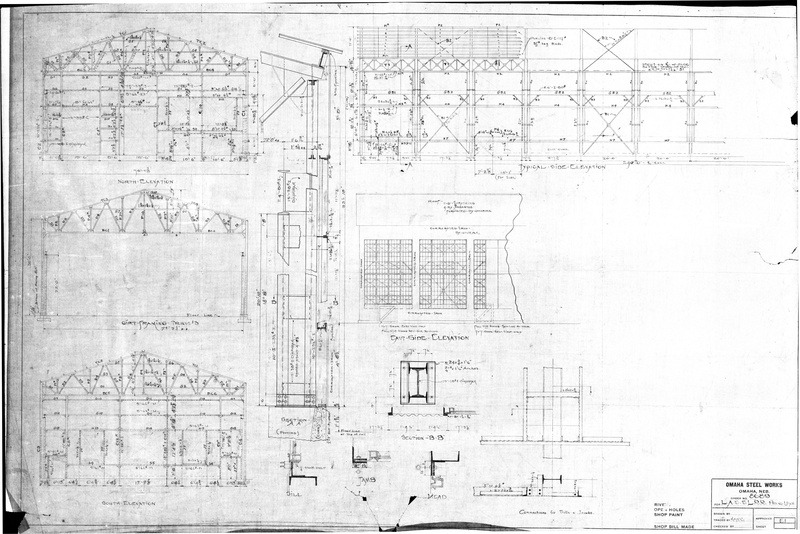 UP, Salt Lake City, Freight Loading Dock Extension, 1957 -- (29.90 MB) (24.05 x 42.04) --- Plan and elevation of the small transfer building at 1st South and 3rd West. 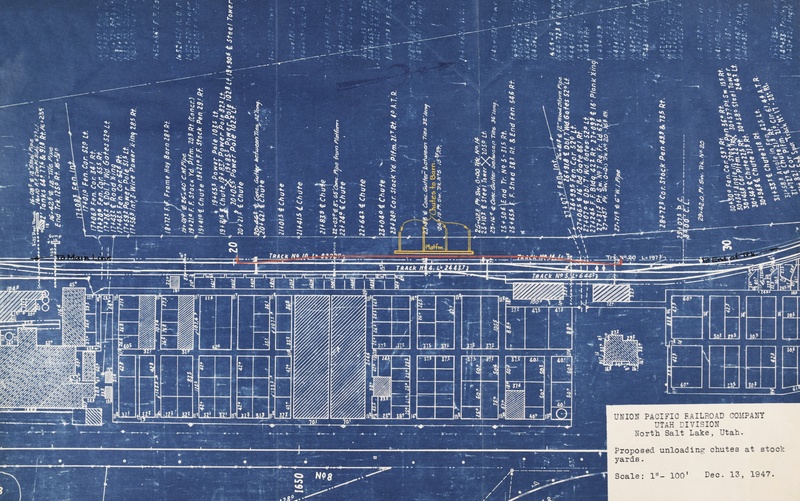 UP, Salt Lake City, new PFE ice dock, 1944 December -- (16.23 MB) (10.6 x 32.27) --- Shows track layout and buildings between First North and Fourth North. 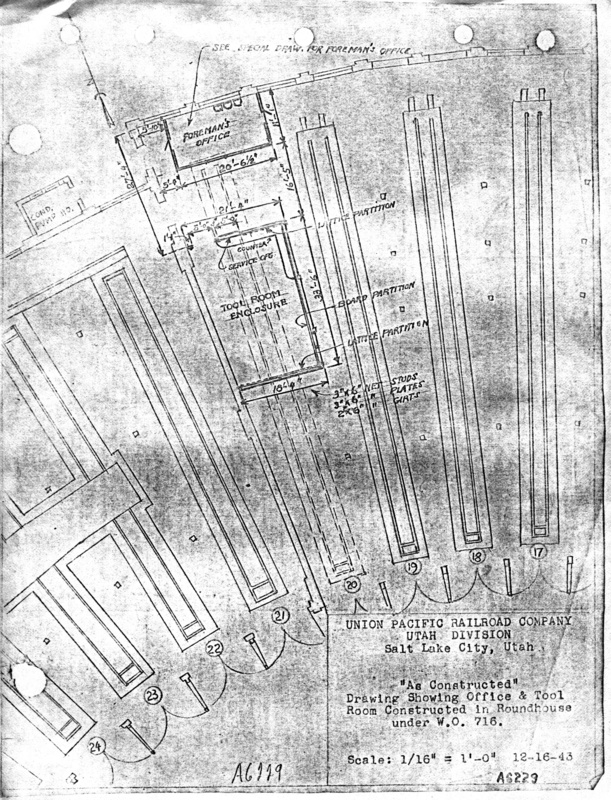 UP, Salt Lake City, Salvage Building, 1949 -- (2.99 MB) (10.47 x 7.9) --- Shows track and building layout, southwest of the Salt Lake City depot. 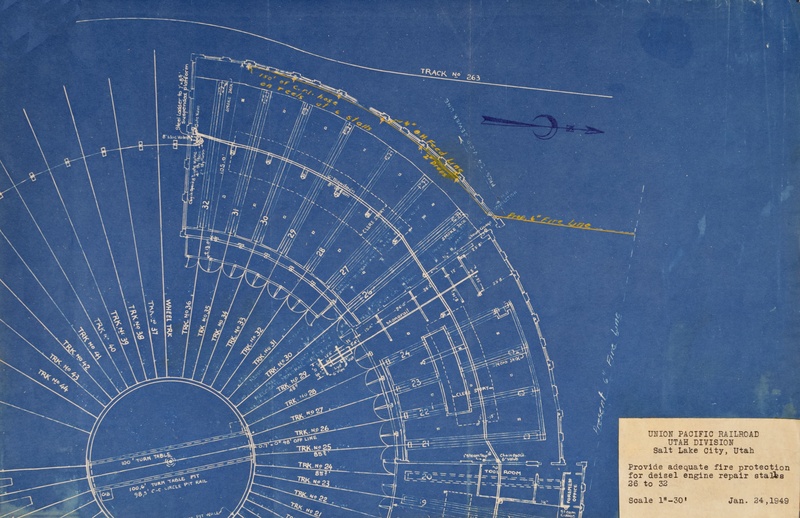 UP, Salt Lake City, shows roundhouse, Bamberger as D&RGW -- (95.41 MB) (27.82 x 114.47) --- Shows all tracks between 13th South and the Davis County line, after Bamberger had been removed. 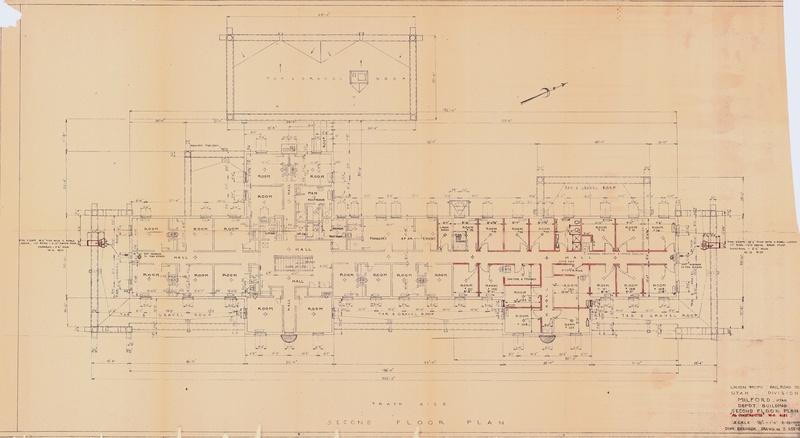 UP, Salt Lake City, Yard Office Building, 1952 -- (41.90 MB) (24.41 x 35.95) --- Plan and elevation of new yard office. 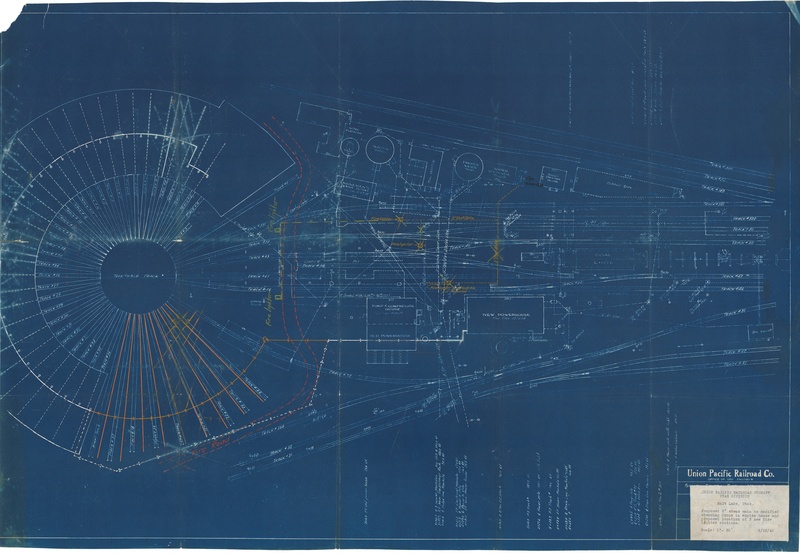 UP, Salt Lake City Passenger Yard, 1968 -- (21.86 MB) (10.8 x 45.57) --- Shows track layout of tracks west of south yard tower. 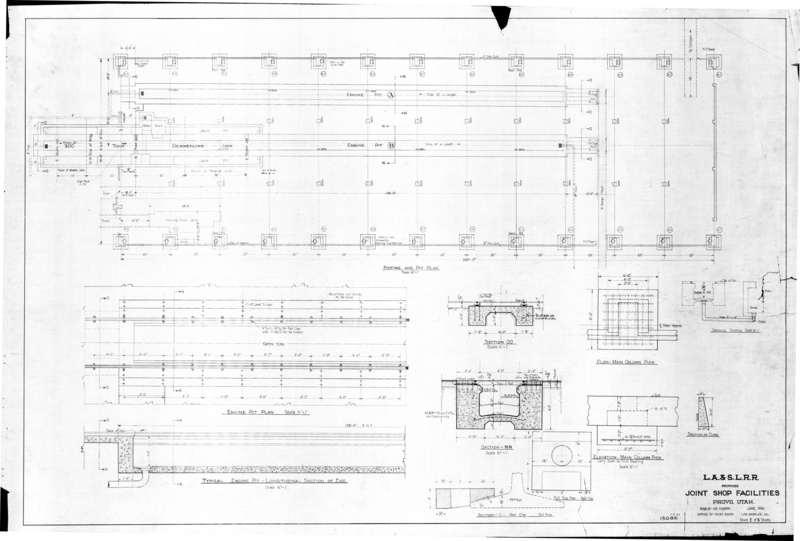 UP, Salt Lake City roundhouse, 1945 March, steam main 1 -- (33.46 MB) (24.12 x 34.21) --- Shows area surrounding roundhouse. 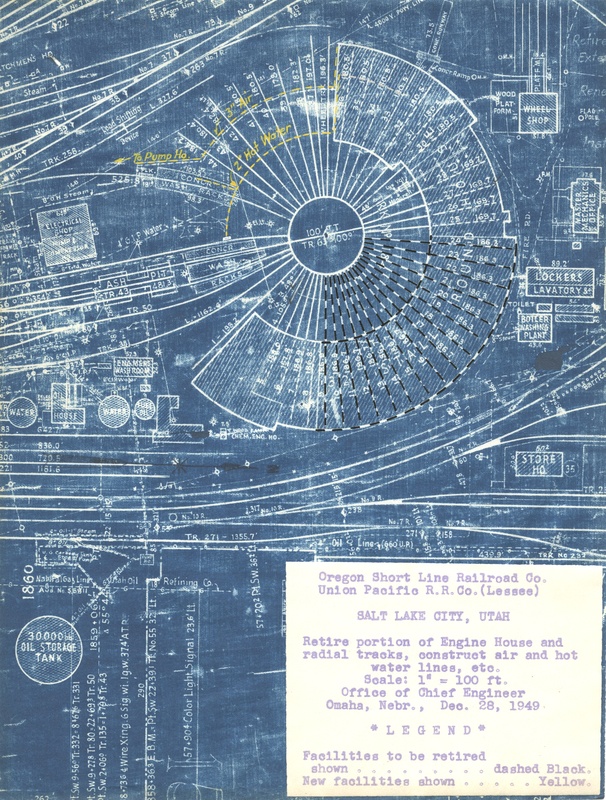 UP, Salt Lake City roundhouse, 1945 March, steam main 2 -- (35.04 MB) (24.32 x 35.18) --- Shows area surrounding roundhouse. 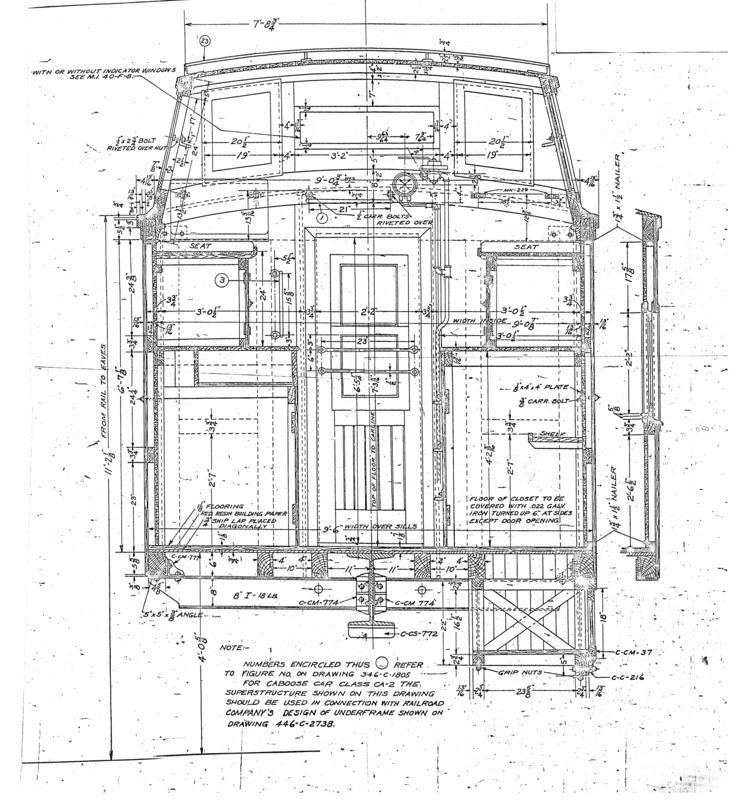 UP, Salt Lake City roundhouse, 1945 March, steam main 3 -- (34.49 MB) (24.11 x 35.23) --- Shows area surrounding roundhouse. 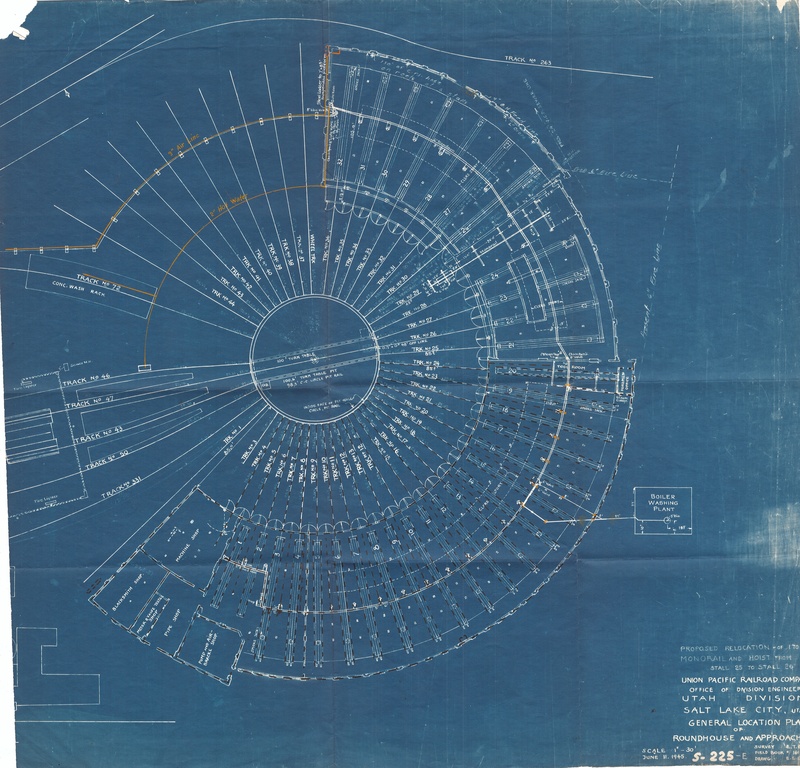 UP, Salt Lake City roundhouse, 1946, steaming system -- (26.54 MB) (19.89 x 33.41) --- Shows area surrounding roundhouse. 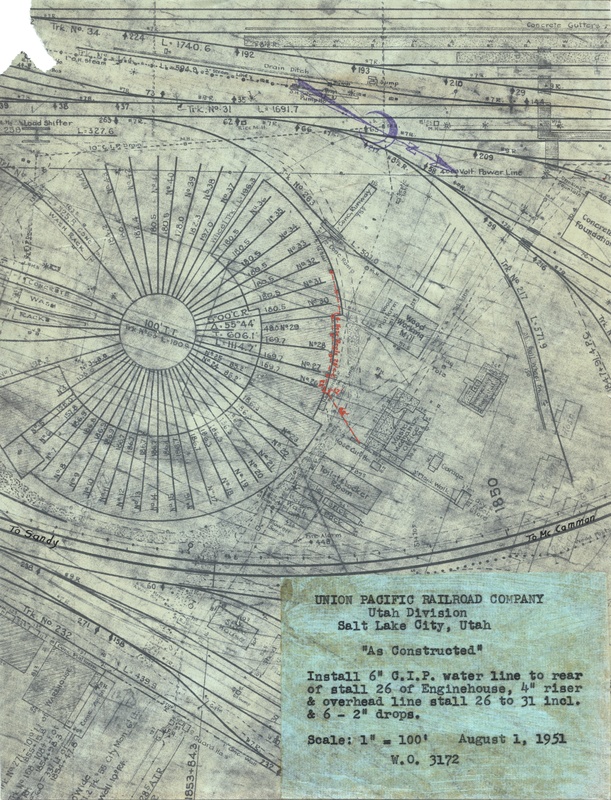 UP, Salt Lake City roundhouse, 1949, water line -- (3.54 MB) (10.47 x 7.99) --- Shows area surrounding roundhouse. 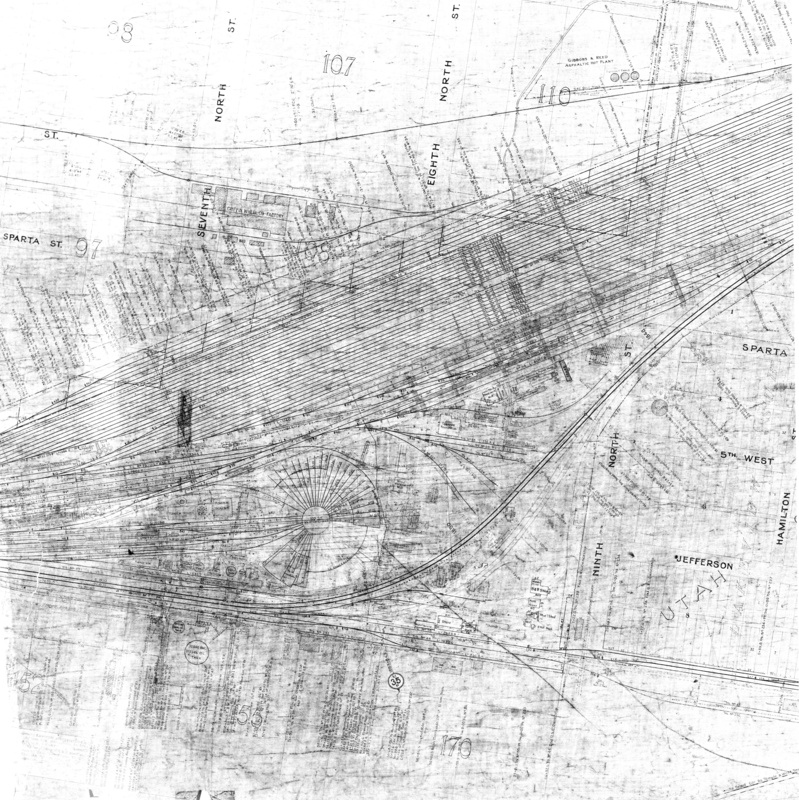 UP, Sandy -- (4.45 MB) (16.23 x 17.69) --- Shows the station tracks and buildings, including the depot. 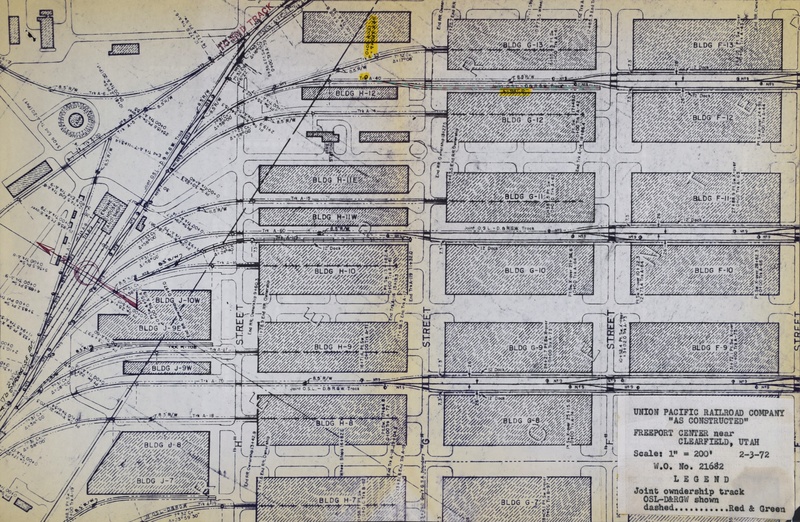 UP, Sandy, 1945 -- (3.19 MB) (10.75 x 8.07) --- Shows the station tracks and buildings, including the depot. 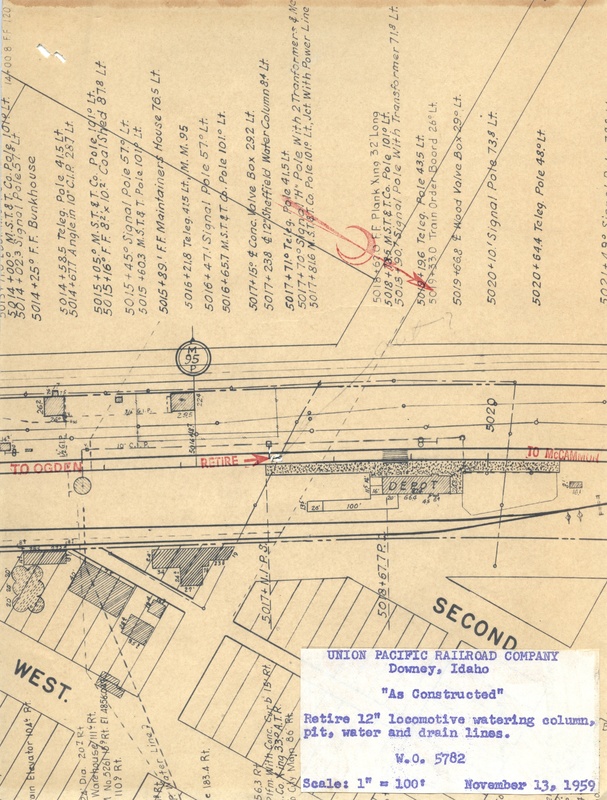 UP, Smithfield, 1958 -- (5.42 MB) (11.84 x 18.12) --- Shows the station tracks and buildings, including the depot. 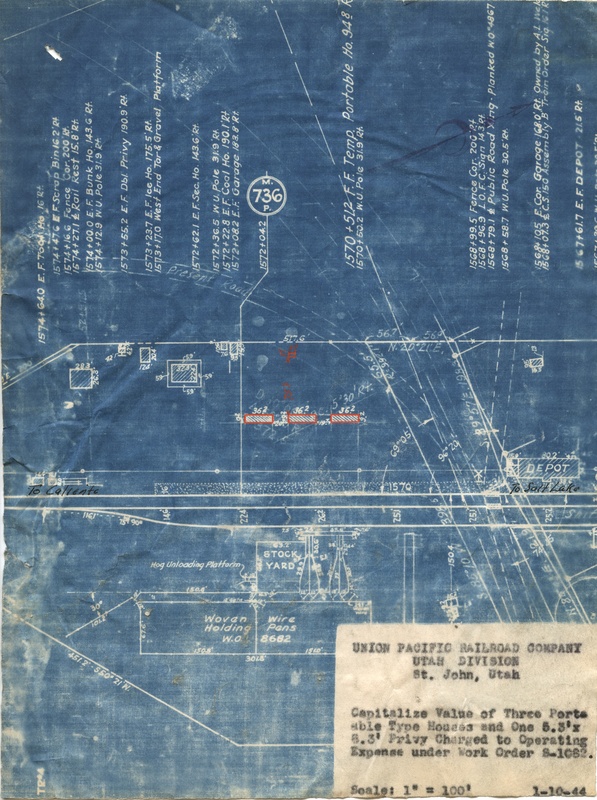 UP, Spanish Fork, 1944 -- (43.88 MB) (21.51 x 75.35) --- Shows the station tracks and buildings, including the depot. 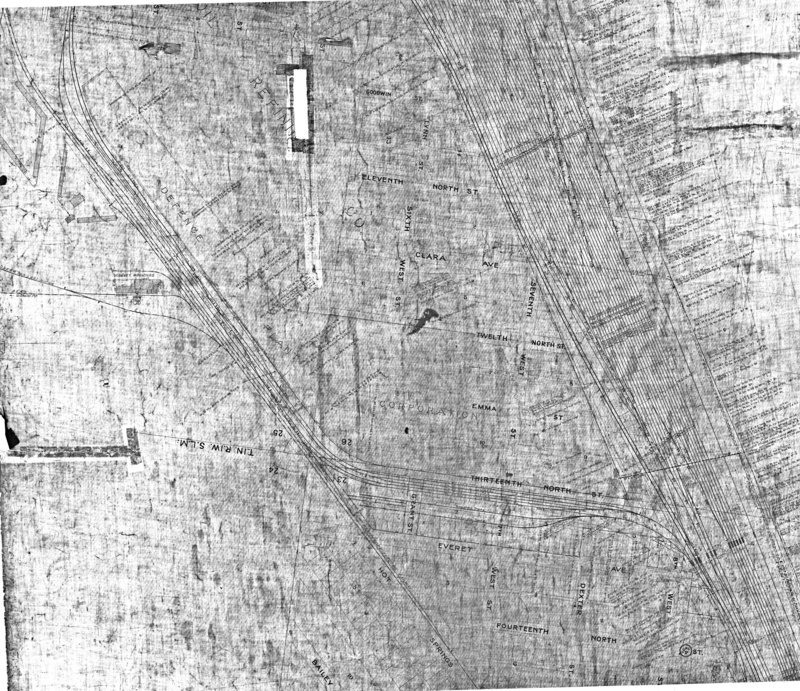 UP, St John, 1944 -- (2.97 MB) (10.42 x 7.78) --- Shows the station tracks and buildings, including the depot. UP, Stockton, 1948 March -- (10.56 MB) (10.66 x 19.9) --- Shows the station tracks and buildings, including the depot. 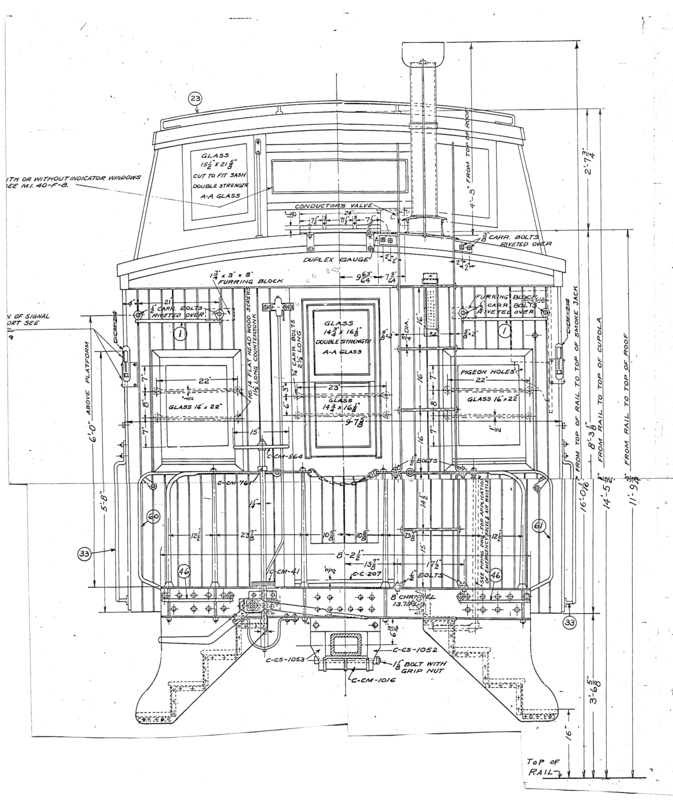 UP, Thatcher Branch retirement -- (3.35 MB) (10.98 x 8.08) --- Shows portion to be retired. 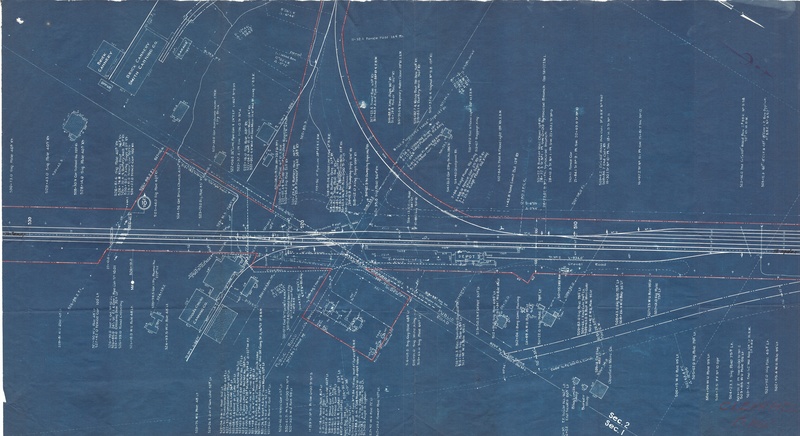 UP, Tintic Jct, 1951 -- (4.49 MB) (23.77 x 21.66) --- Shows the station tracks and buildings, including the depot. 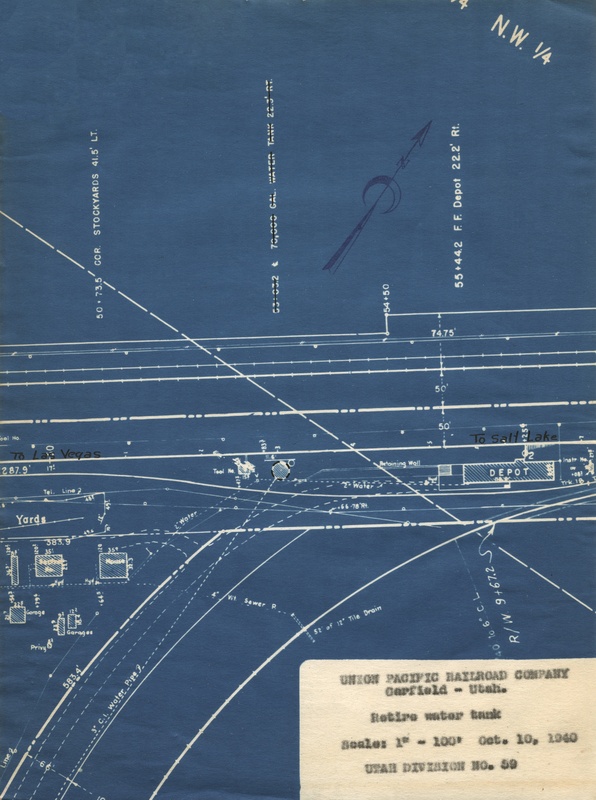 UP, Topliff Branches 1928 -- (4.07 MB) (8.95 x 10) --- Shows track layout serving the limestone quarries. 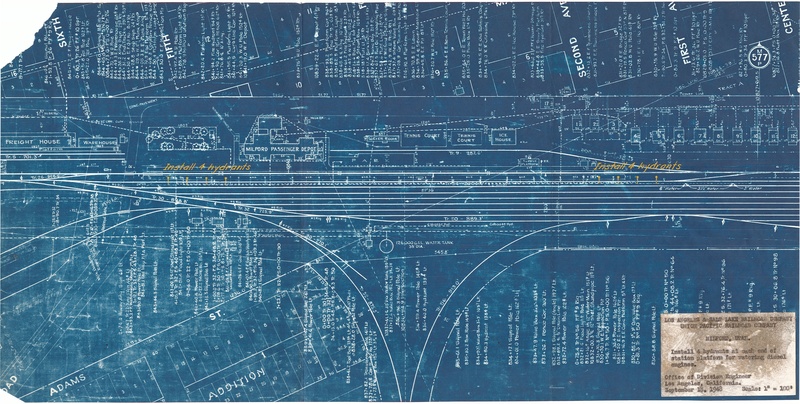 UP, Trenton, 1956 -- (2.54 MB) (10.45 x 7.91) --- Shows the station tracks and buildings, including the depot. 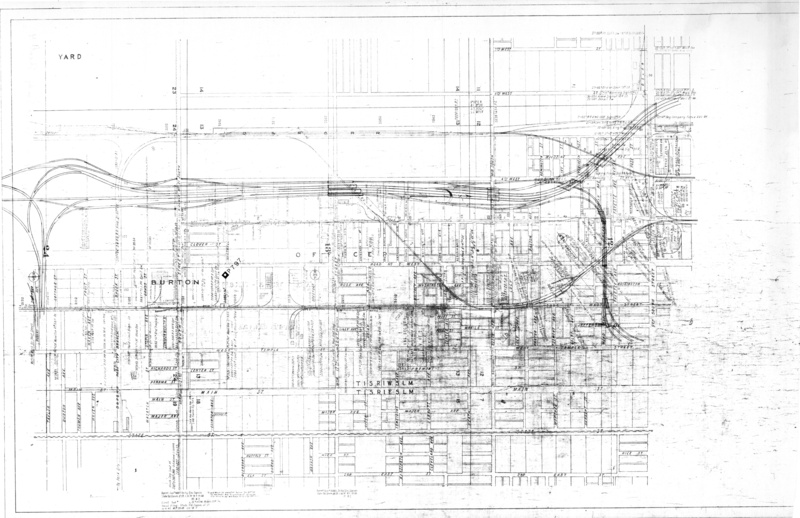 UP, Trenton, 1957 -- (3.20 MB) (10.39 x 7.91) --- Shows the station tracks and buildings, including the depot. UP, Warner, 1942 May -- (11.31 MB) (10.68 x 23.43) --- Shows the station tracks and buildings, including the depot. 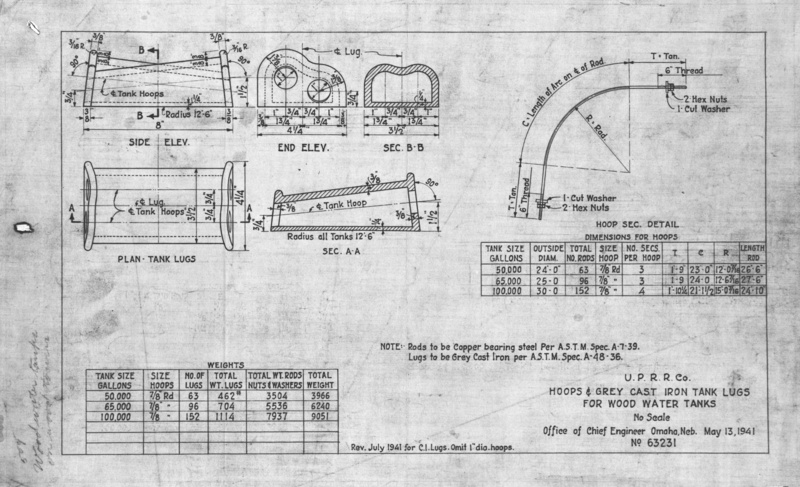 UP, Water Tank hoop lugs, 1941 -- (5.72 MB) (11.05 x 18.15) --- Detail view of components. 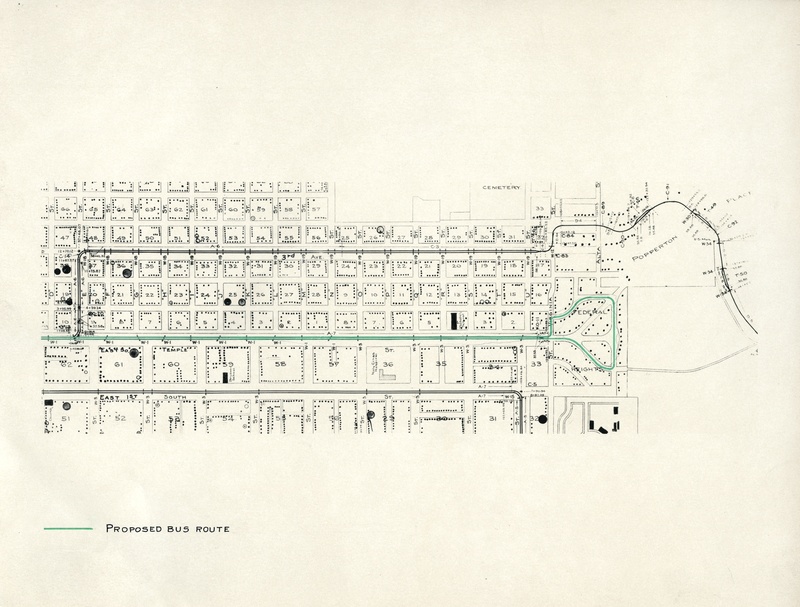 UP, Weston Idaho, 1951 -- (4.60 MB) (11.05 x 17.32) --- Shows the station tracks and buildings, including the depot. 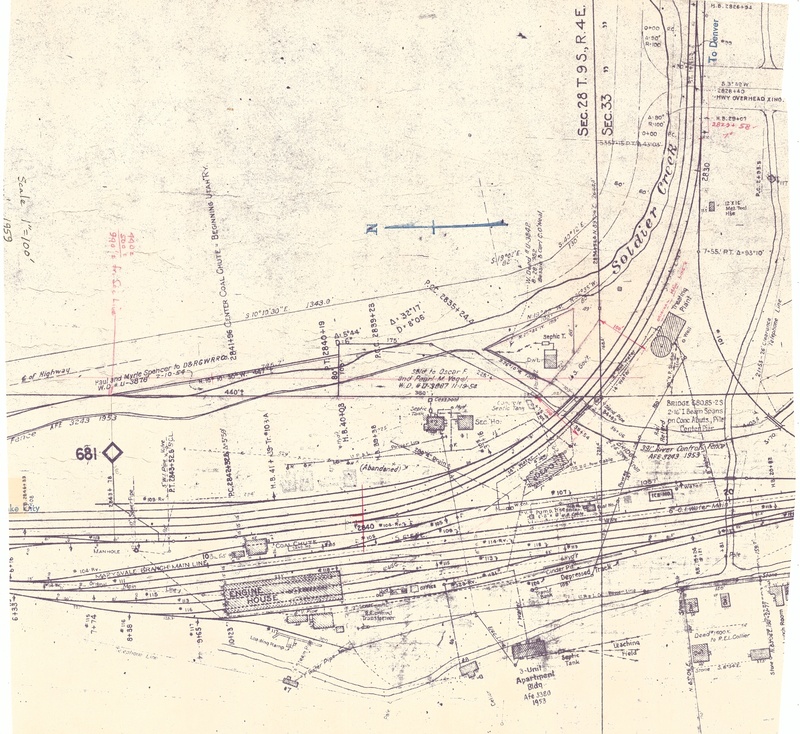 UP-Bamberger Salt Lake City interchange -- (31.78 MB) (21.6 x 25.03) --- Shows original interchange tracks at 1300 North. 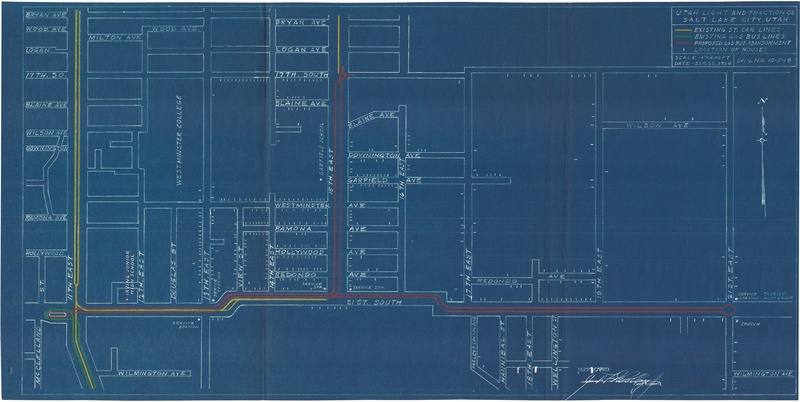 Utah Idaho Central, North Ogden Line -- (5.27 MB) (15.24 x 12.1) --- Shows the original line along the north end of Washington Boulevard, to North Ogden. 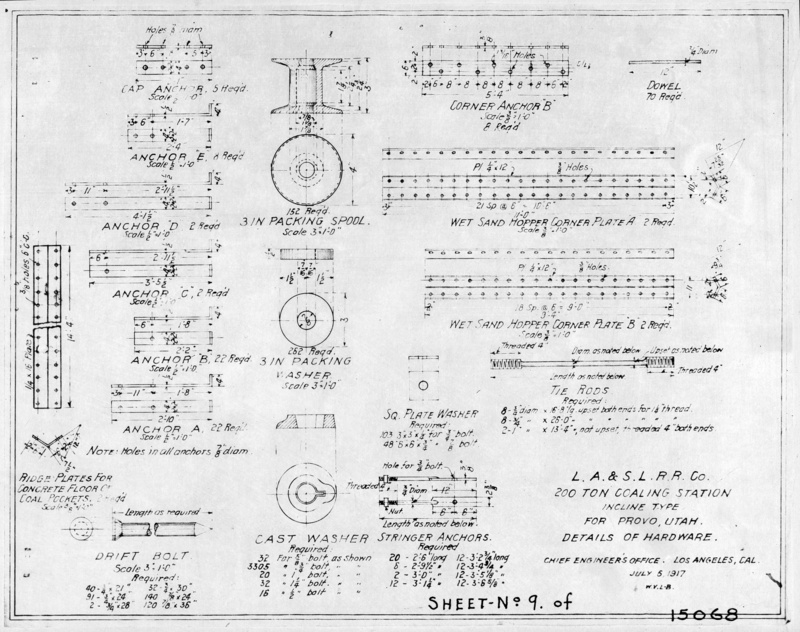 Utah Idaho Central, Ogden shops -- (67.96 MB) (27.52 x 51.39) --- Shows the track and building layout of the shop area. 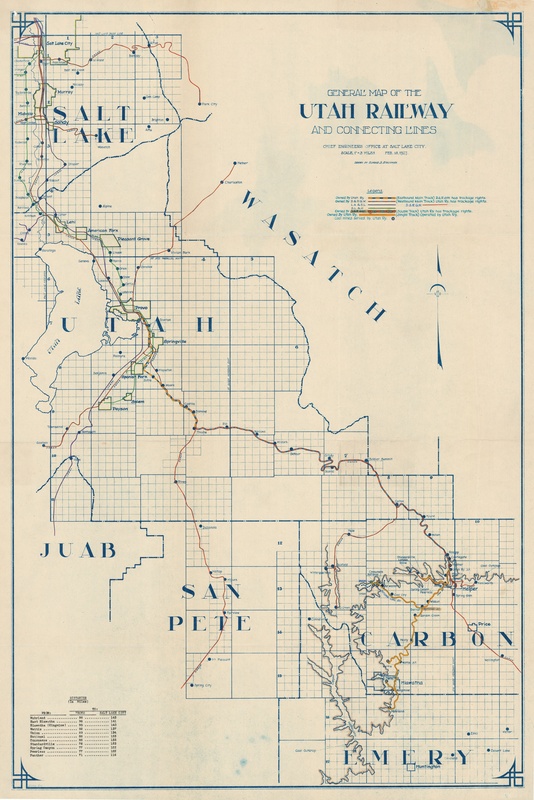 Utah Railway, January 1919 -- (11.34 MB) (23.26 x 11.42) --- Shows the entire route in 1919, south from Martin. 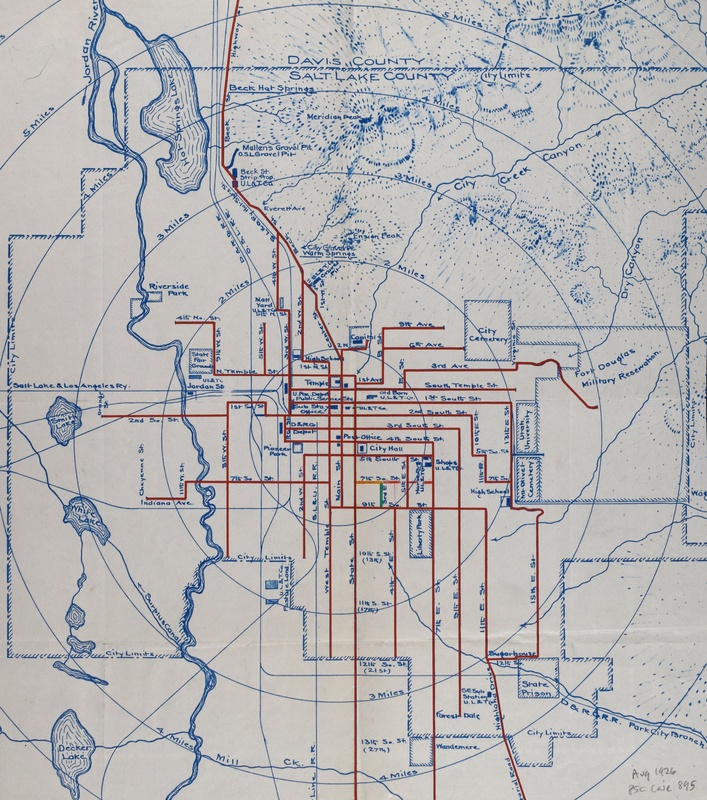 Utah Railway and connecting lines, 1927 -- (26.15 MB) (35.91 x 23.96) --- Shows the entire route, Mohrland to Salt Lake City. 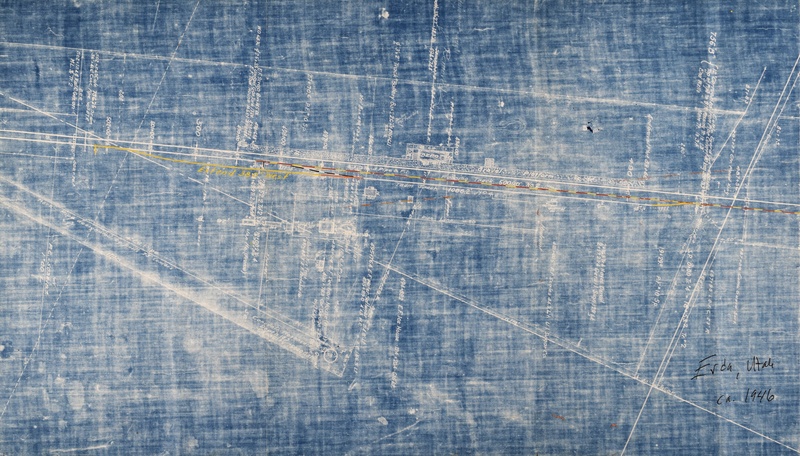 Utah Ry, 1919, sheet 1 -- (16.95 MB) (16.32 x 38.22) --- Mohrland to Hiawatha. 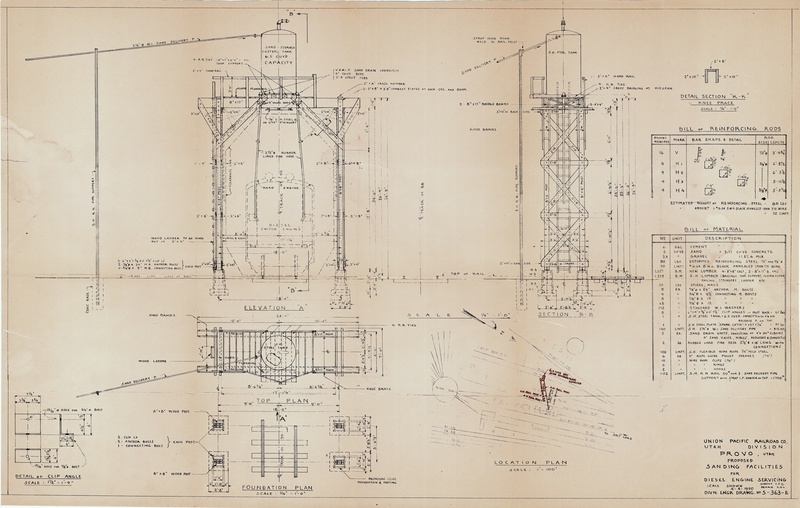 Utah Ry, 1919, sheet 2 -- (23.85 MB) (16.29 x 38.46) --- Hiawatha northward, Mile Posts 22 to 19. 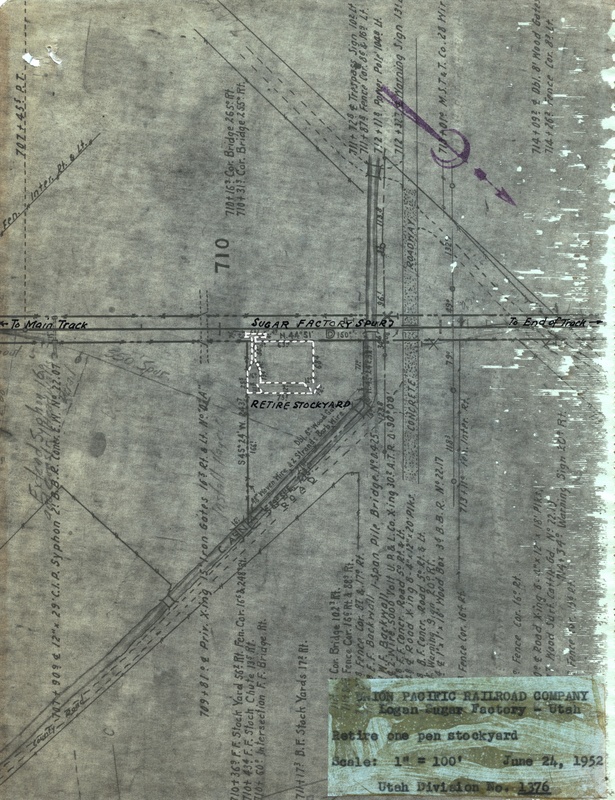 Utah Ry, 1919, sheet 3 -- (16.68 MB) (16.45 x 38.15) --- Mile Posts 19 to 15, including Wattis Junction. 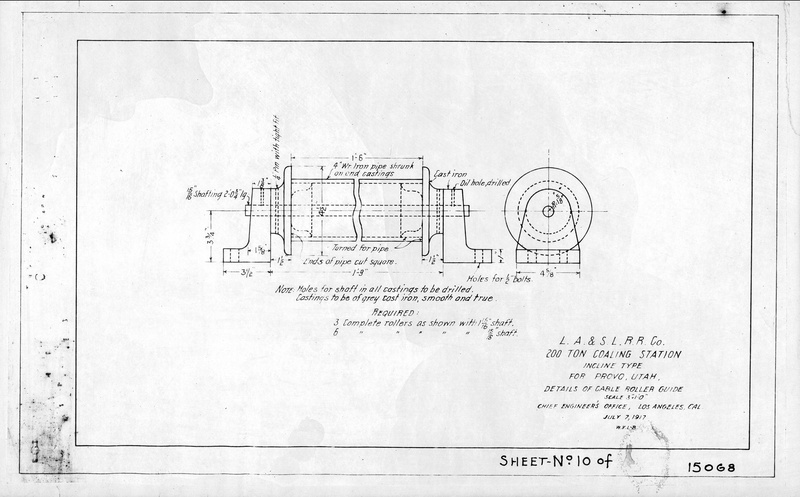 Utah Ry, 1919, sheet 4 -- (7.78 MB) (16.21 x 38.26) --- Mile Posts 15 to 11. 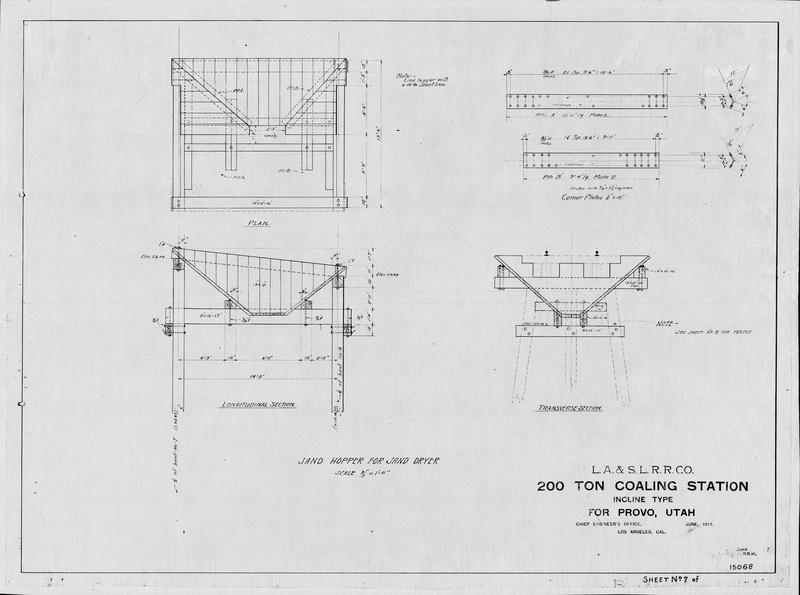 Utah Ry, 1919, sheet 5 -- (8.53 MB) (16.32 x 38.54) --- Mile Posts 11 to 7, including Gordon Creek bridge and National Junction. 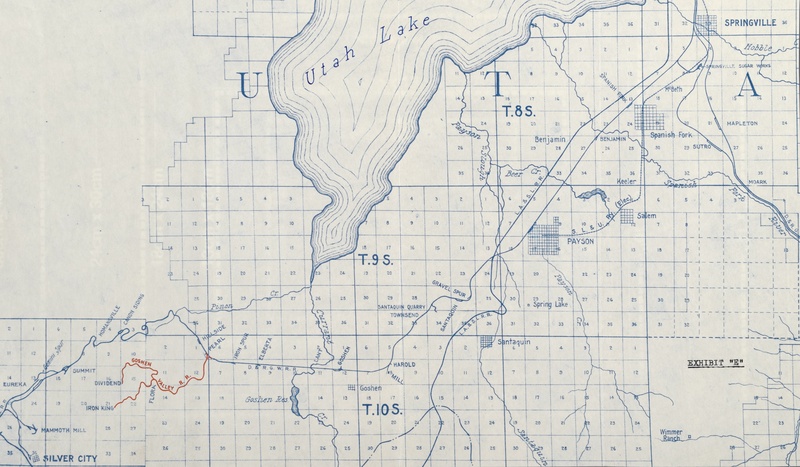 Utah Ry, 1919, sheet 6 -- (9.92 MB) (16.39 x 38.53) --- Mile Posts 7 to 3, including Wild Cat. 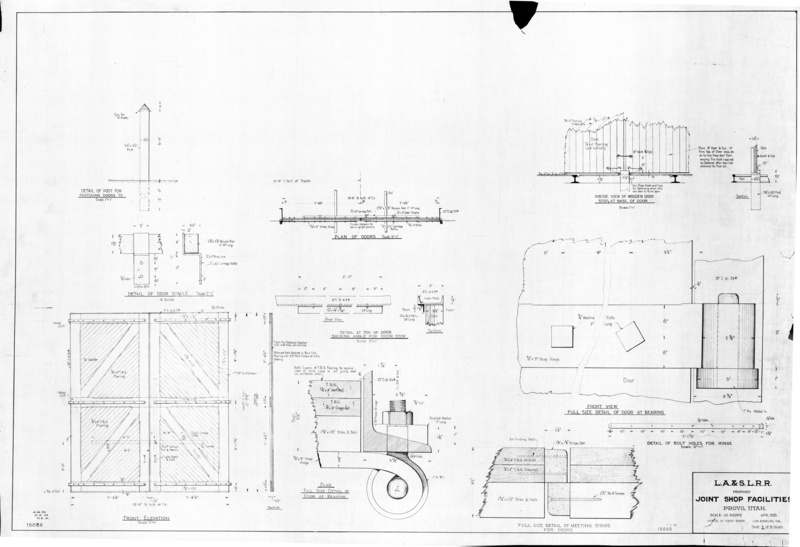 Utah Ry, 1919, sheet 7 -- (21.41 MB) (16.24 x 38.36) --- Mile Posts 3 to 0, including Martin, Utah Railway Junction, and Panther yard. 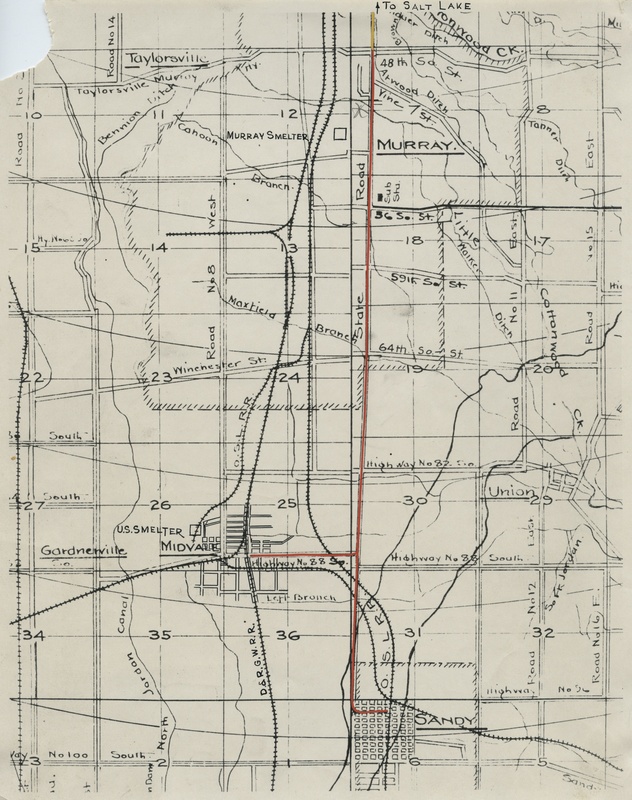 Utah Ry, SURR, CVRR, ca 1920 -- (112.84 MB) (32.61 x 63.26) --- Shows entire route, Castle Gate to Mohrland, and abandoned SURR and CVRR between Price and Hiawatha and Mohrland. 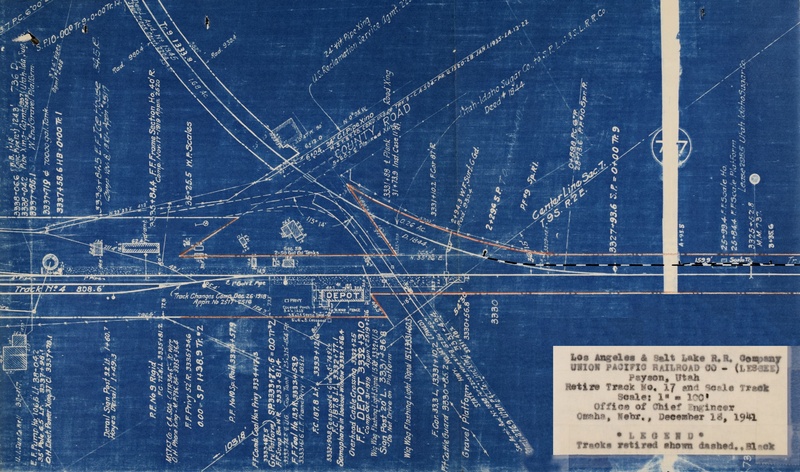 Utah Terminal Ry, 1920 -- (28.71 MB) (19.38 x 66.45 --- Shows entire route in Spring Canyon.